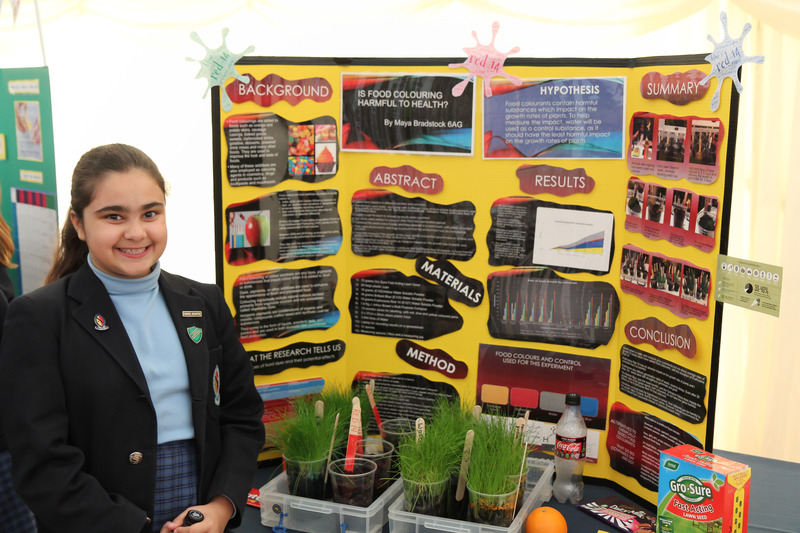 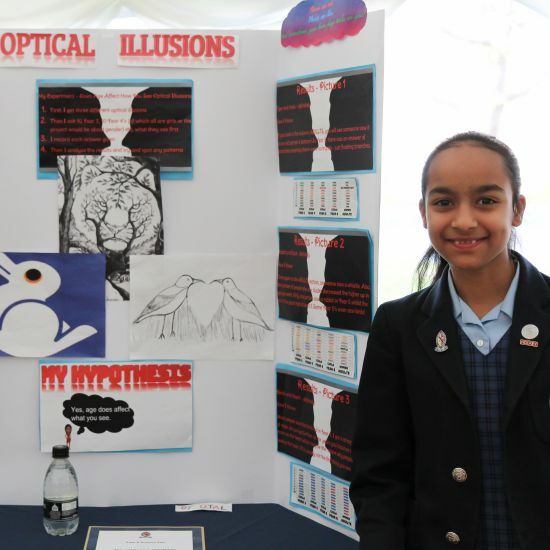 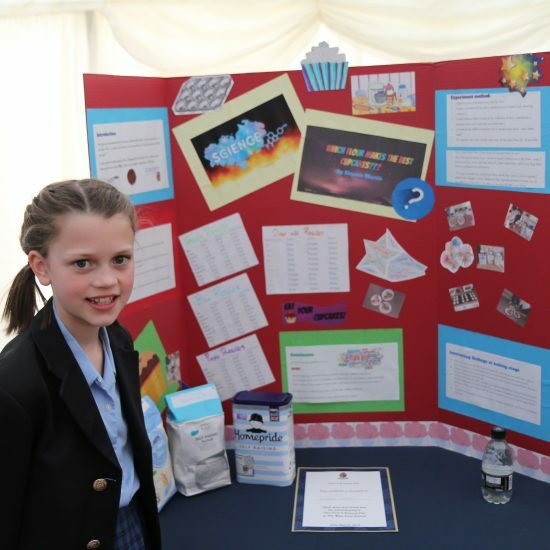 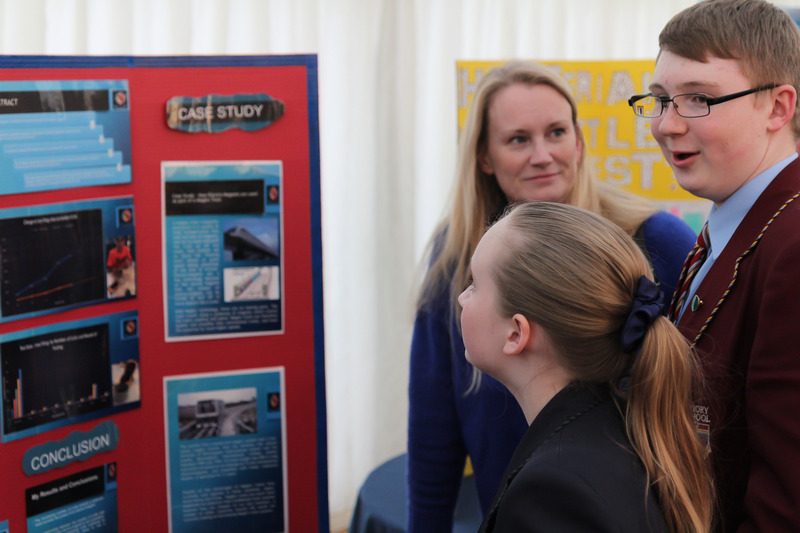 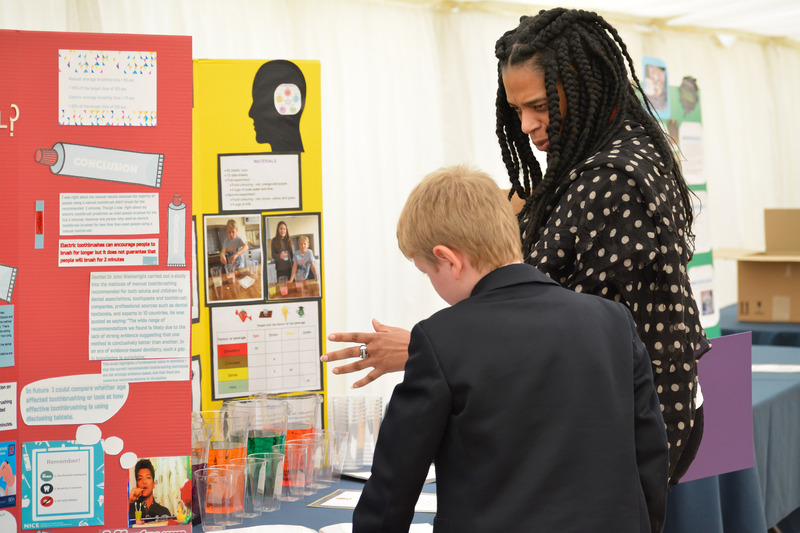 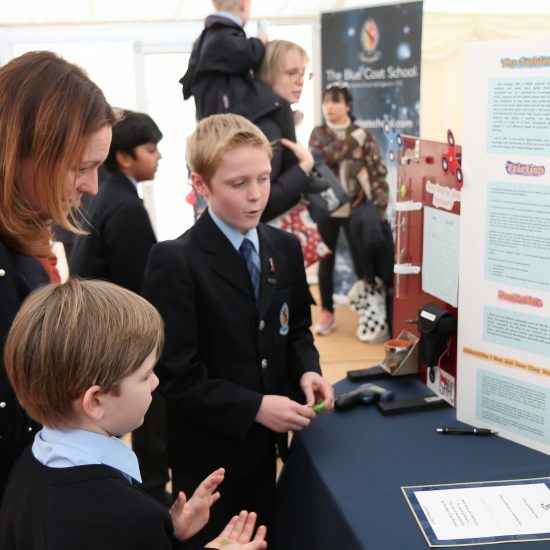 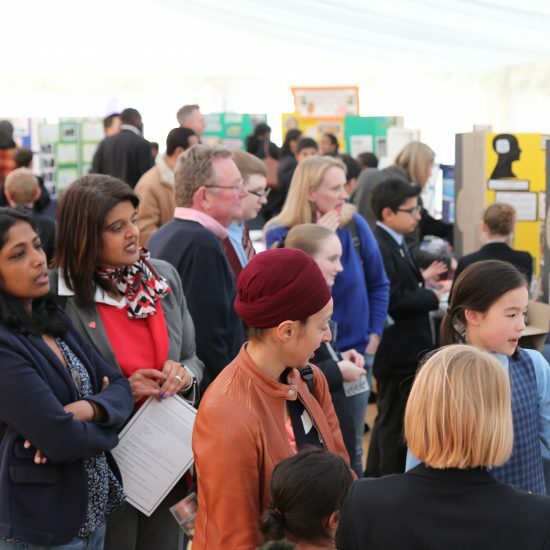 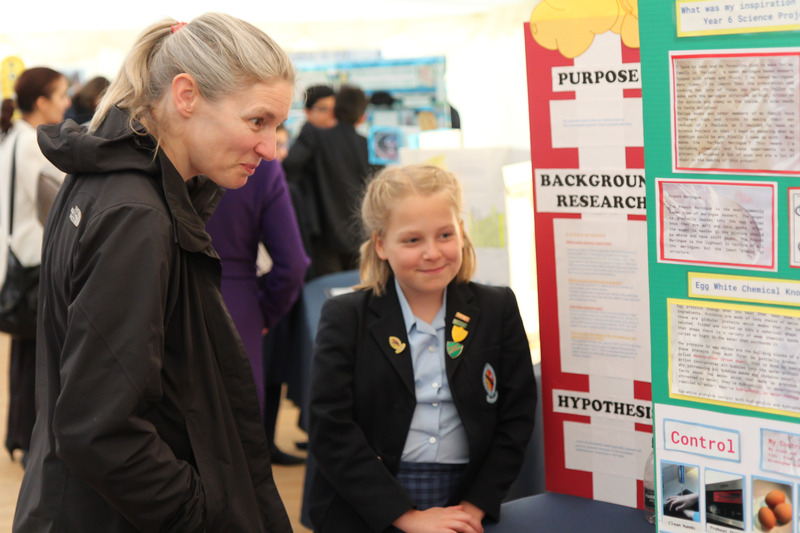 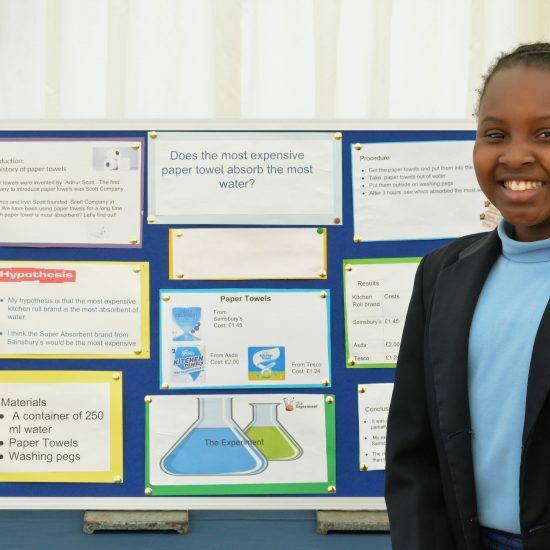 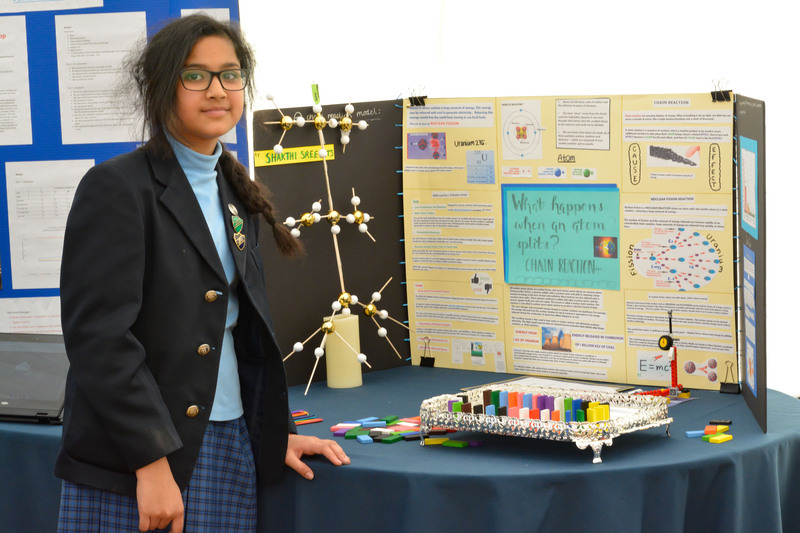 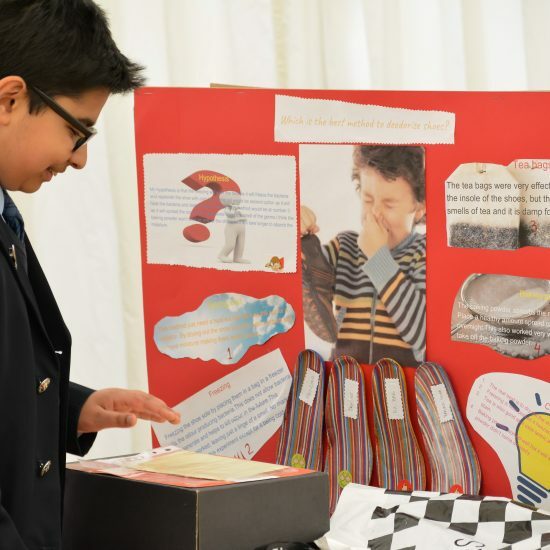 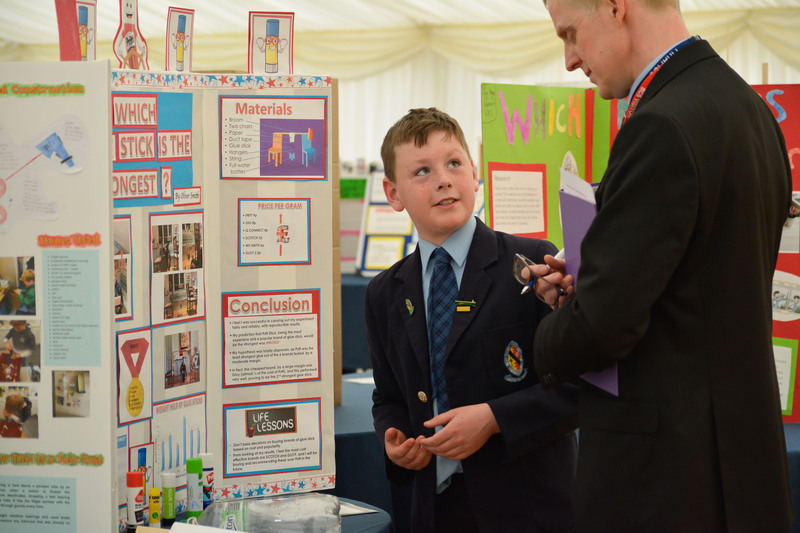 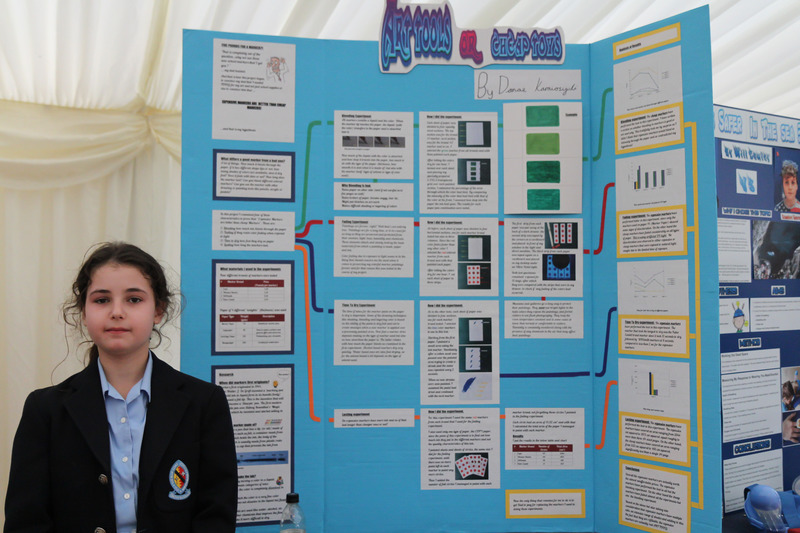 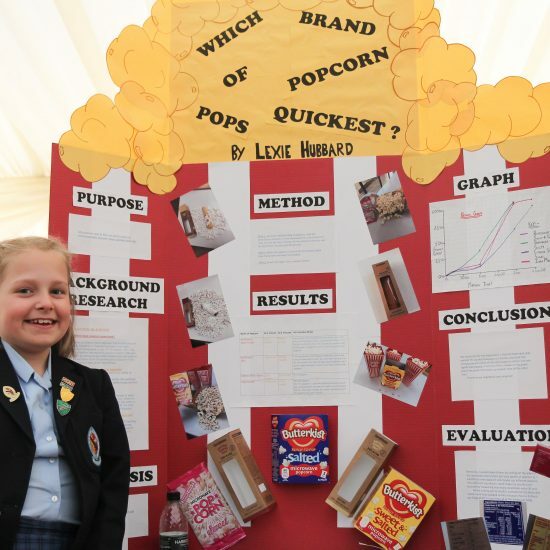 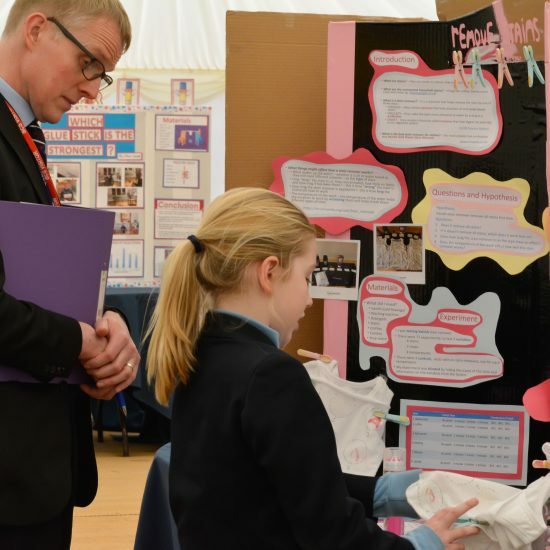 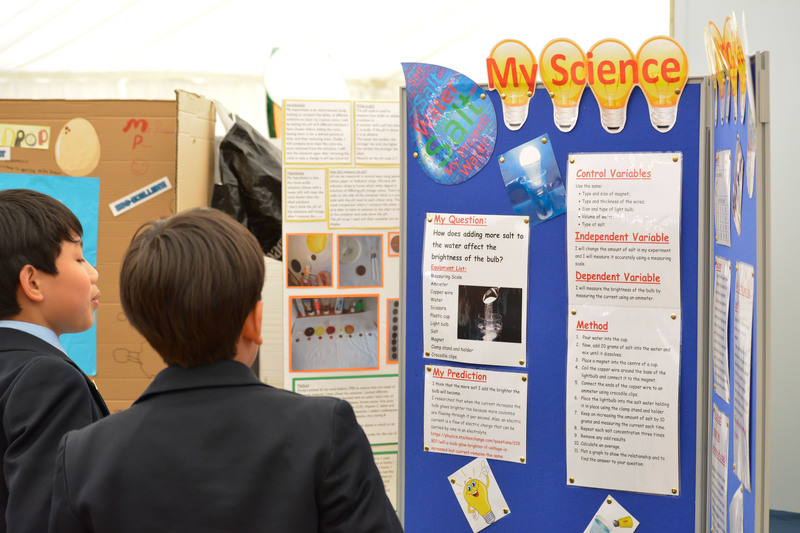 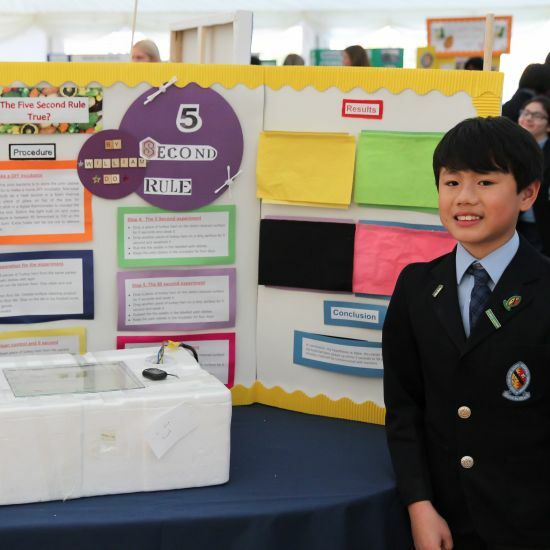 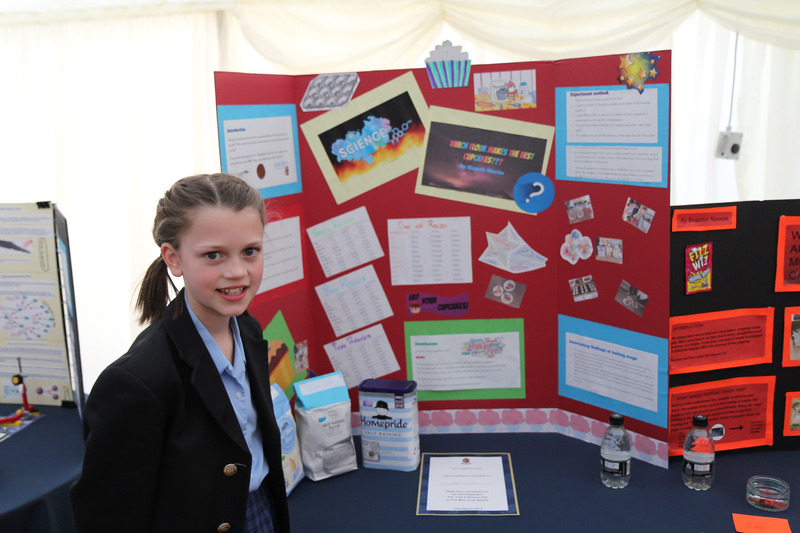 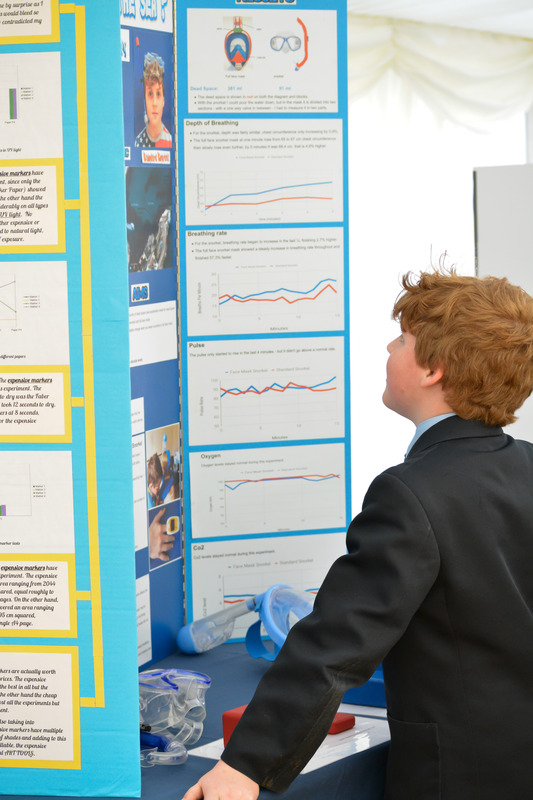 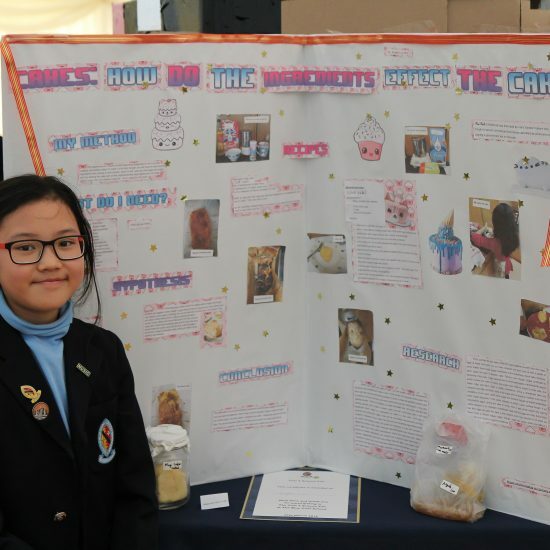 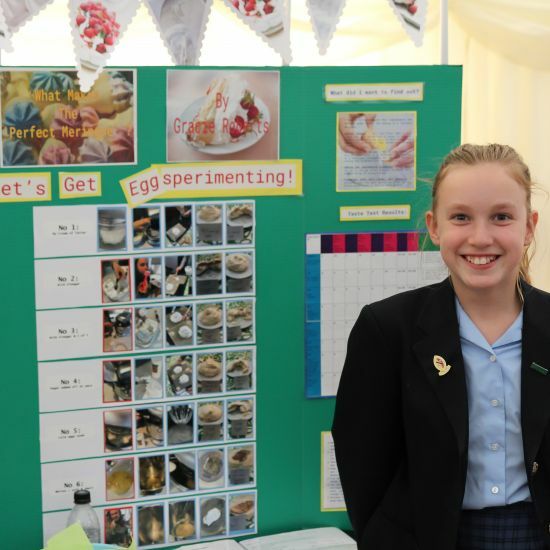 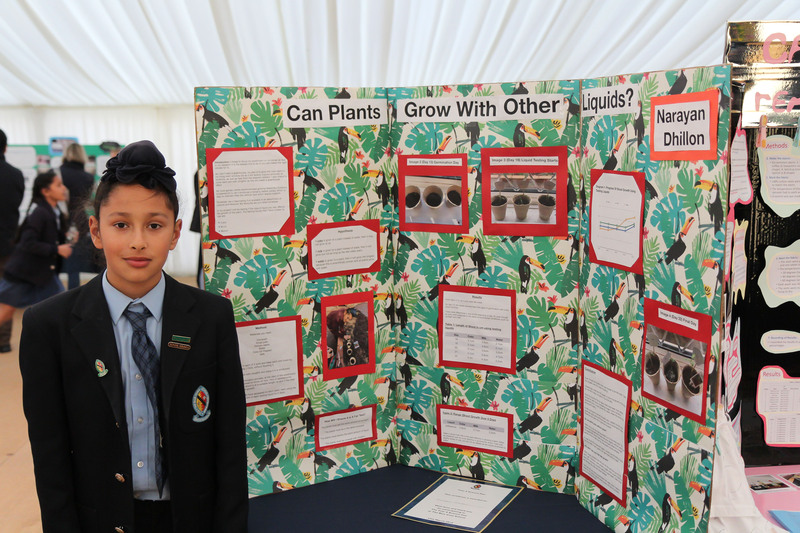 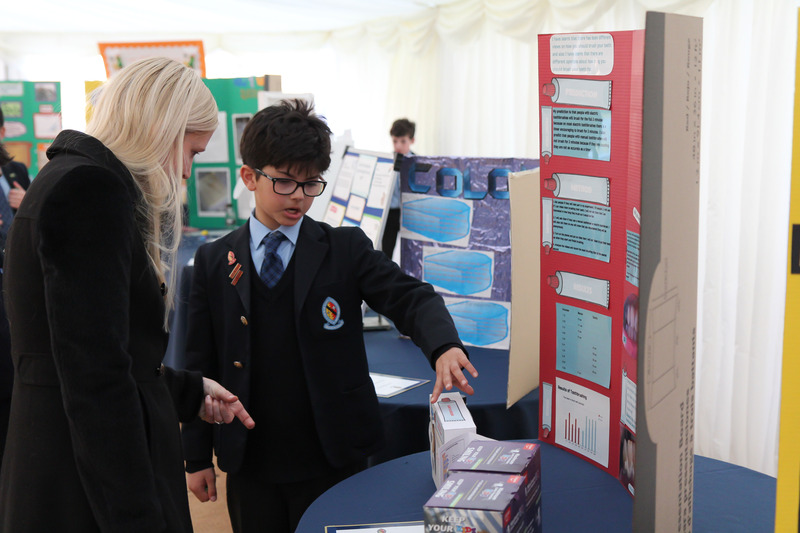 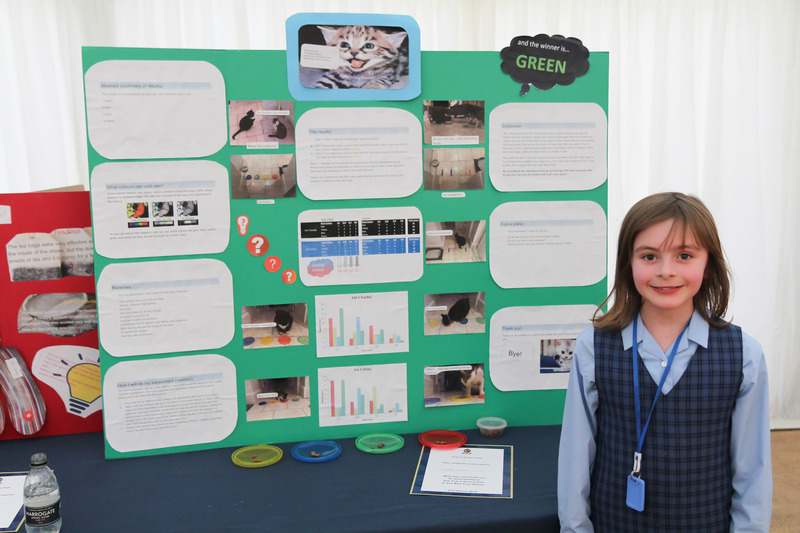 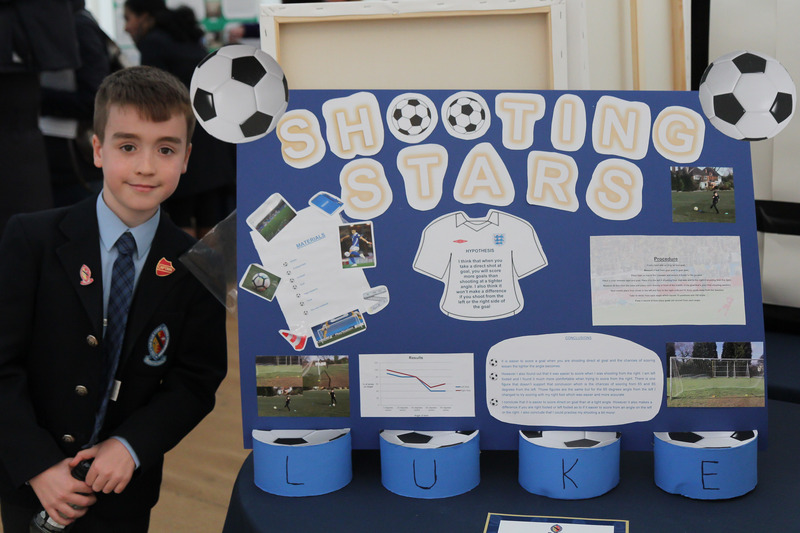 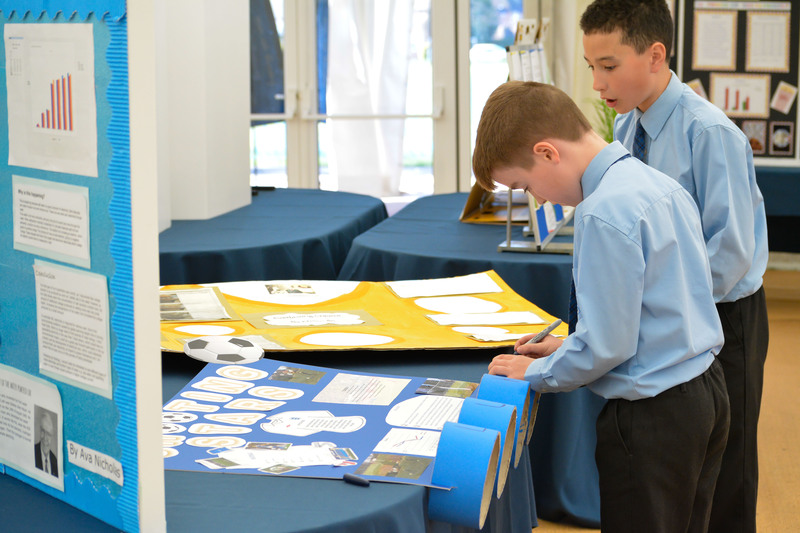 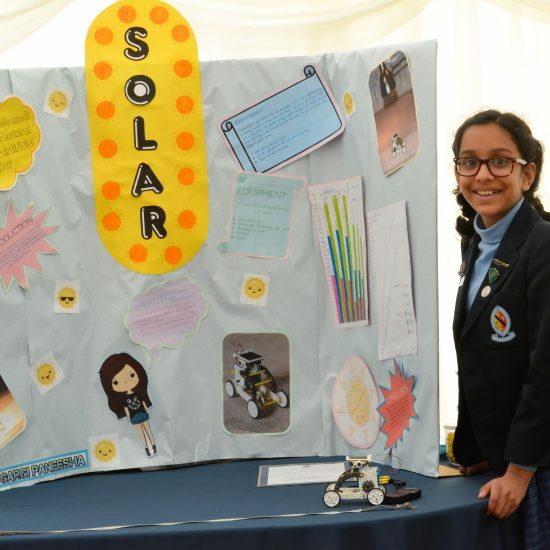 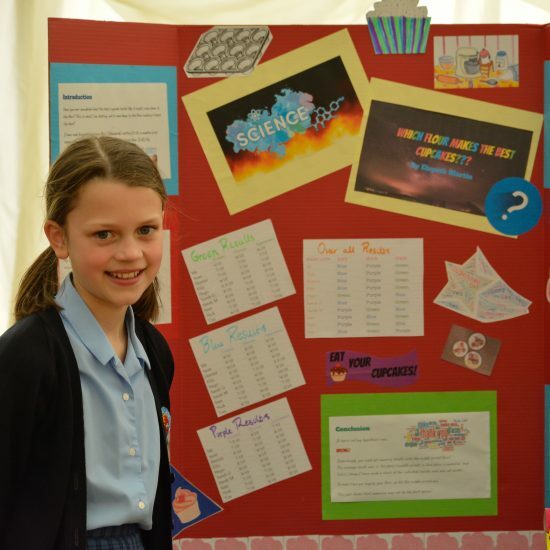 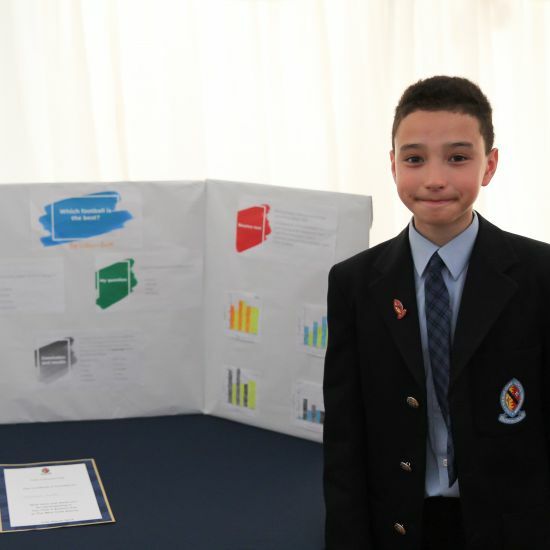 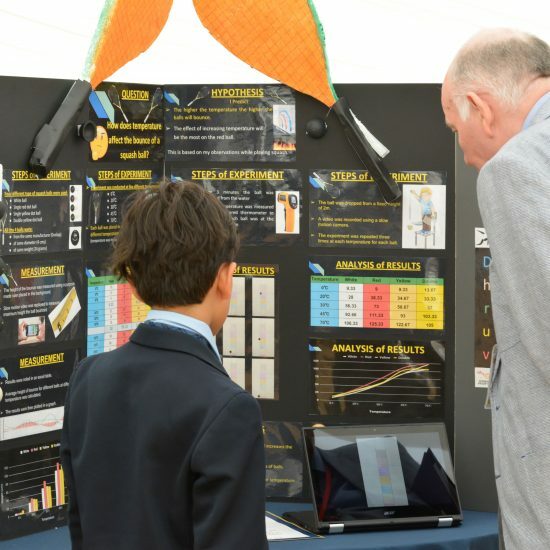 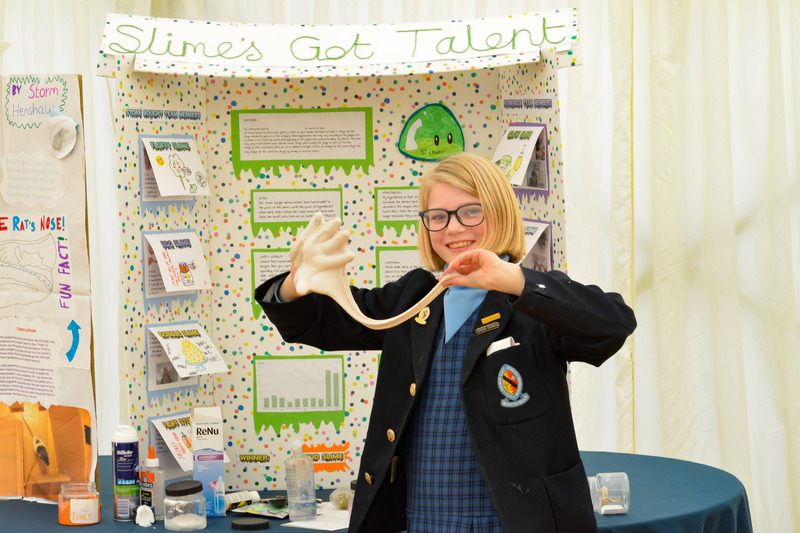 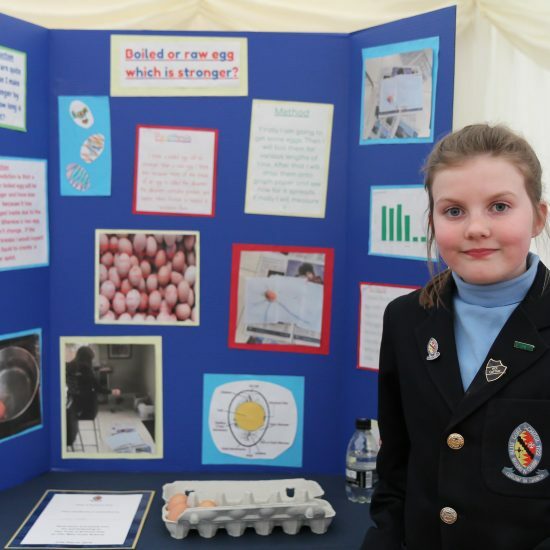 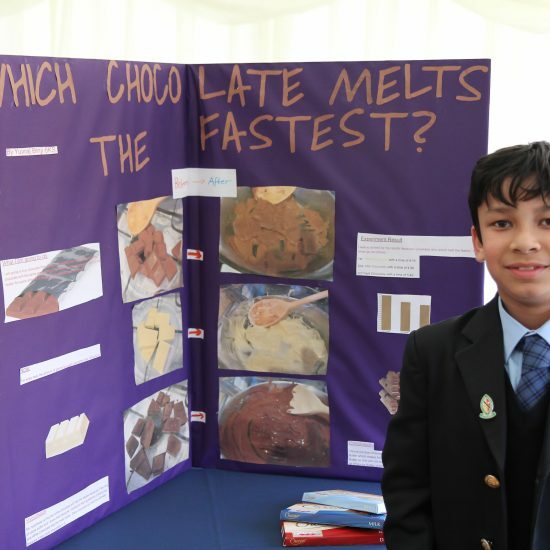 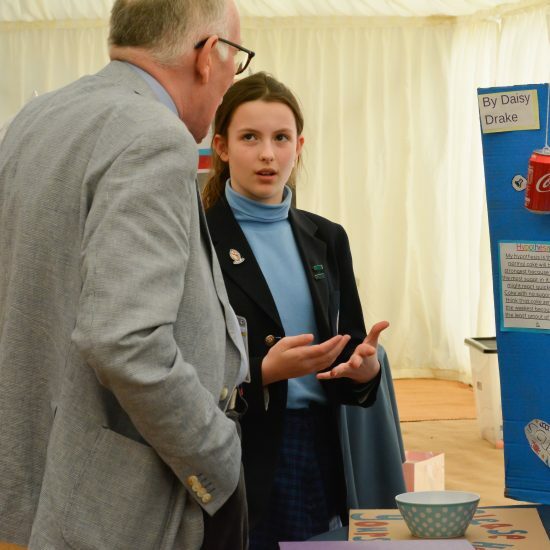 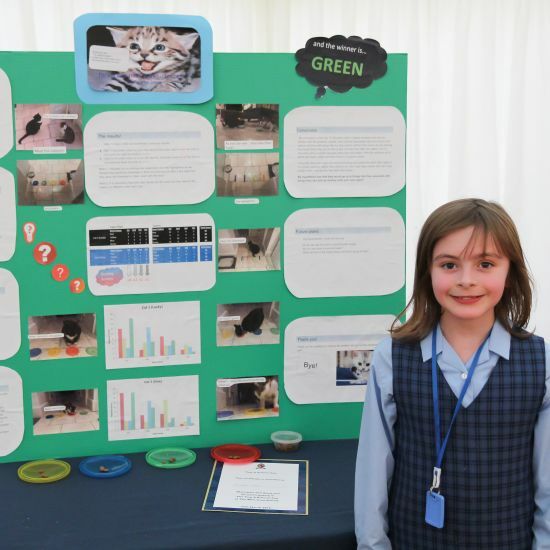 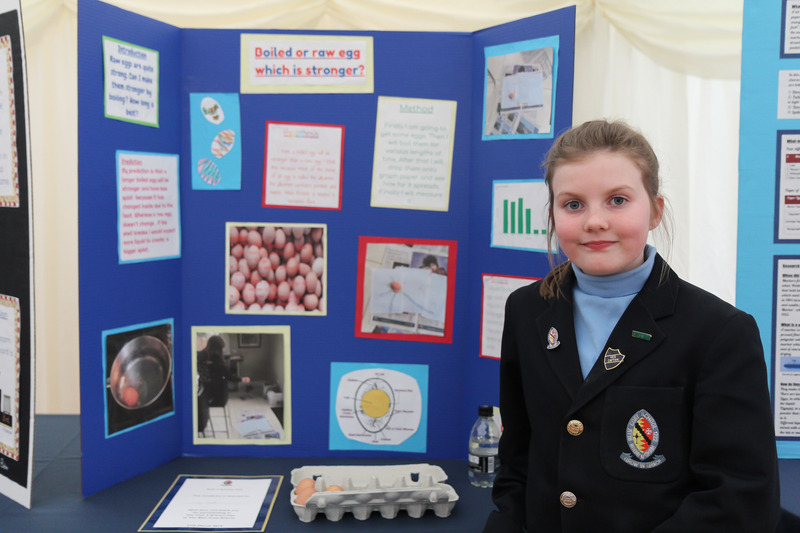 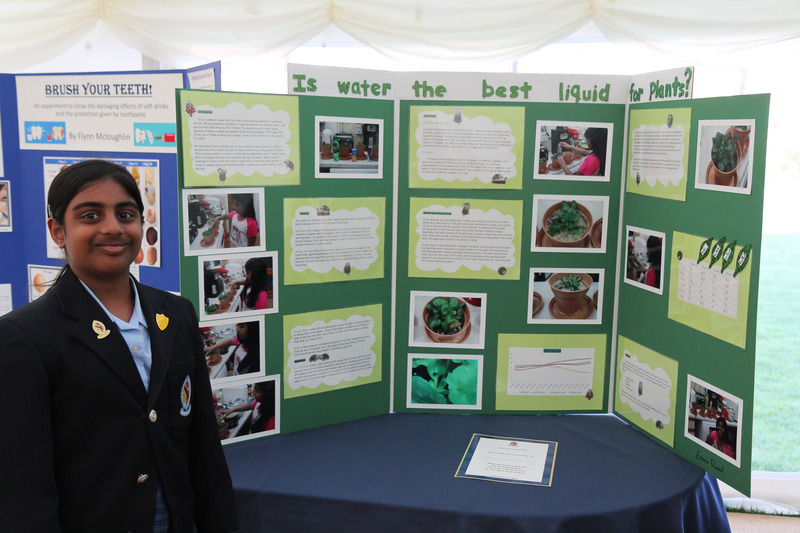 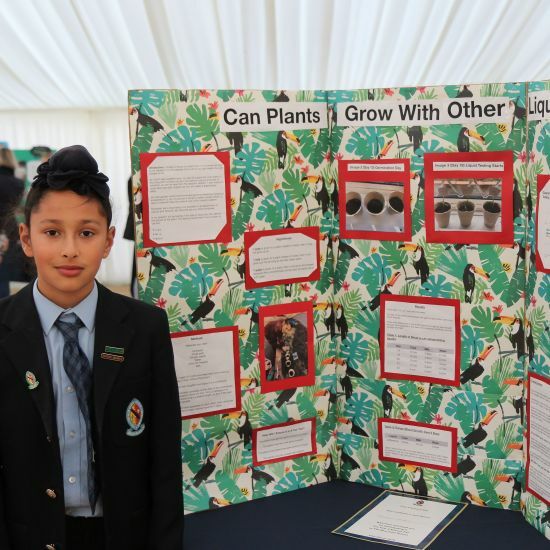 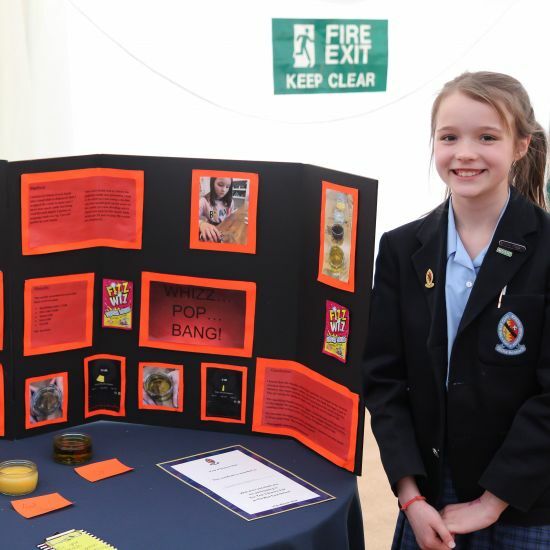 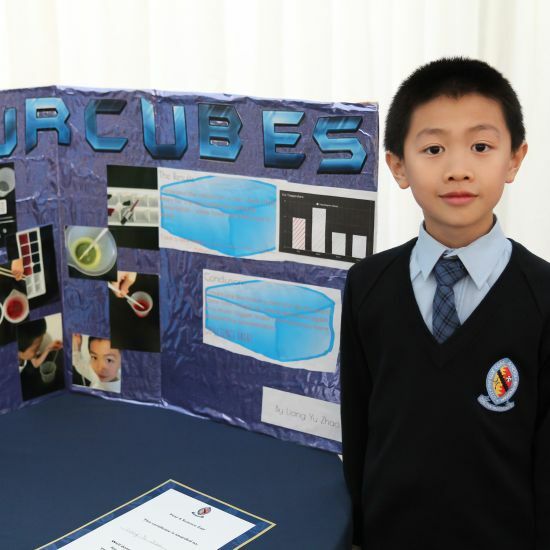 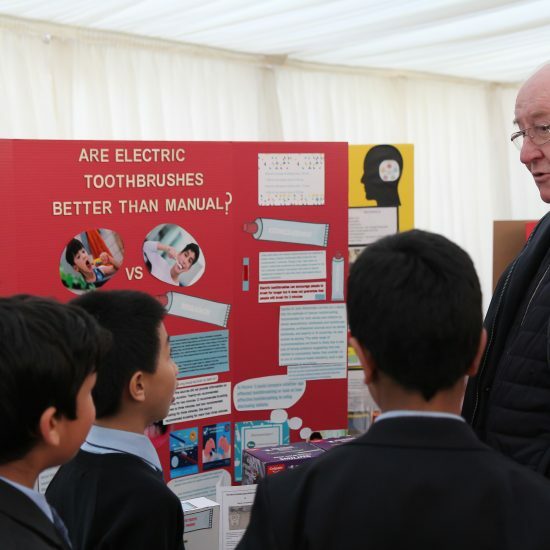 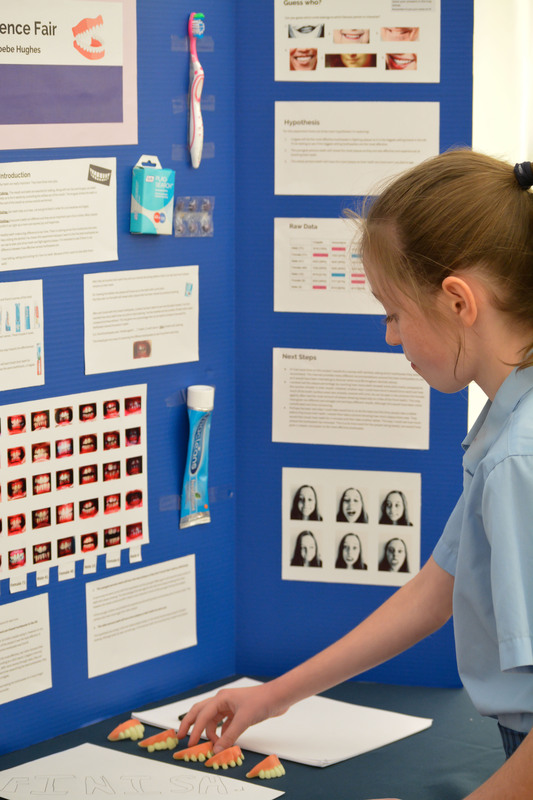 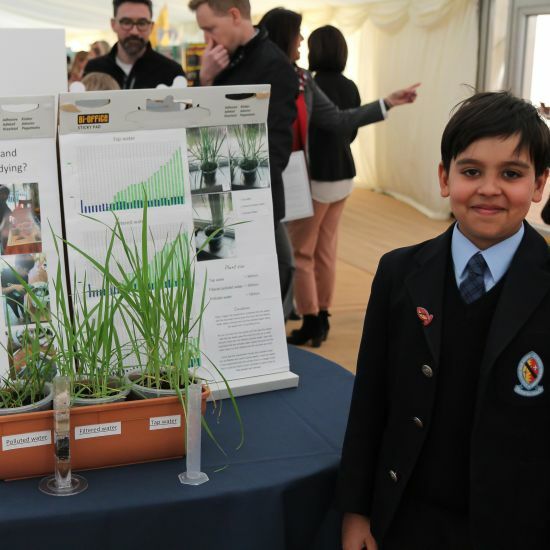 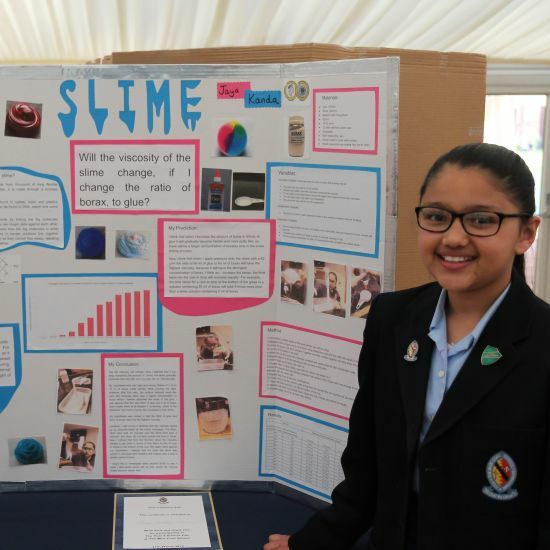 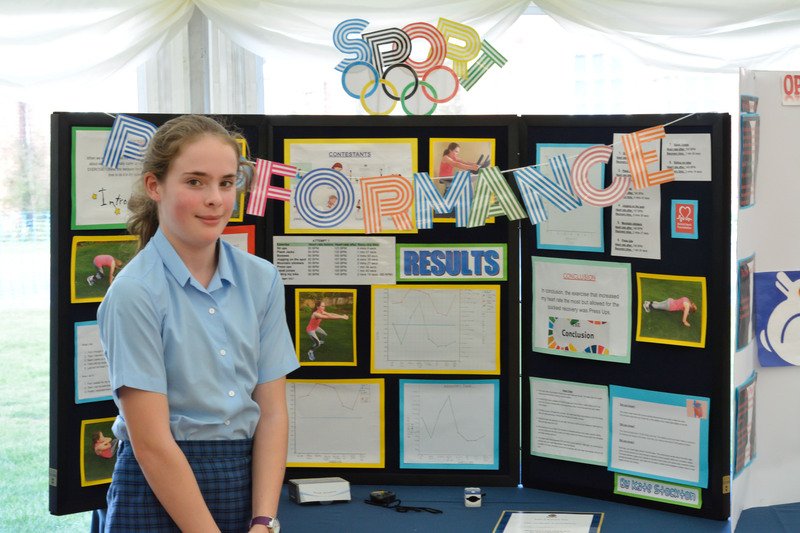 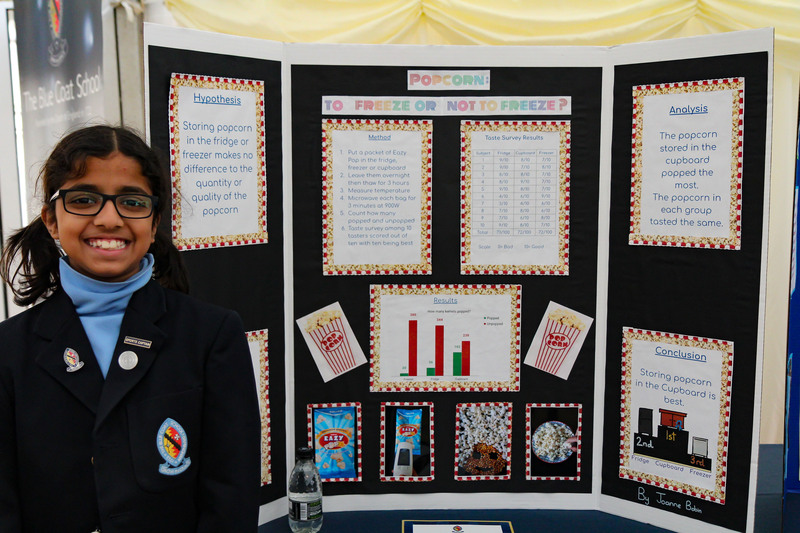 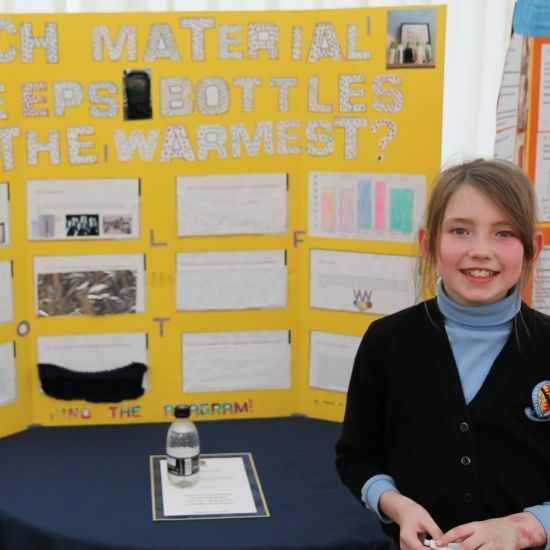 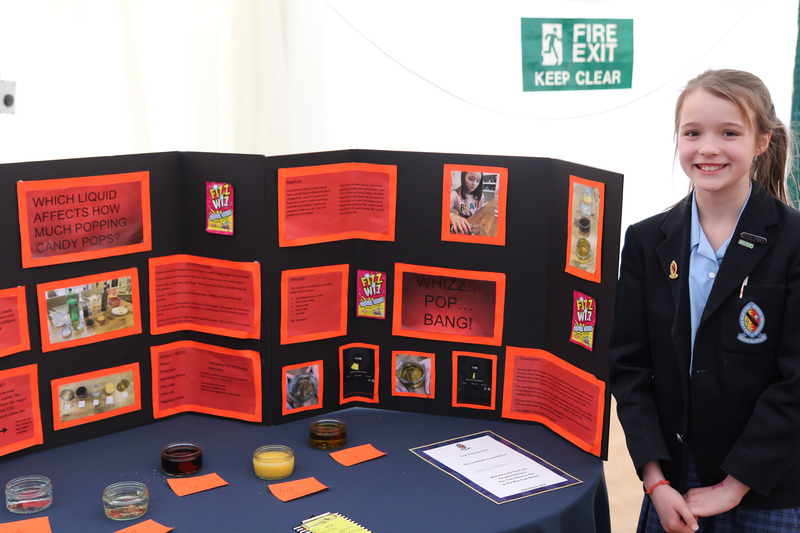 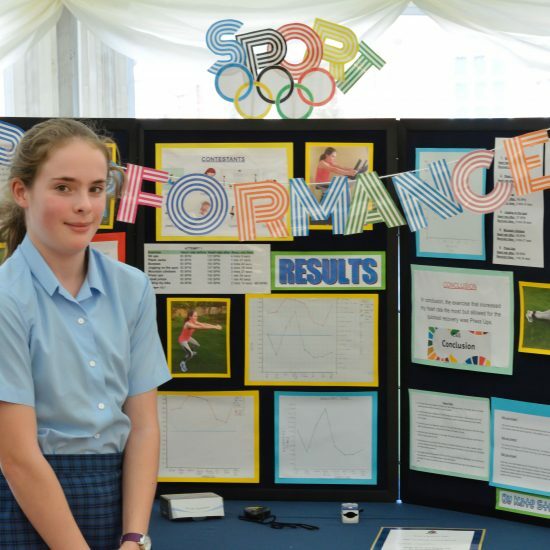 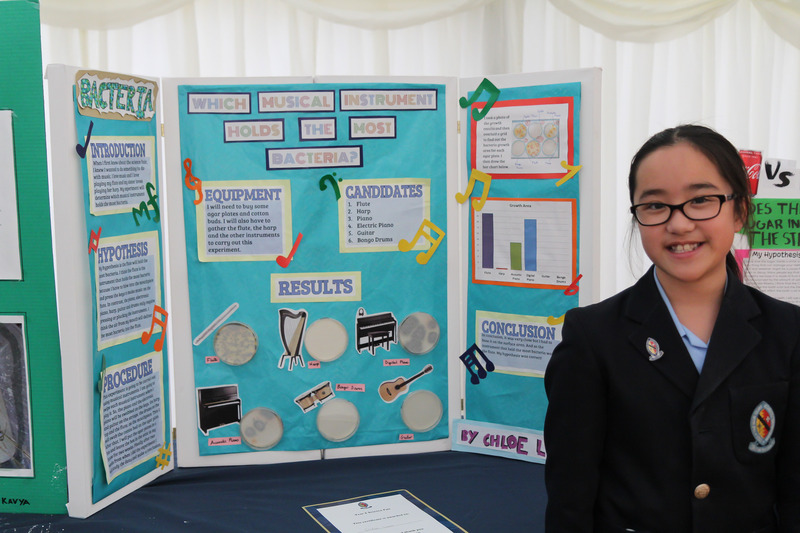 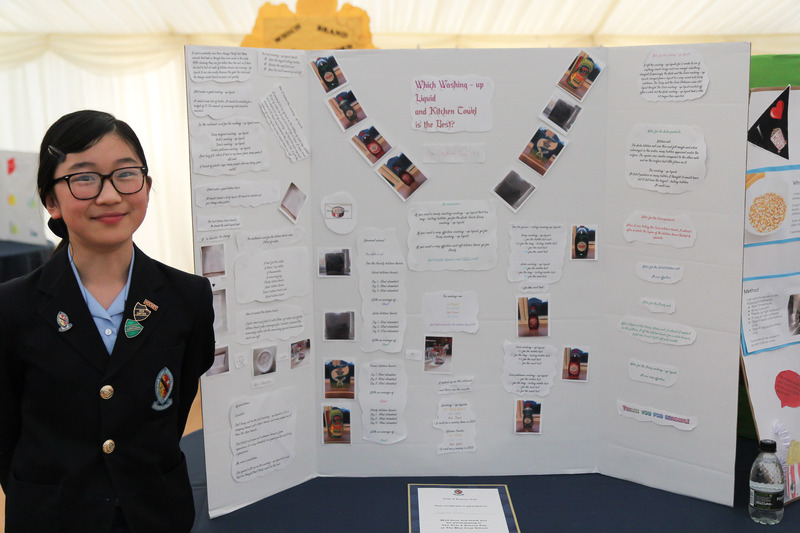 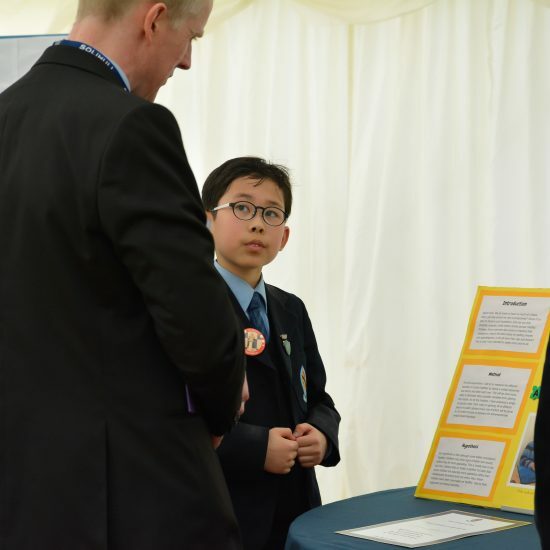 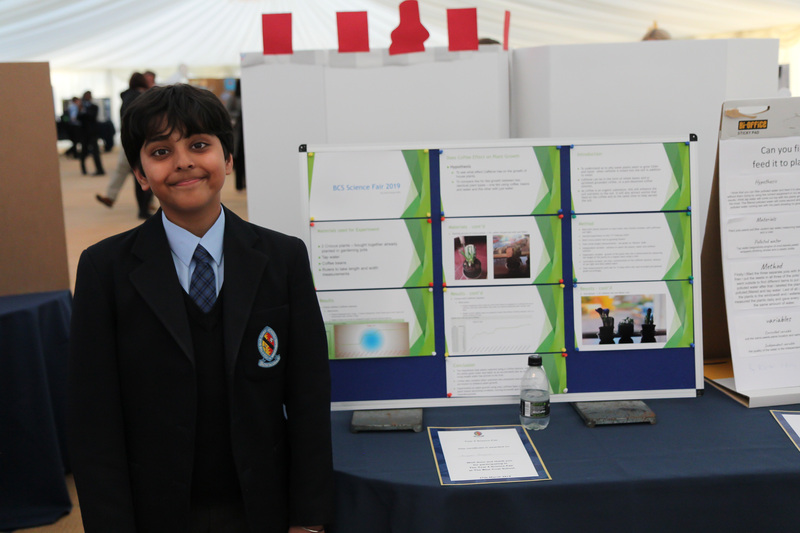 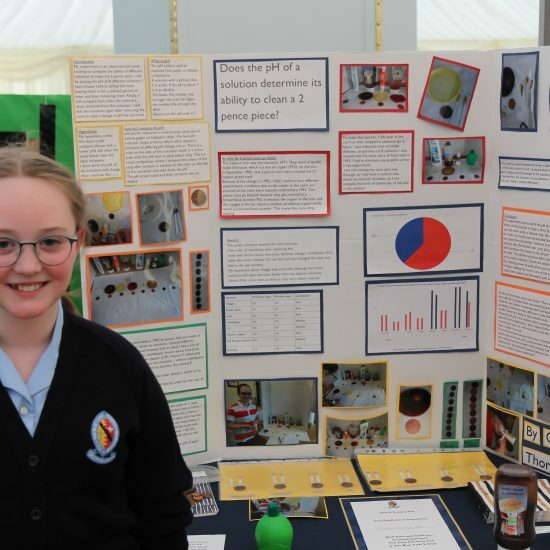 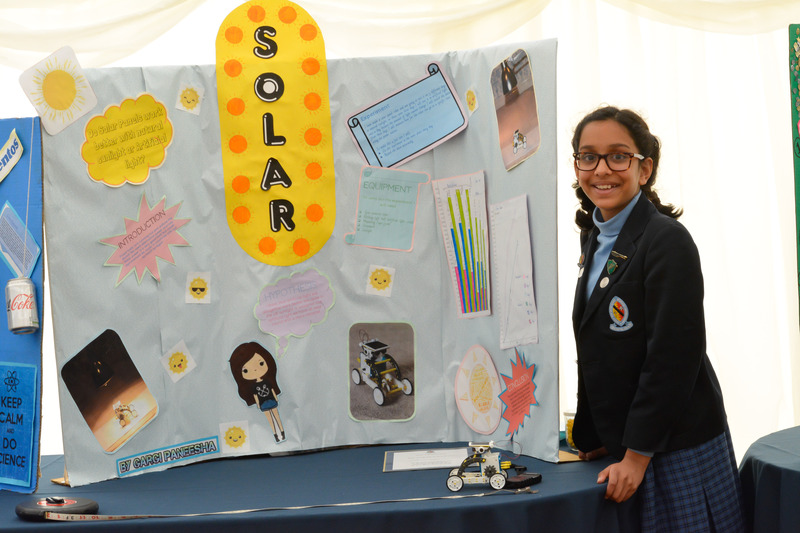 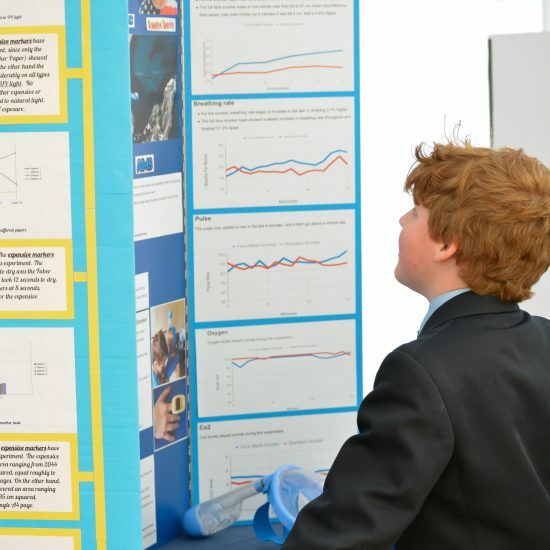 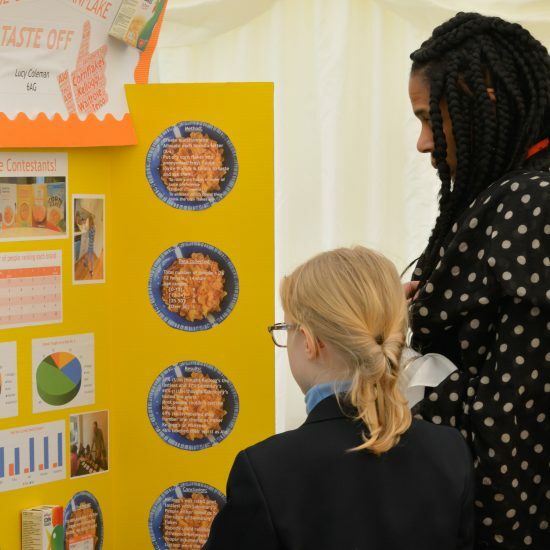 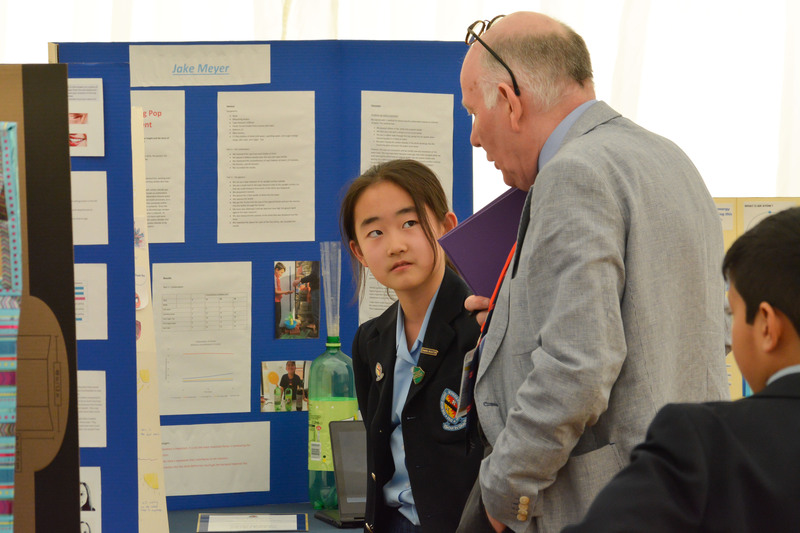 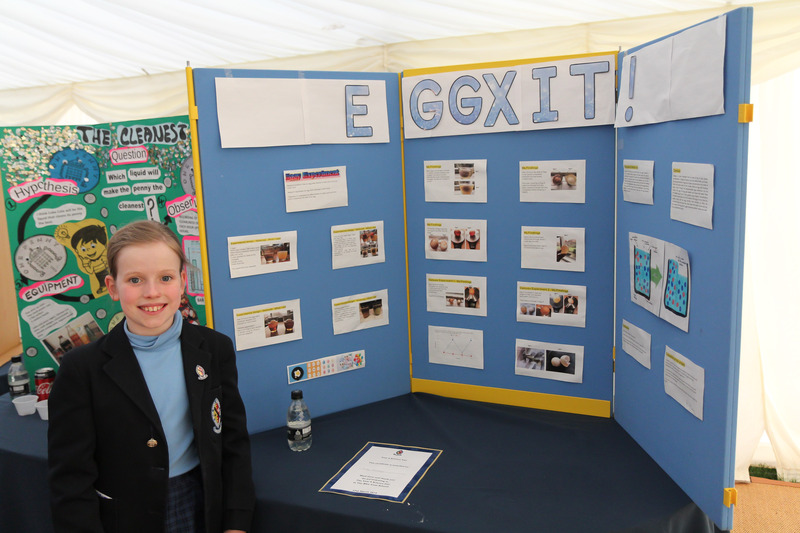 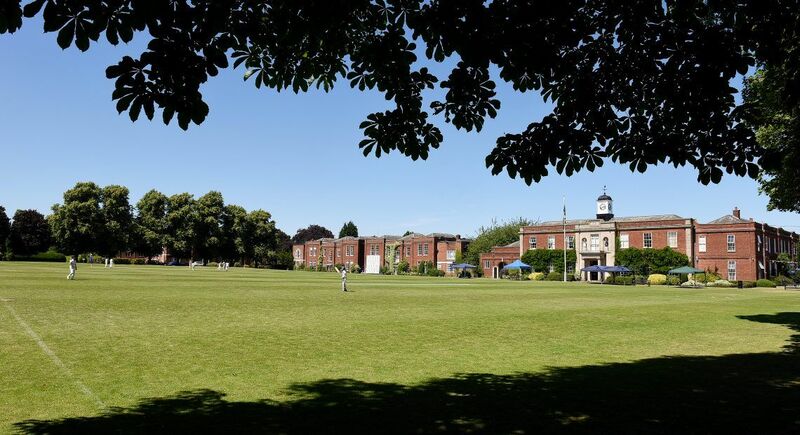 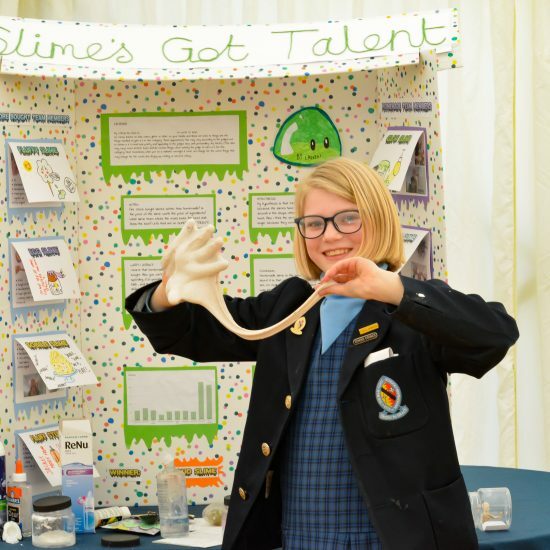 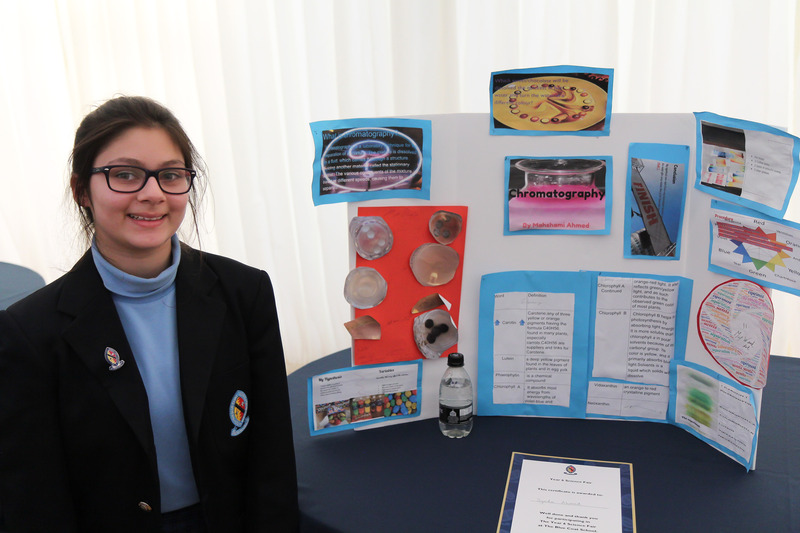 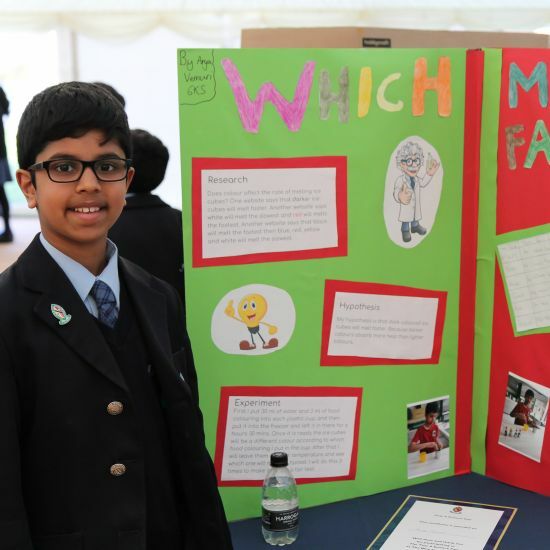 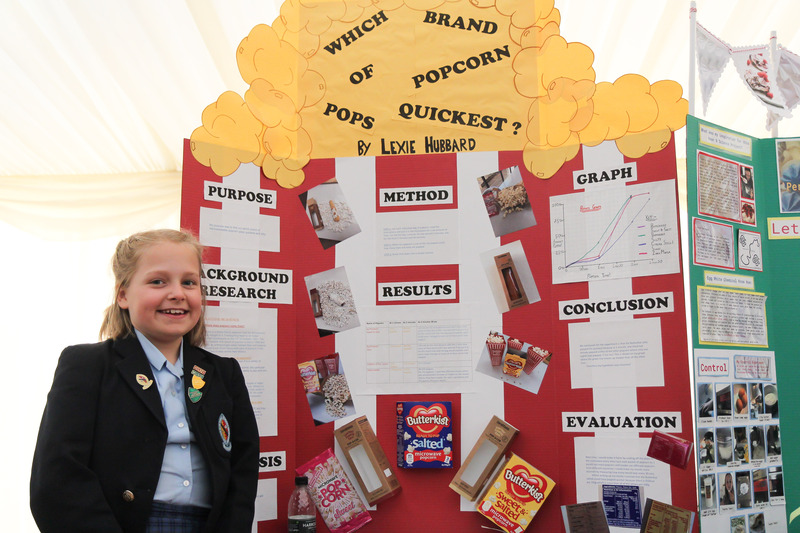 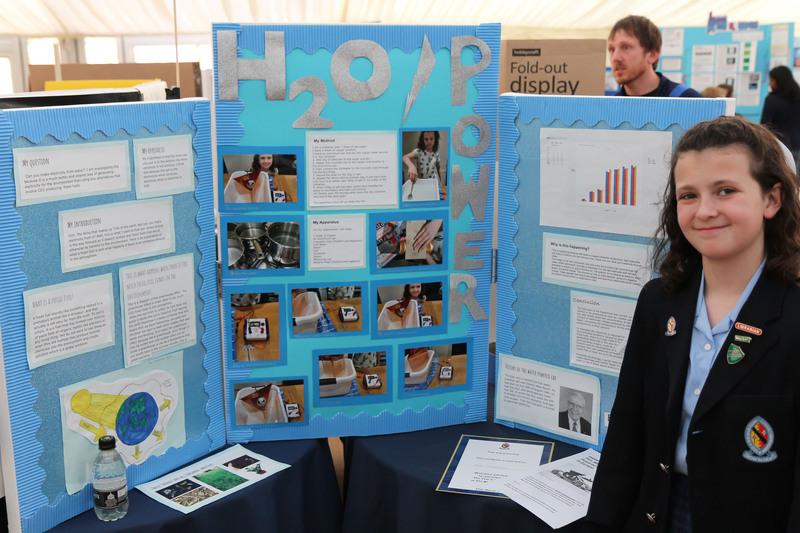 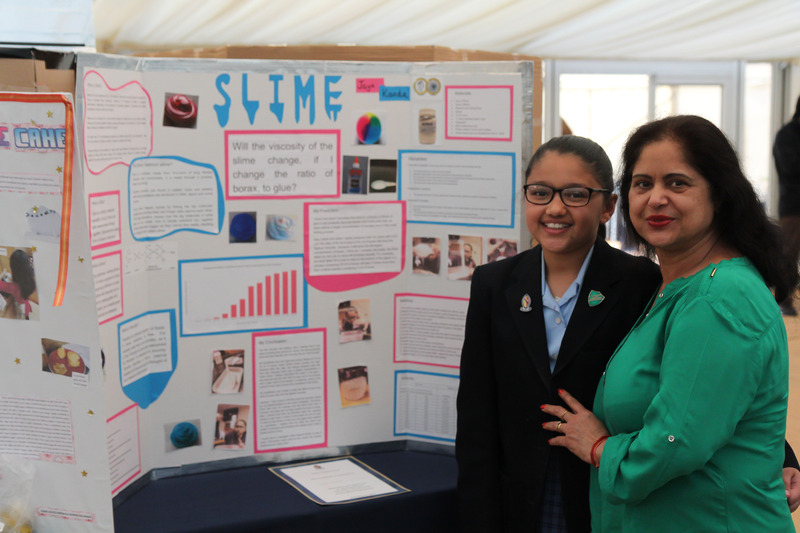 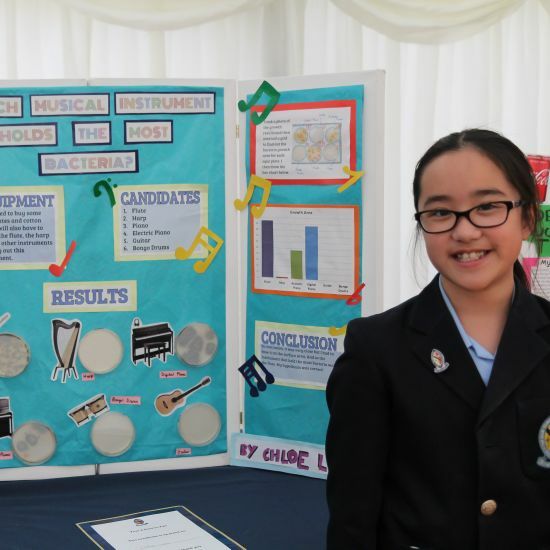 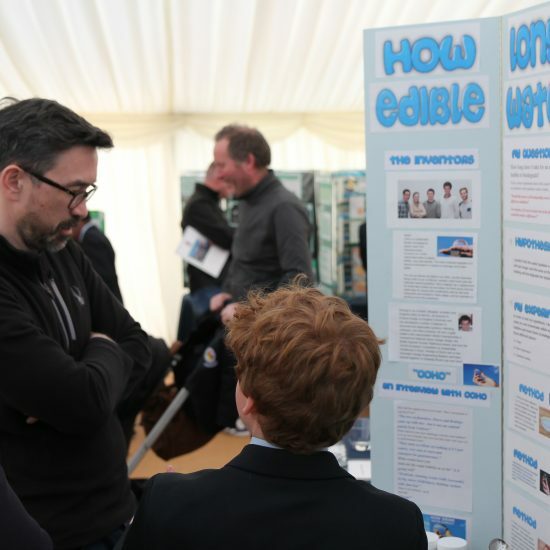 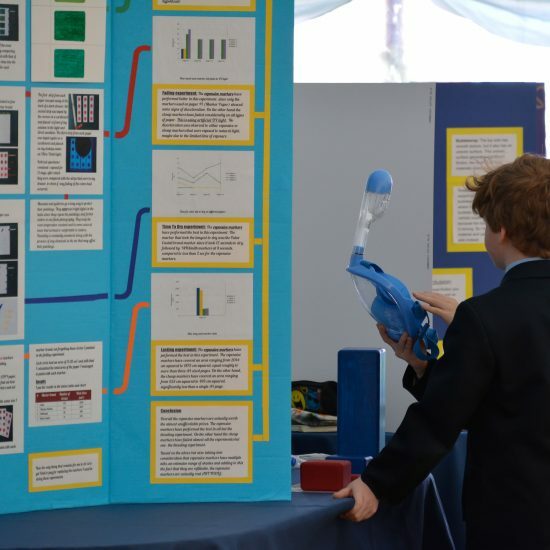 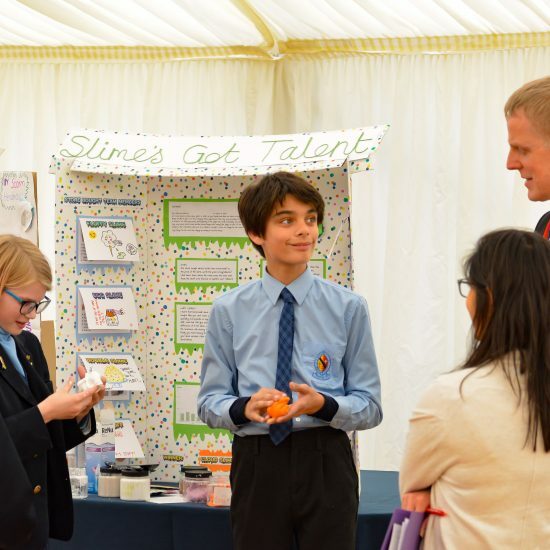 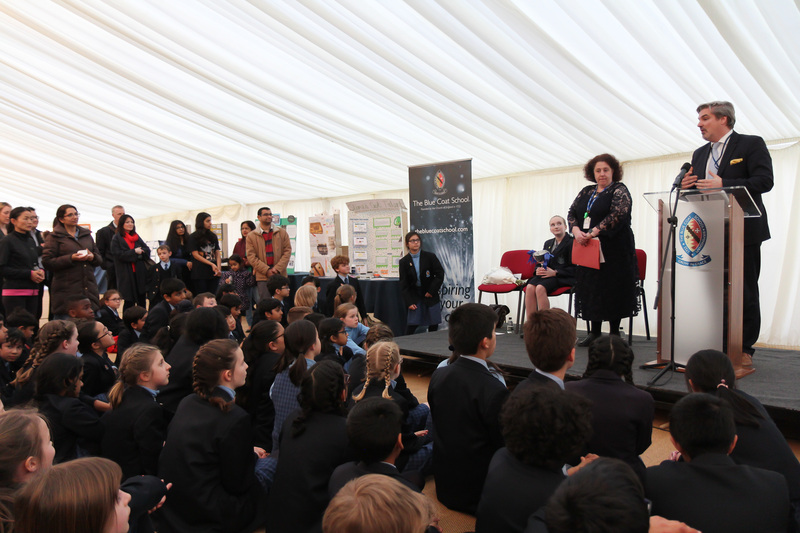 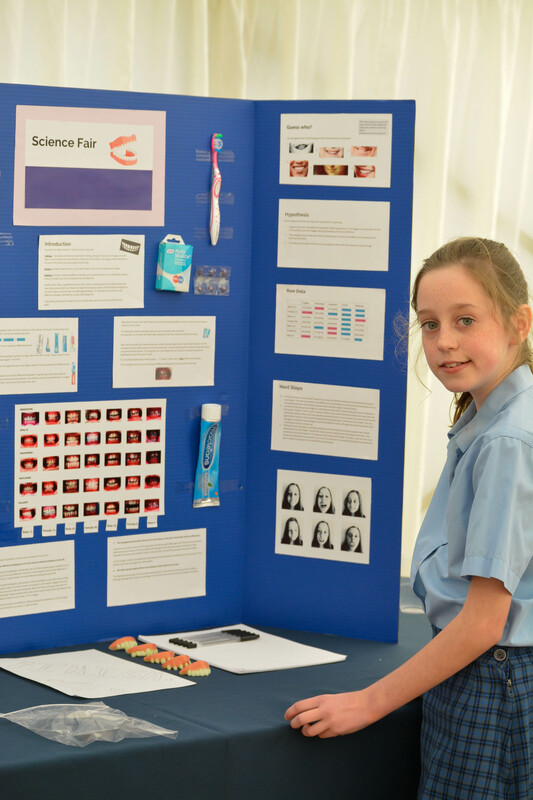 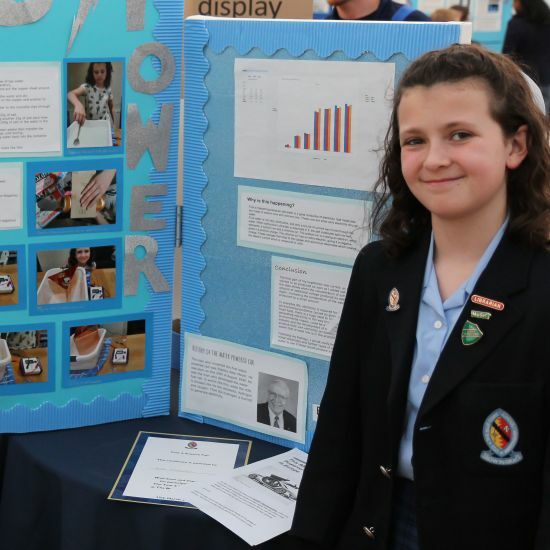 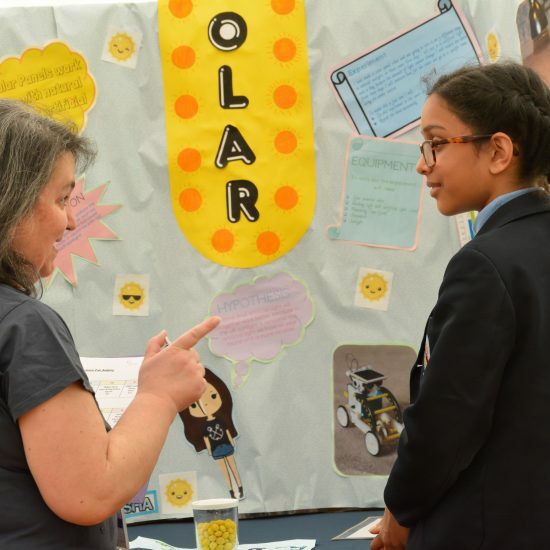 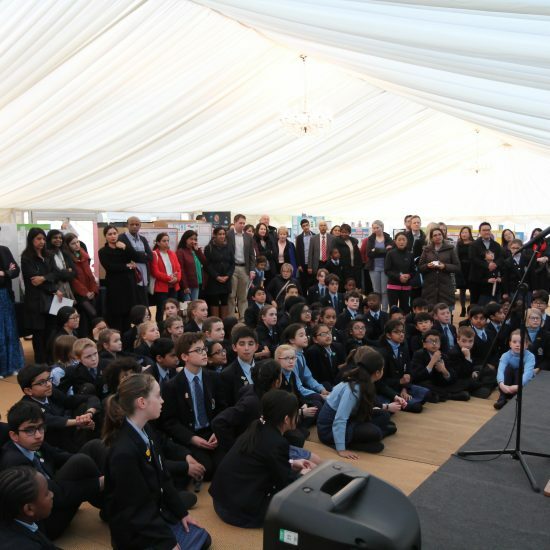 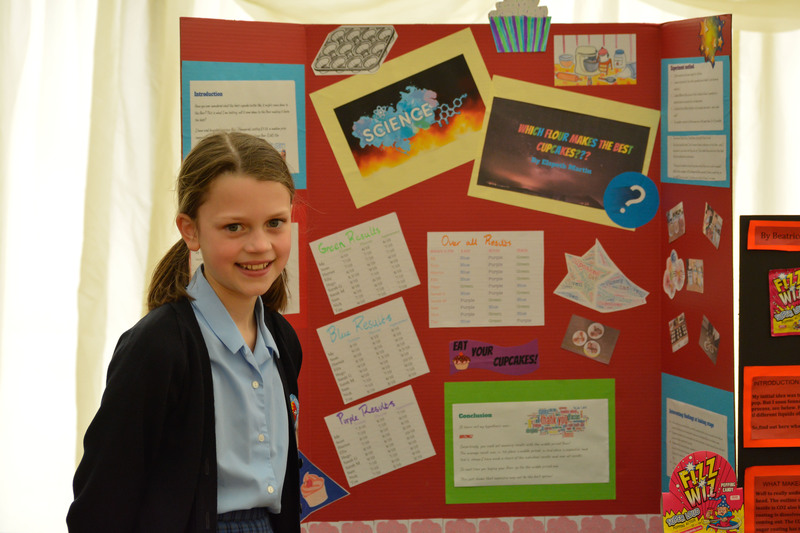 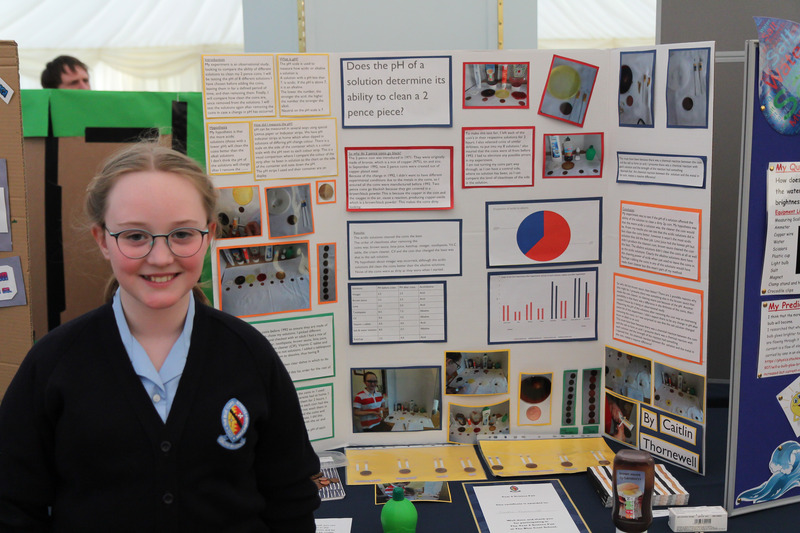 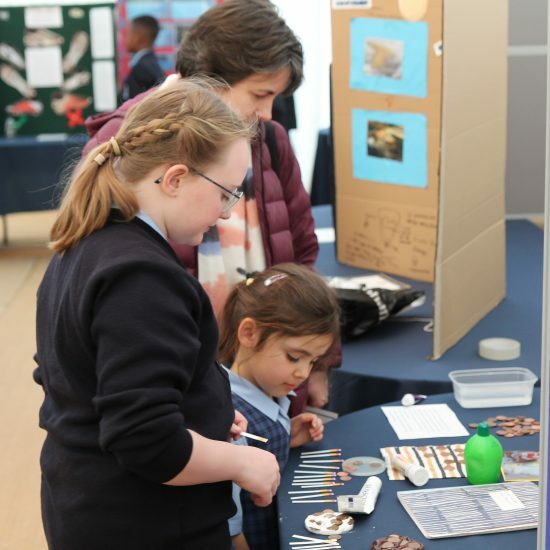 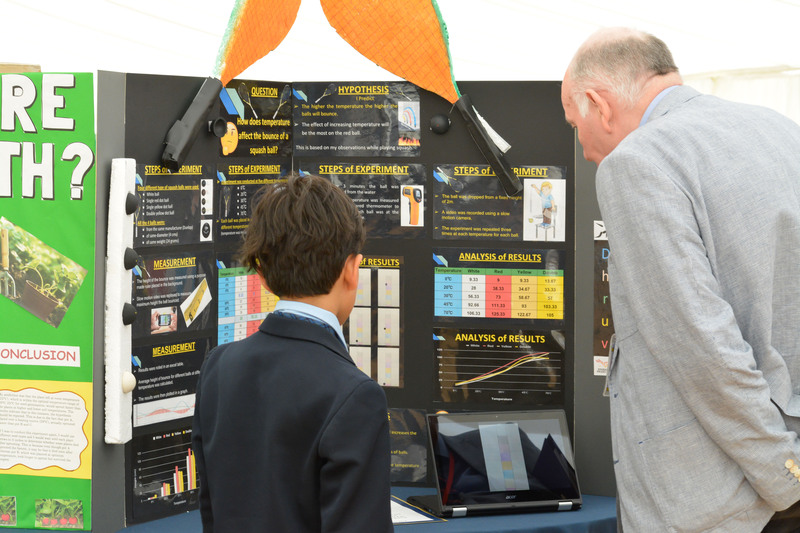 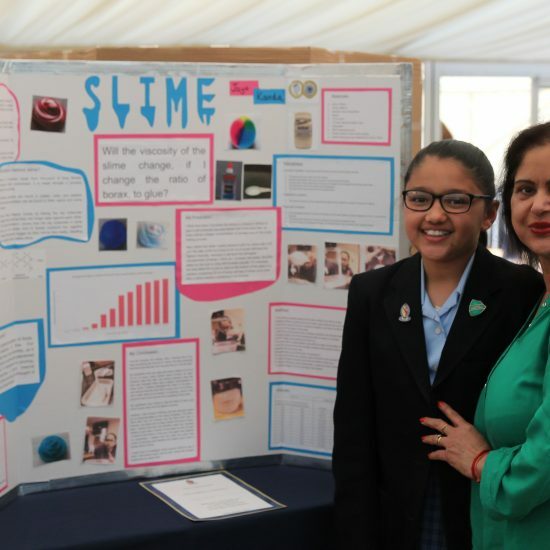 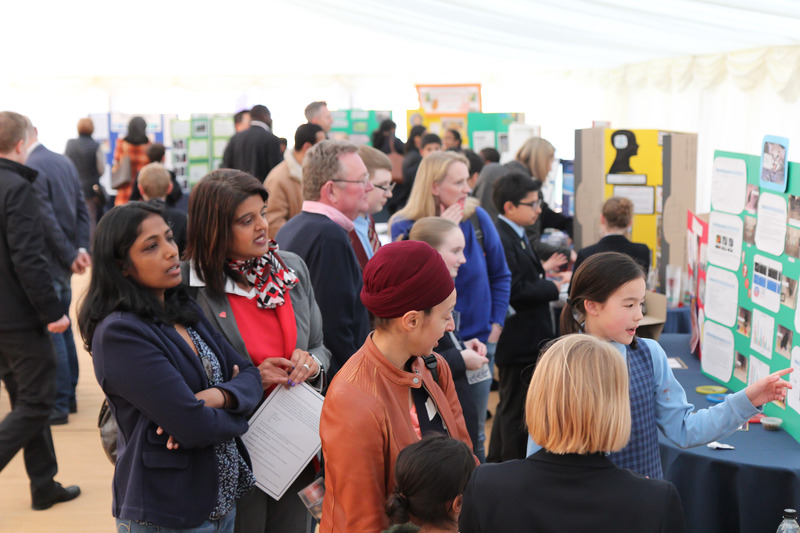 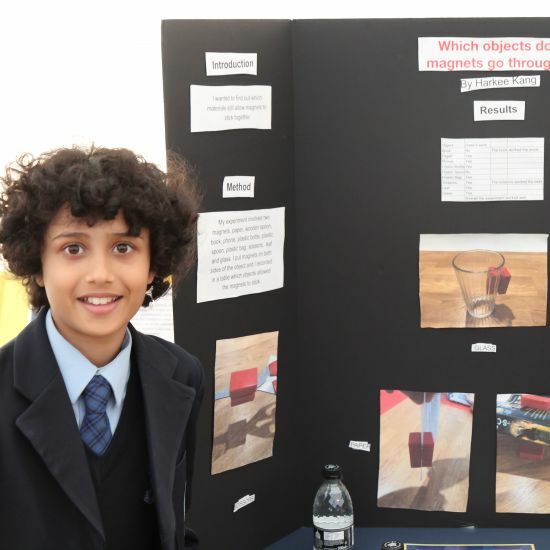 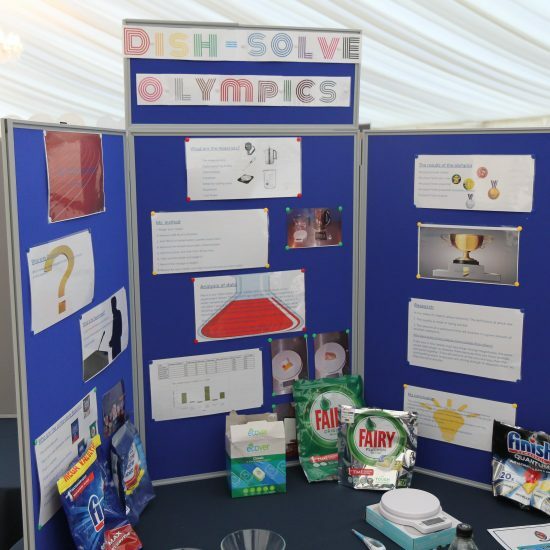 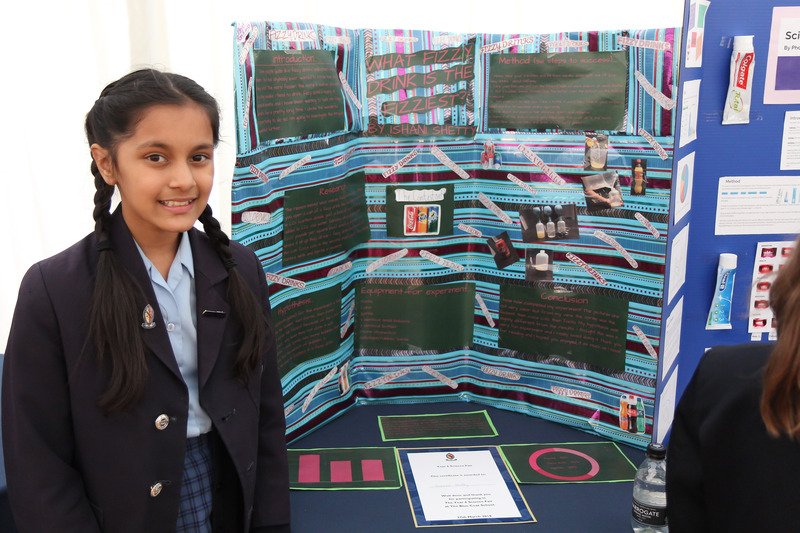 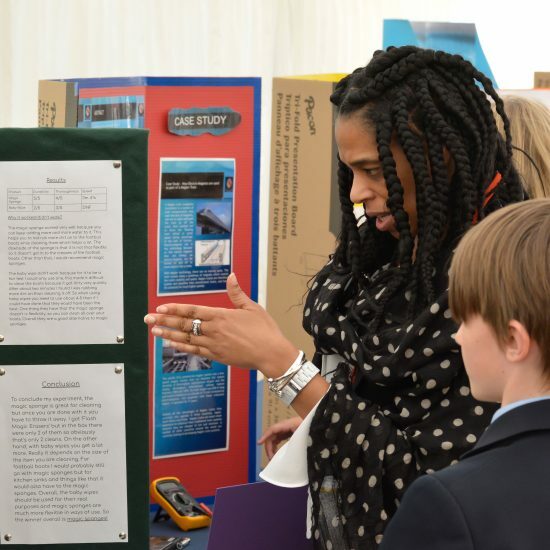 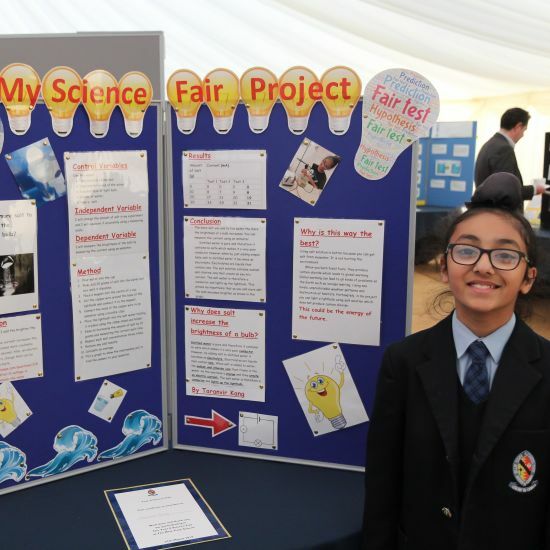 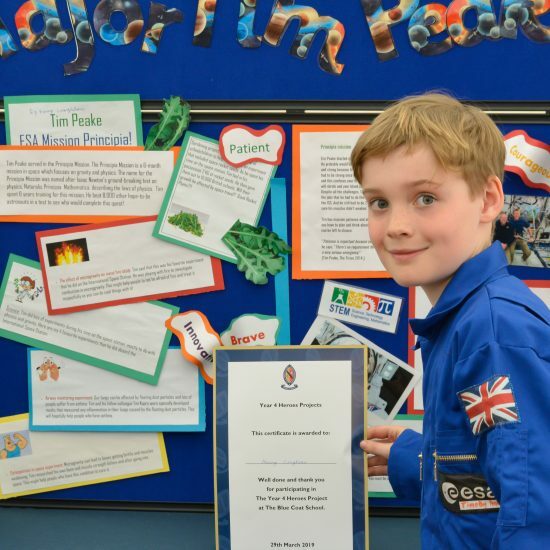 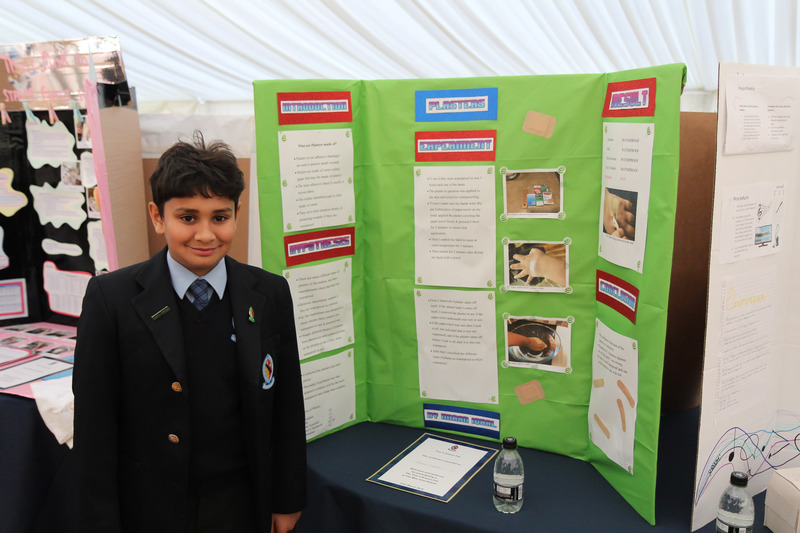 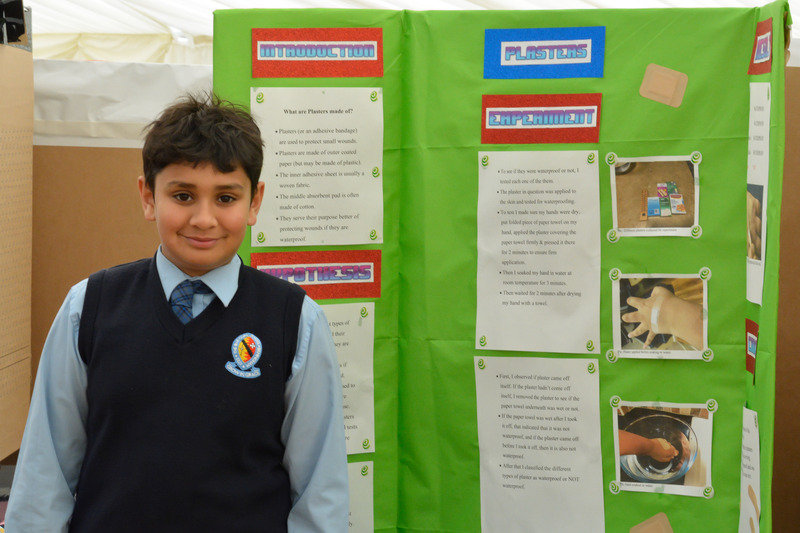 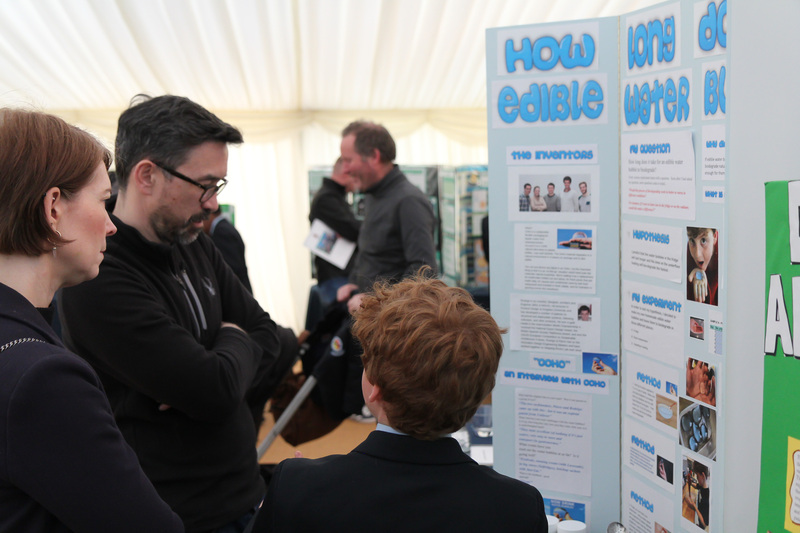 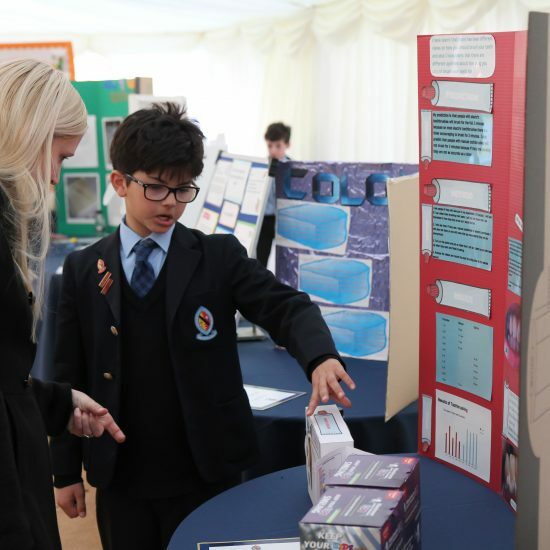 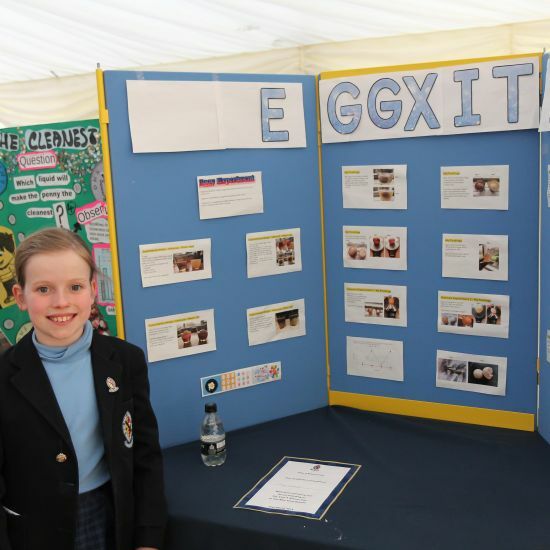 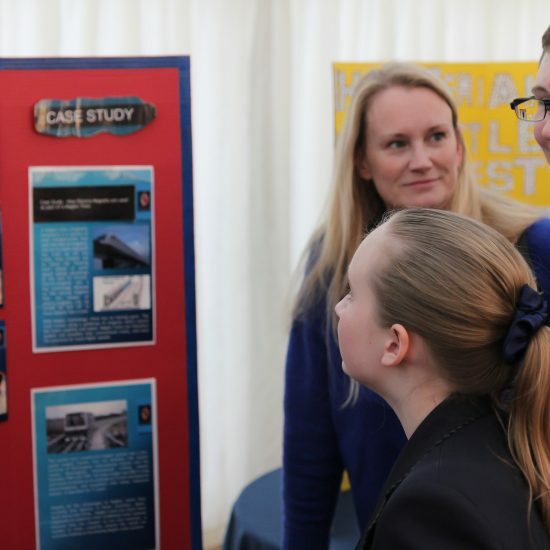 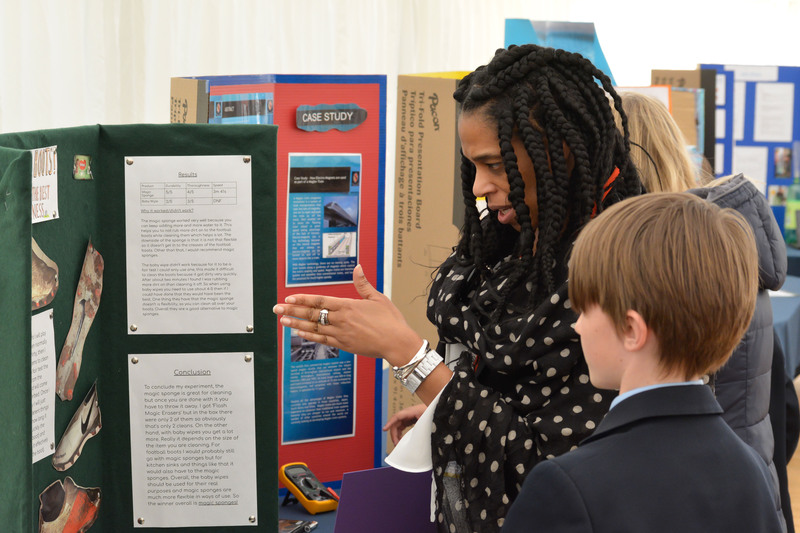 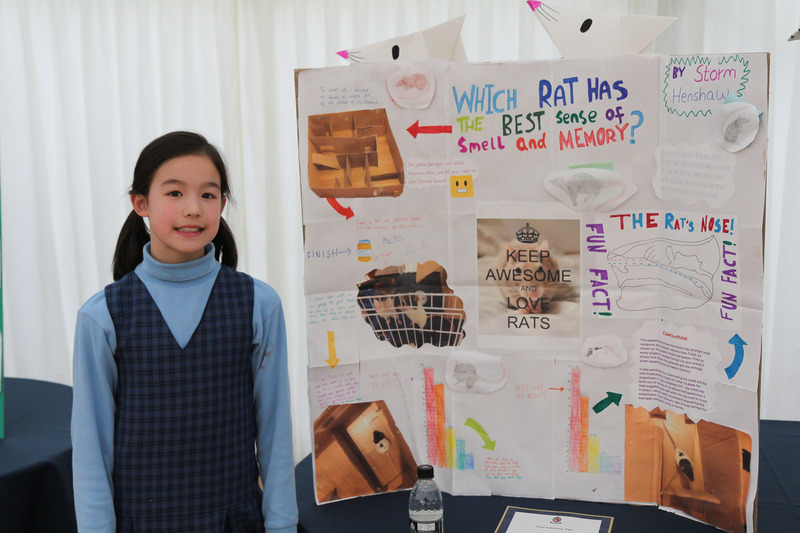 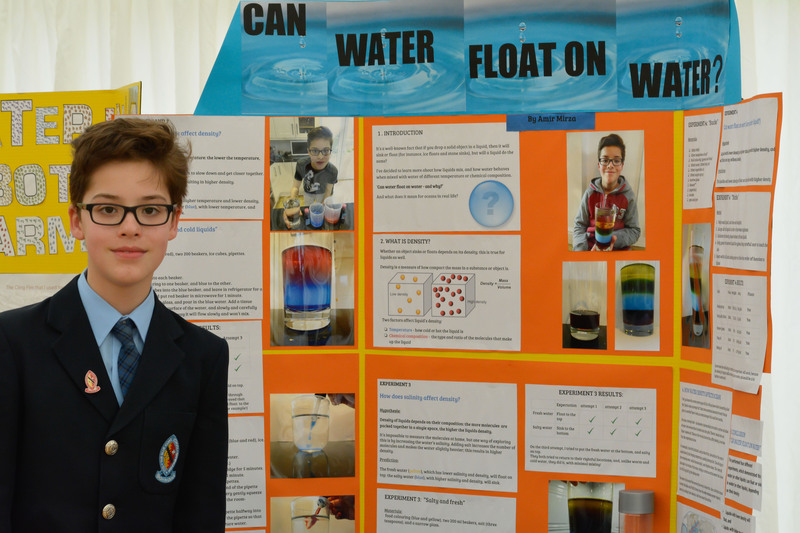 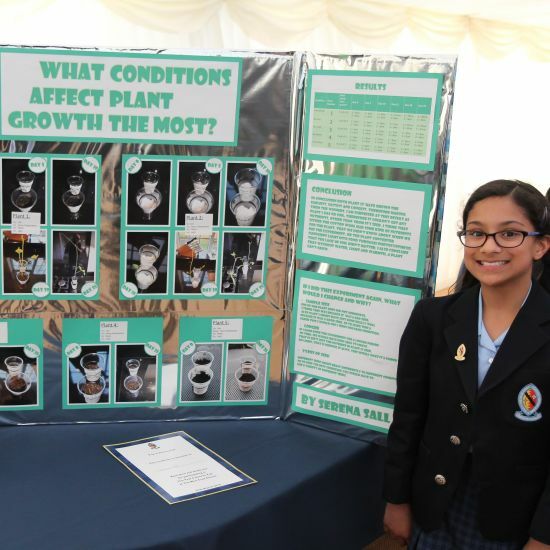 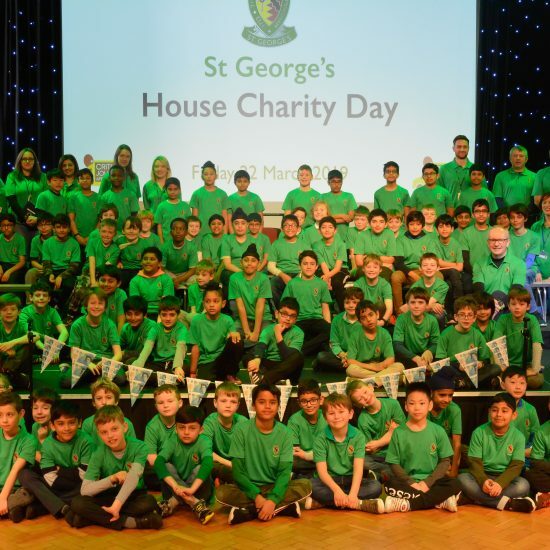 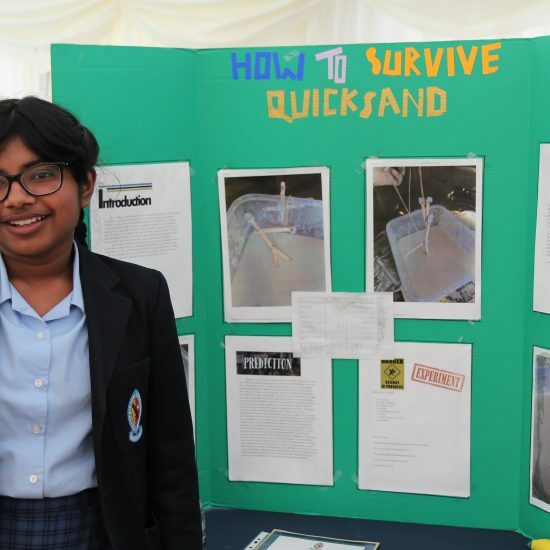 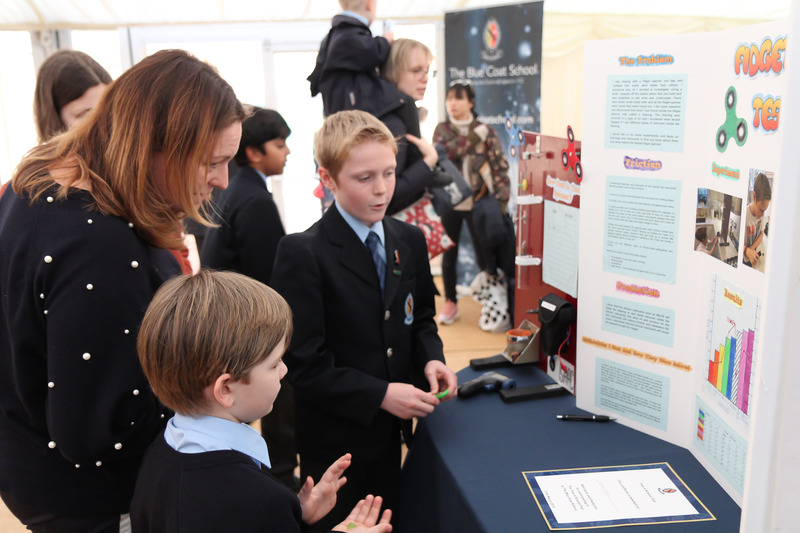 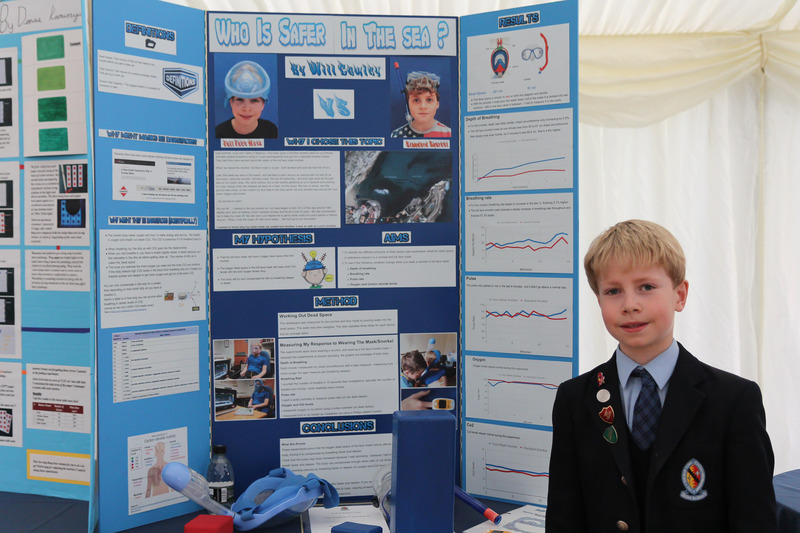 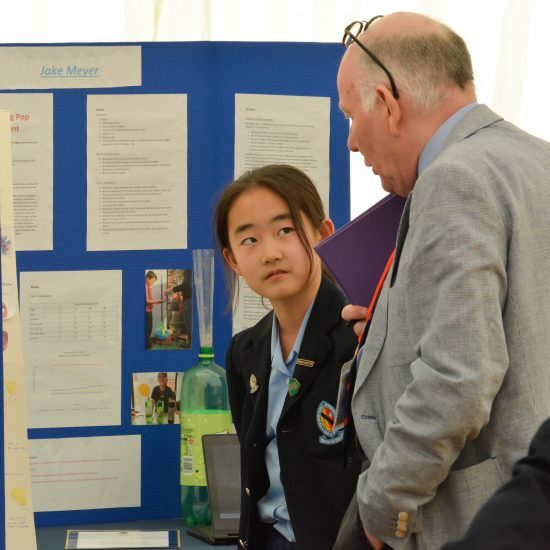 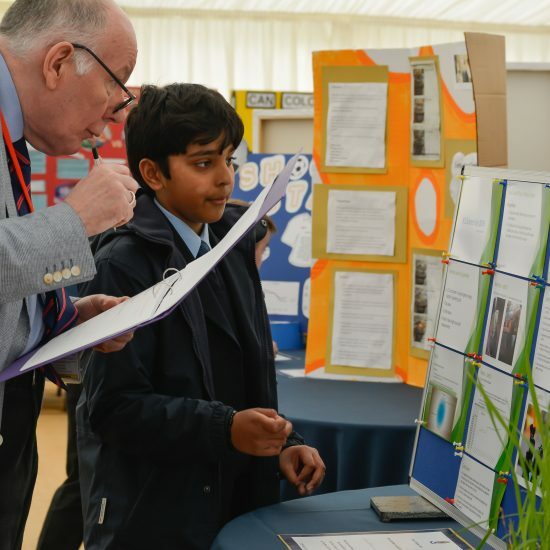 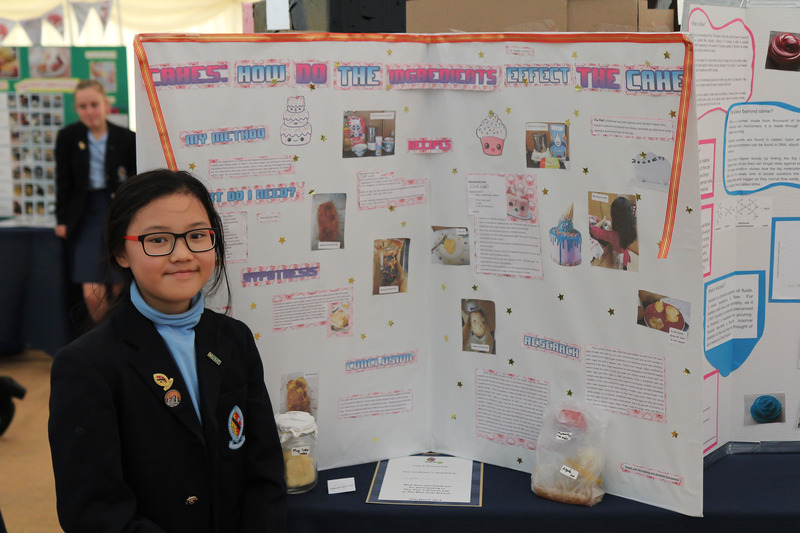 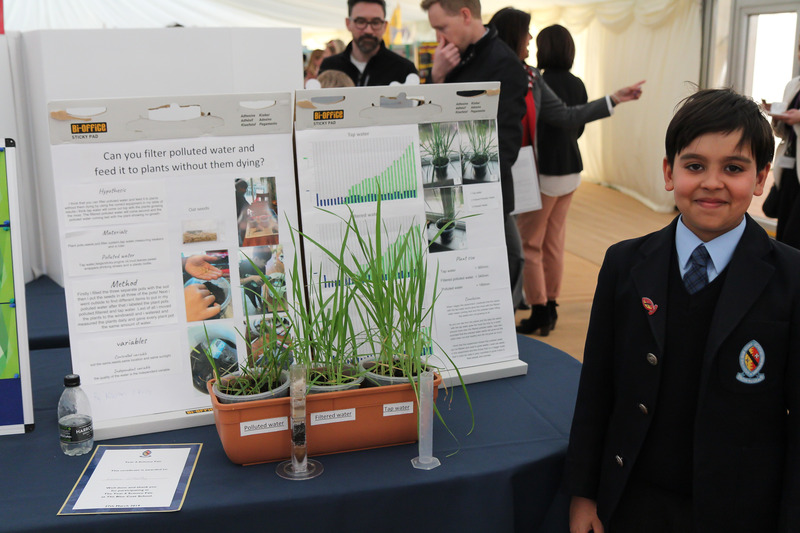 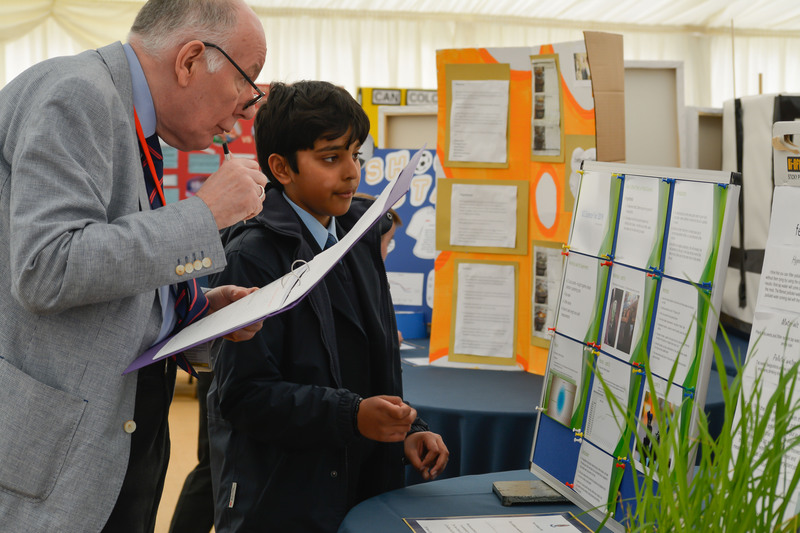 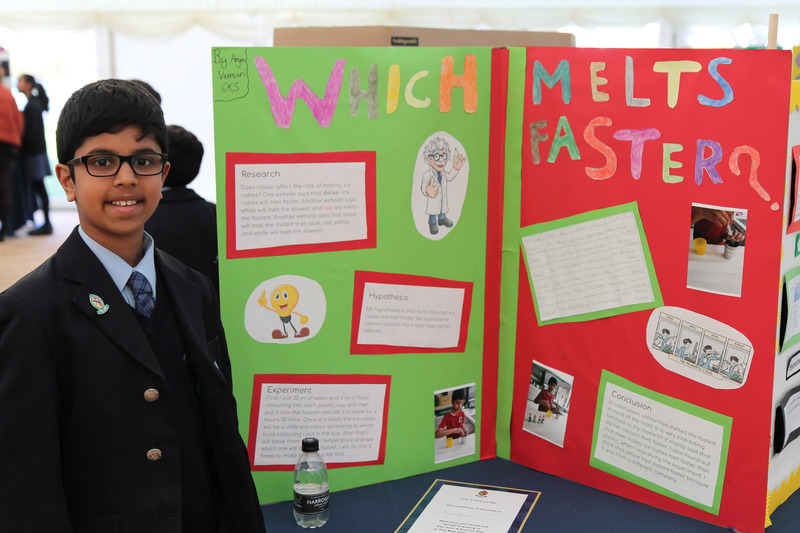 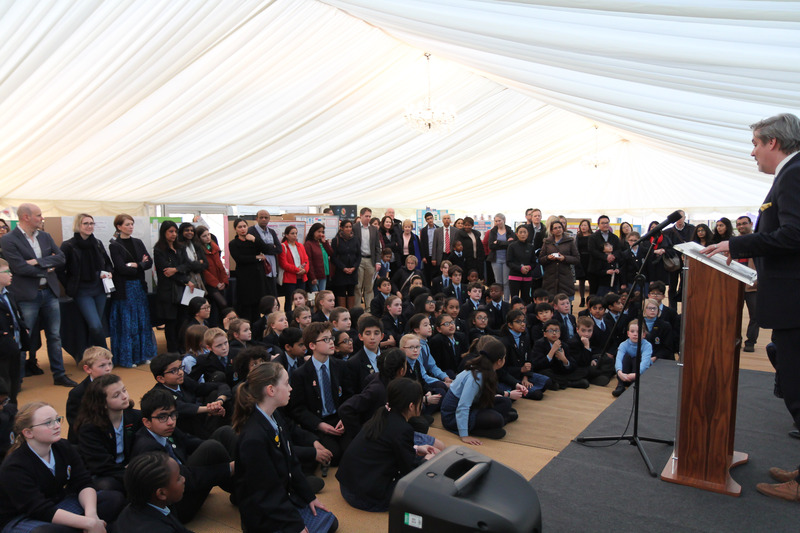 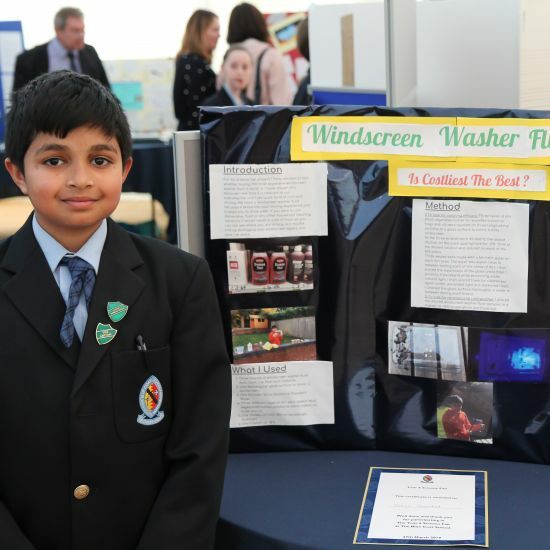 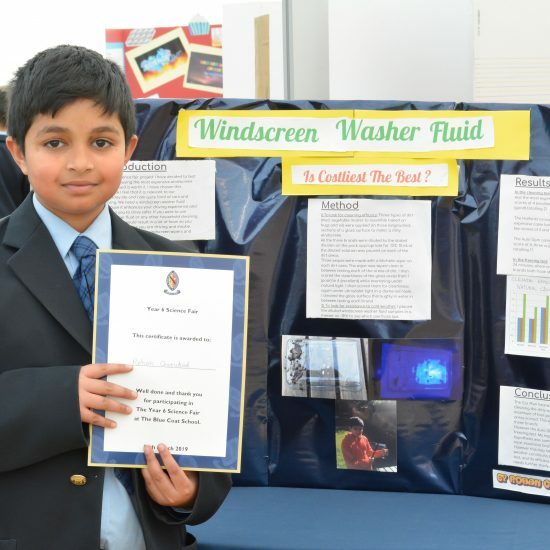 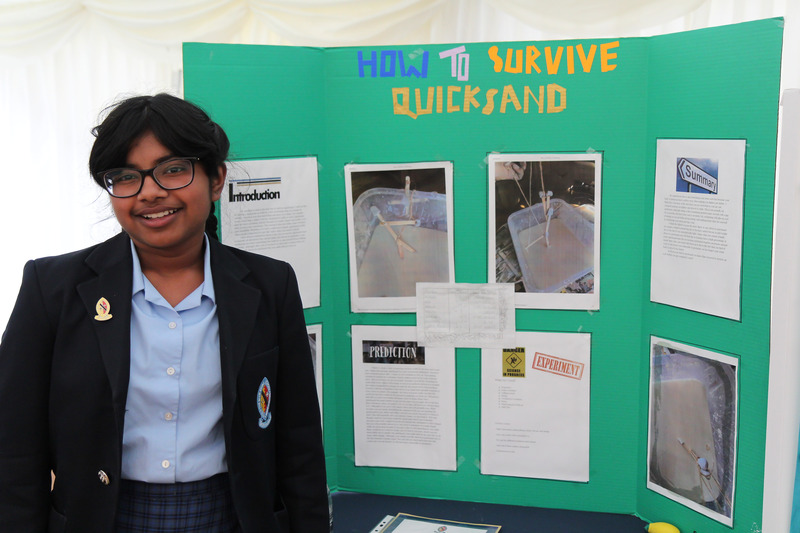 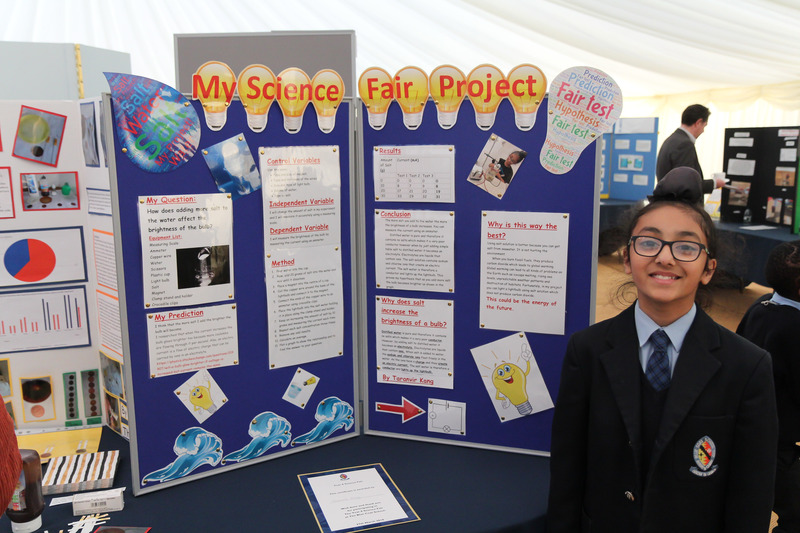 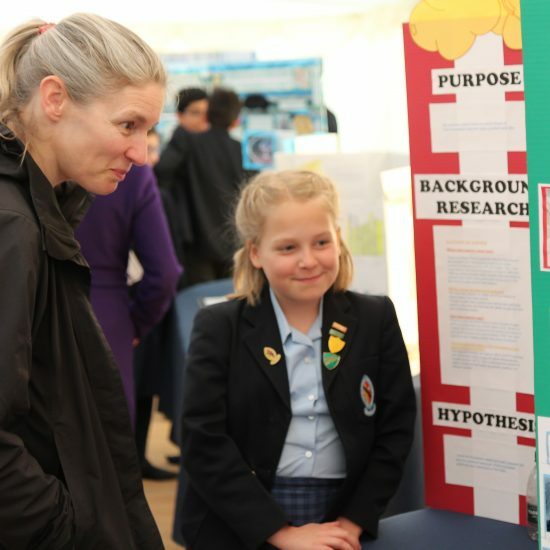 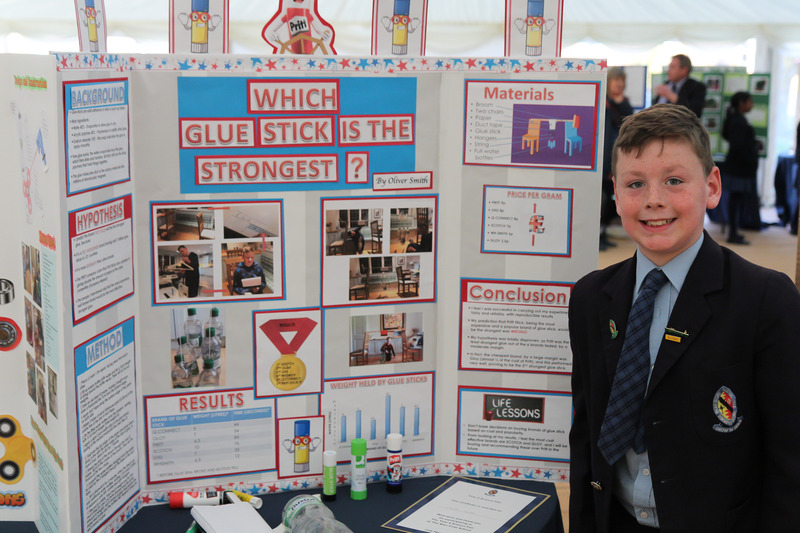 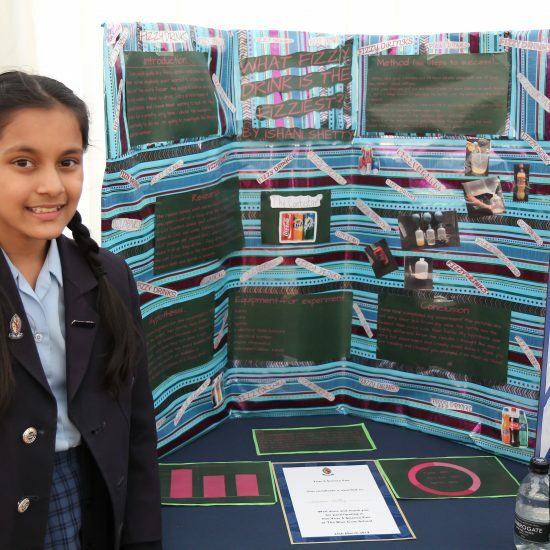 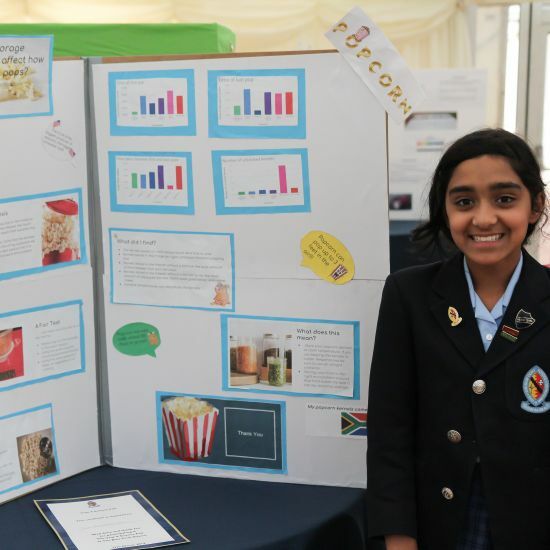 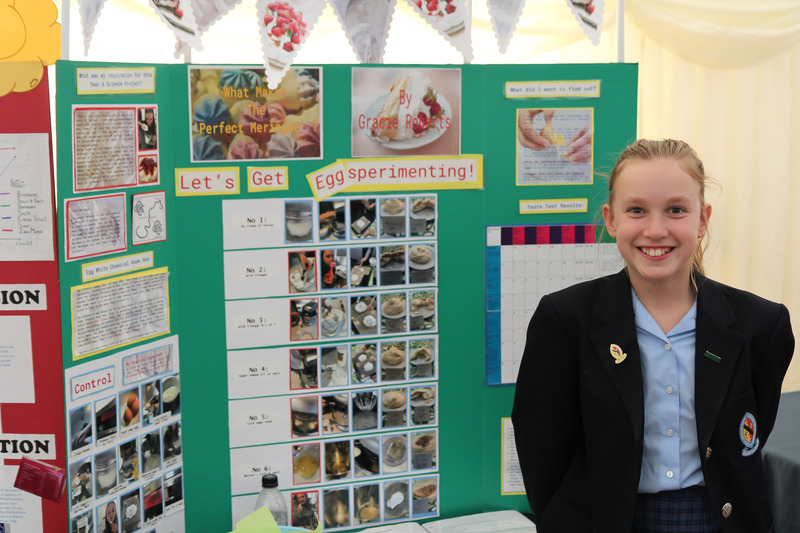 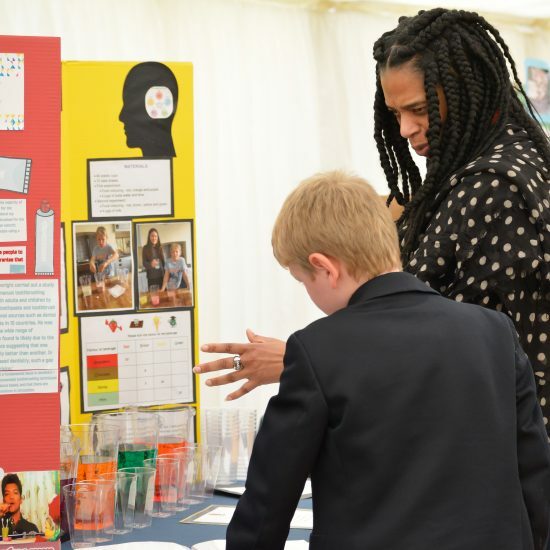 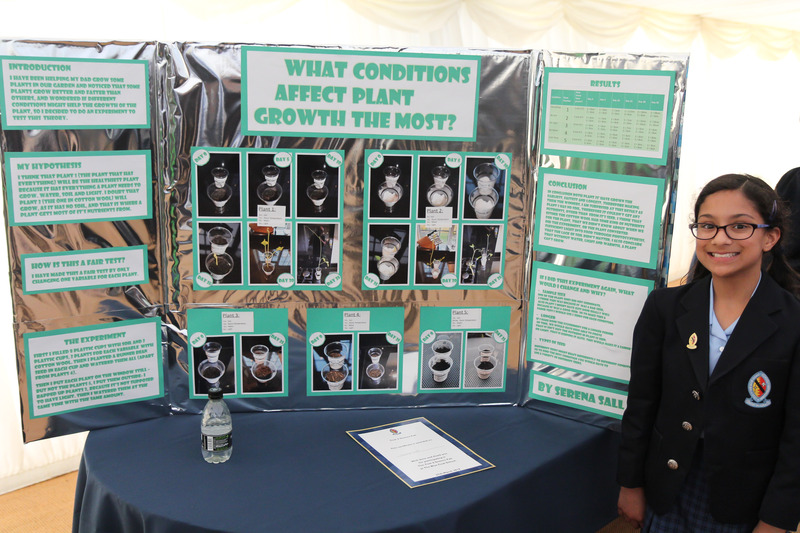 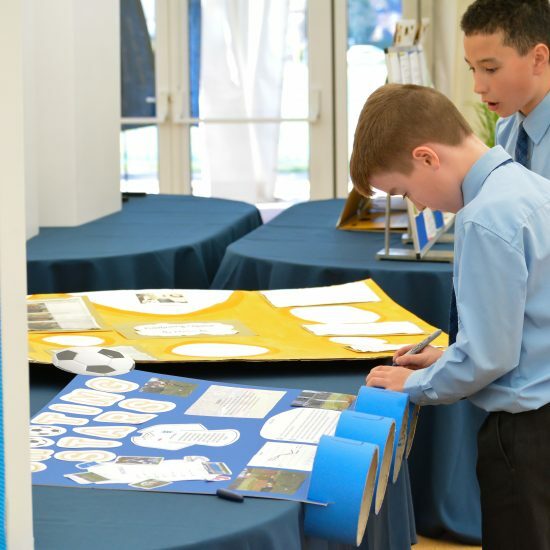 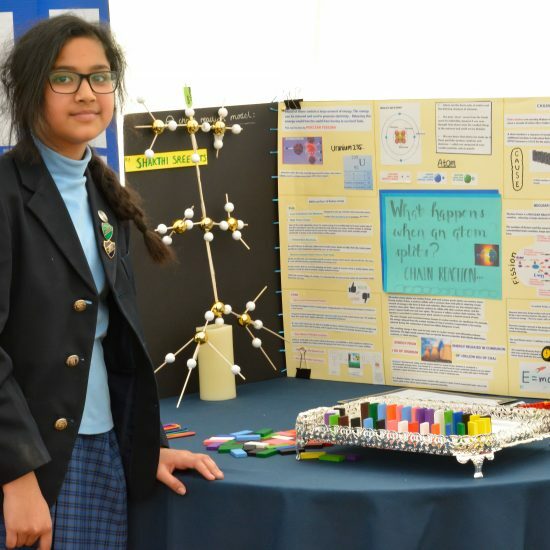 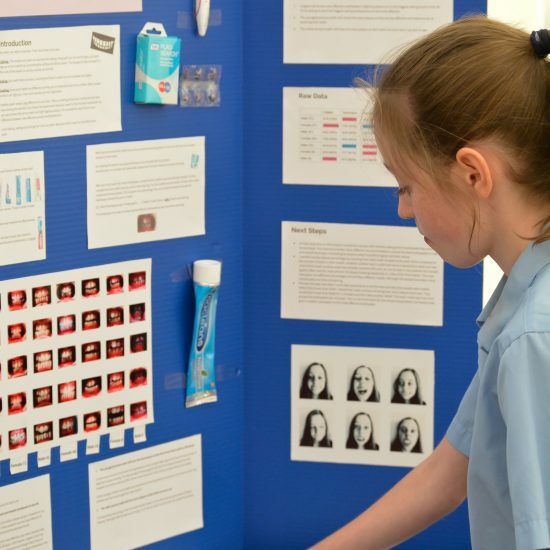 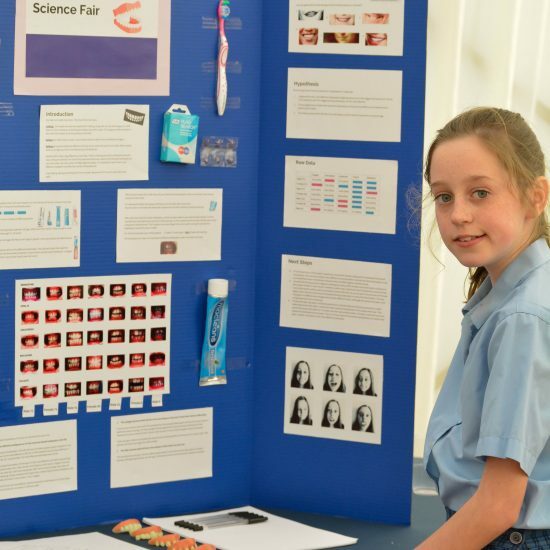 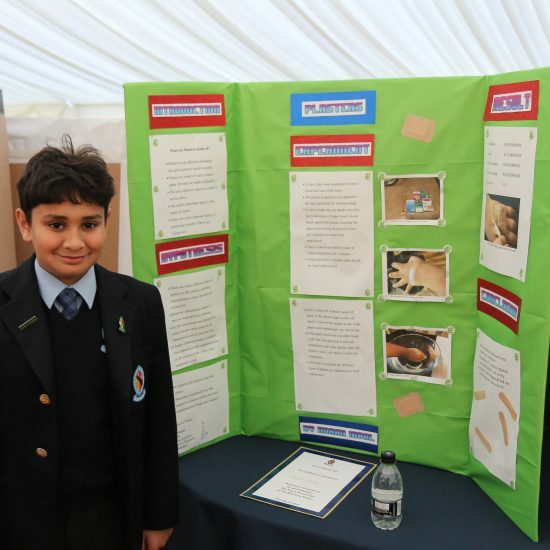 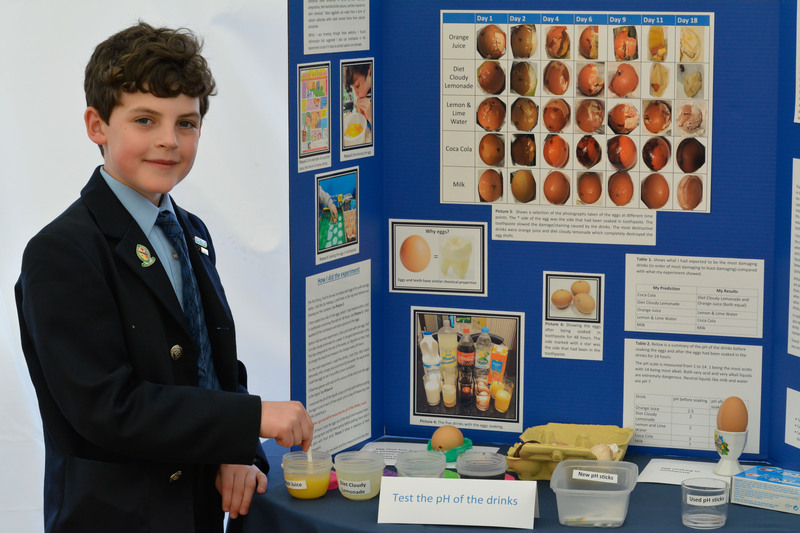 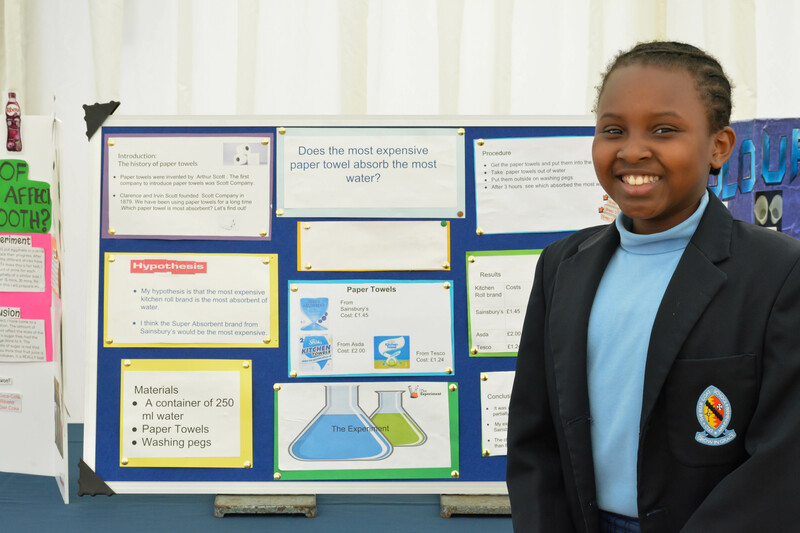 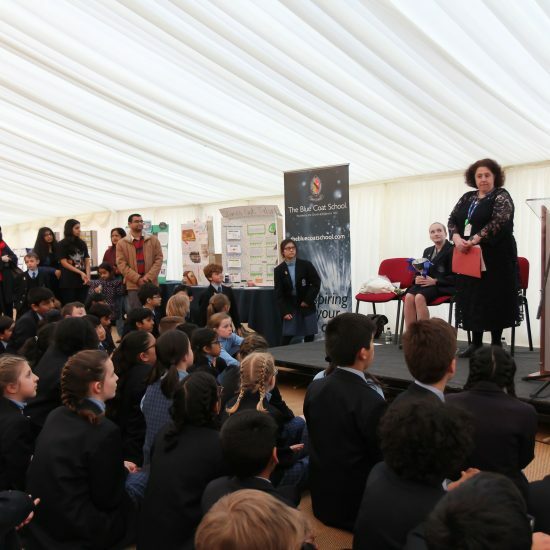 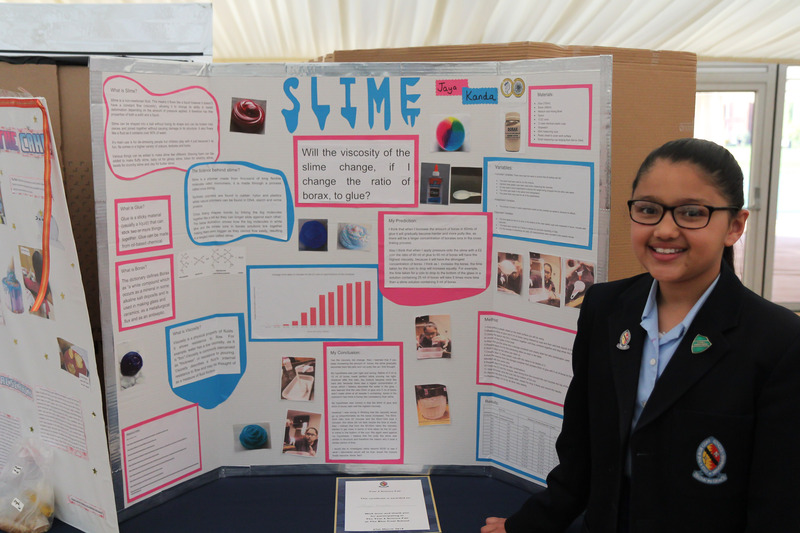 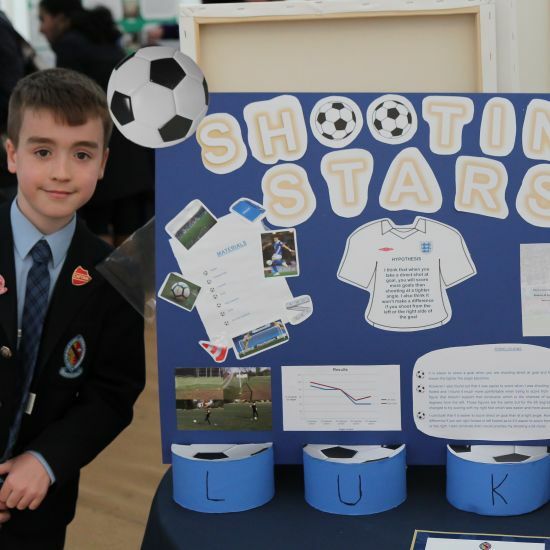 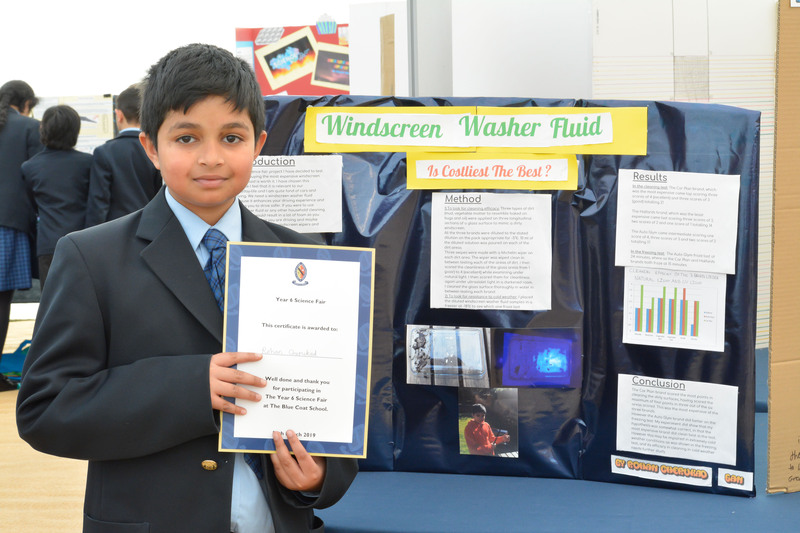 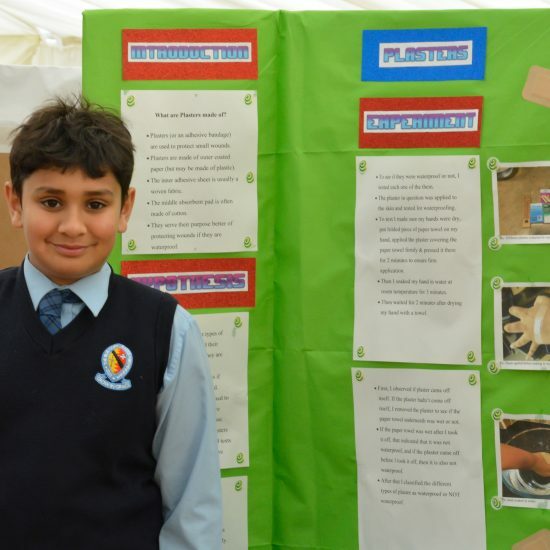 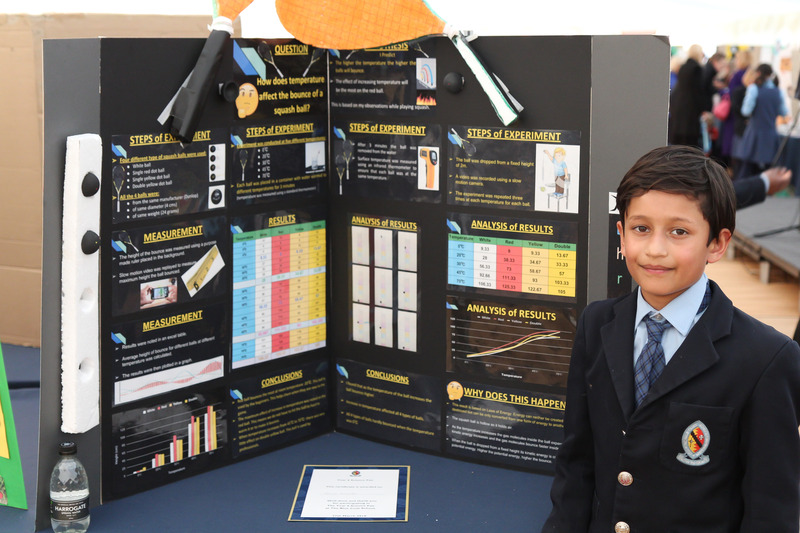 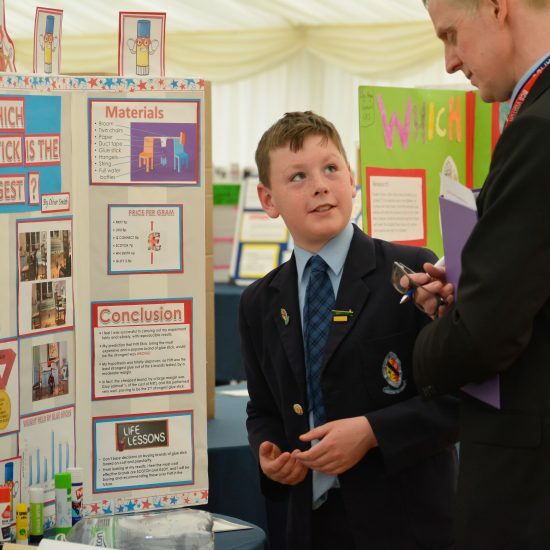 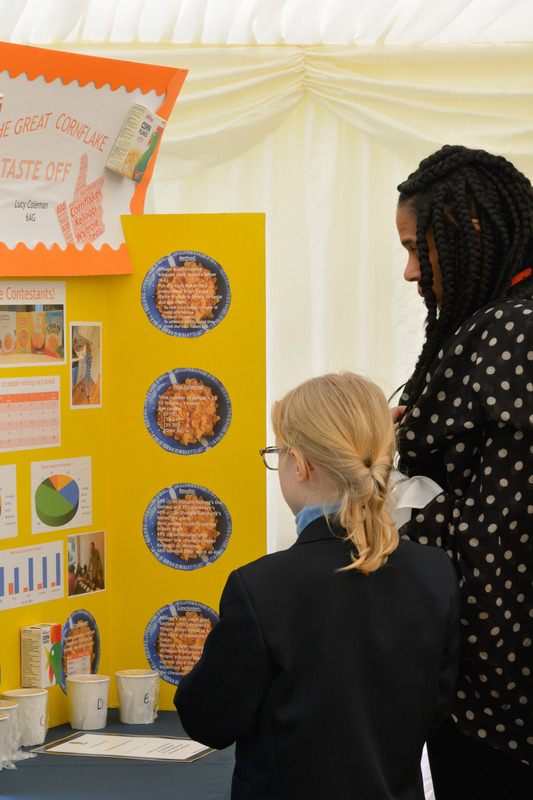 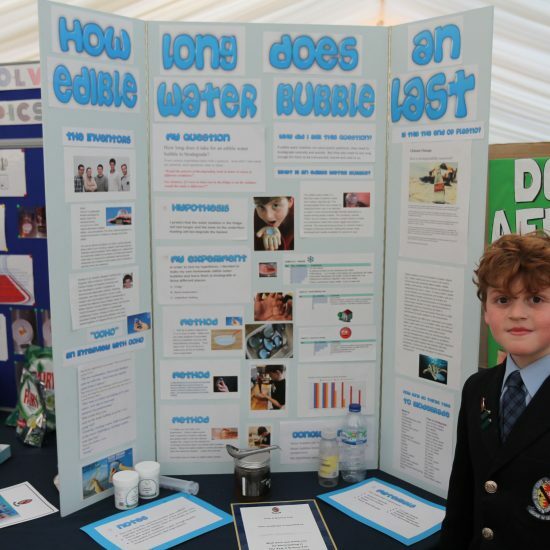 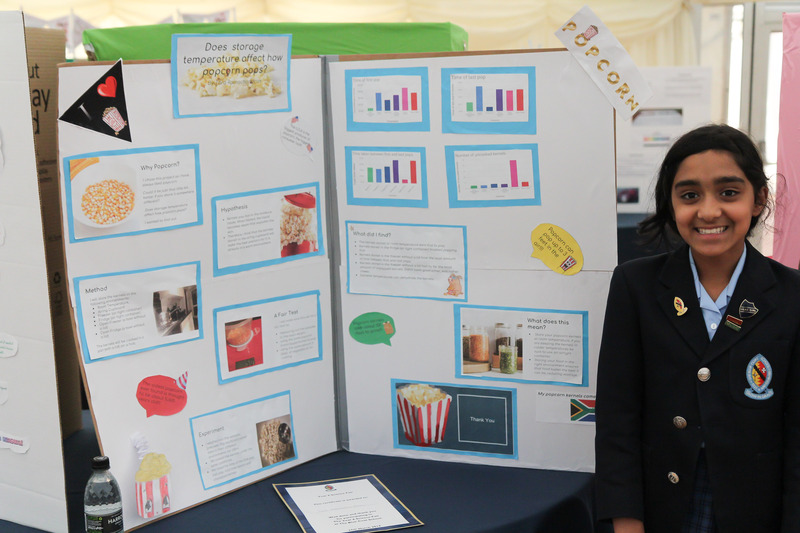 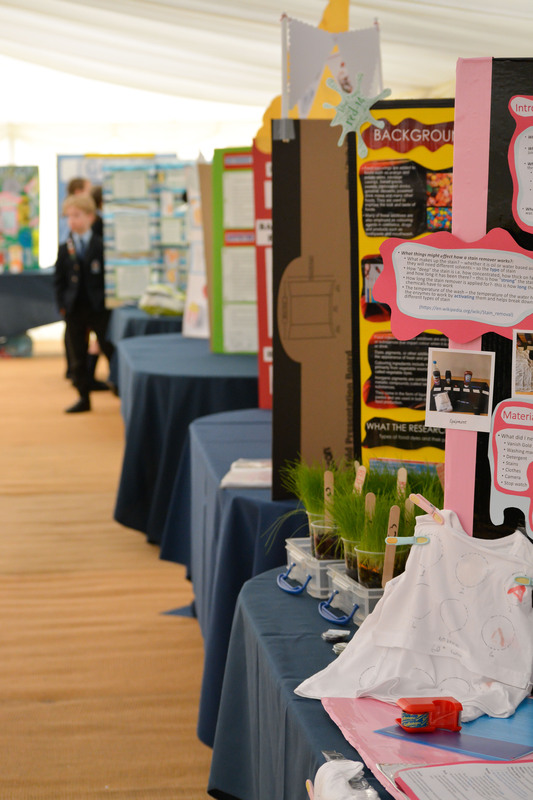 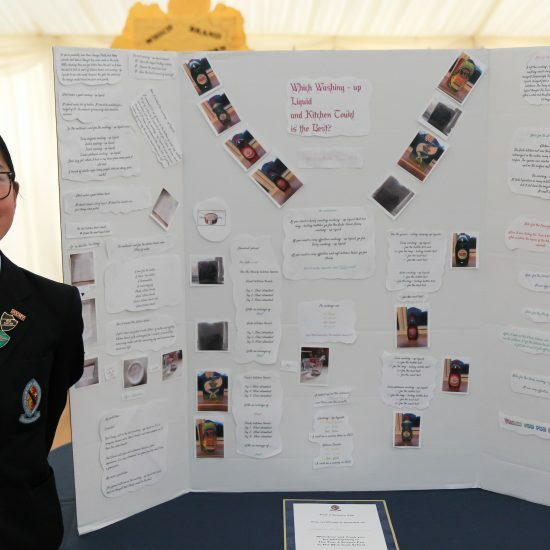 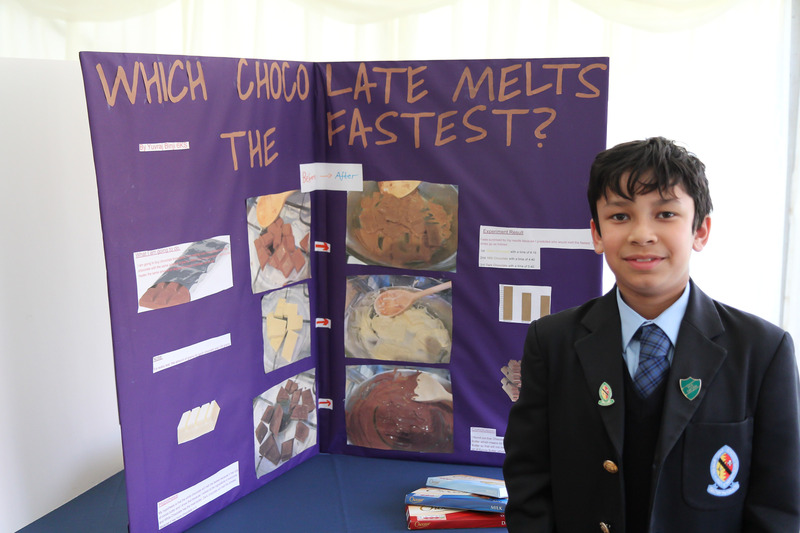 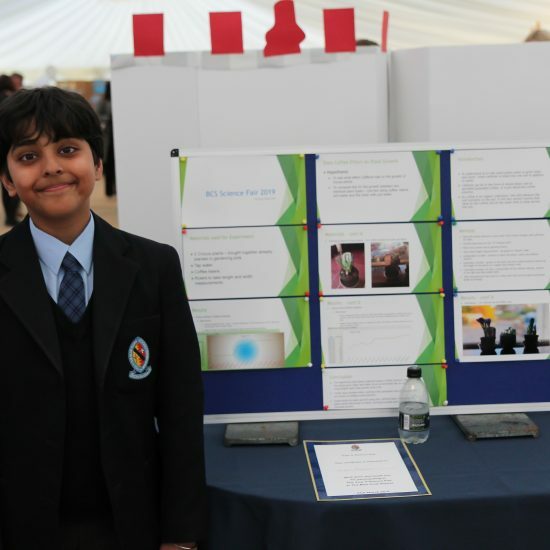 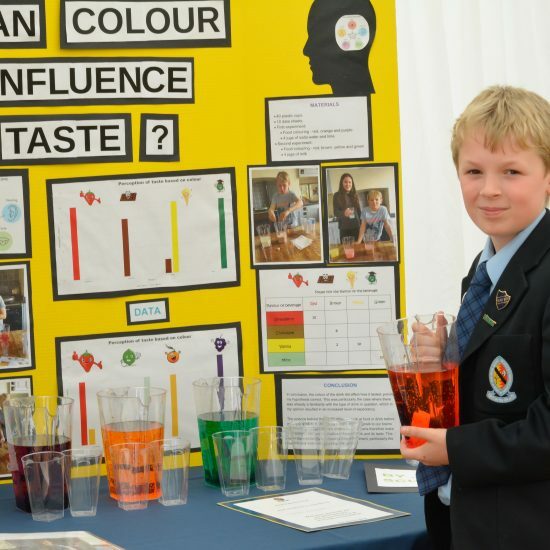 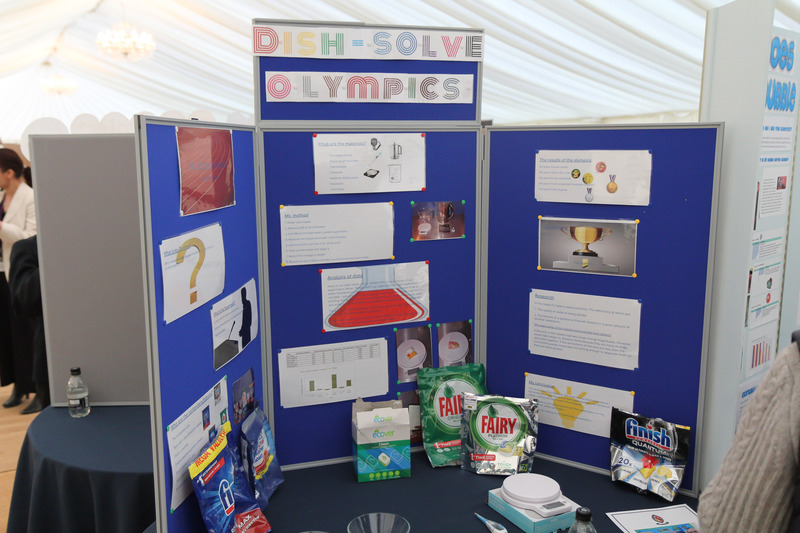 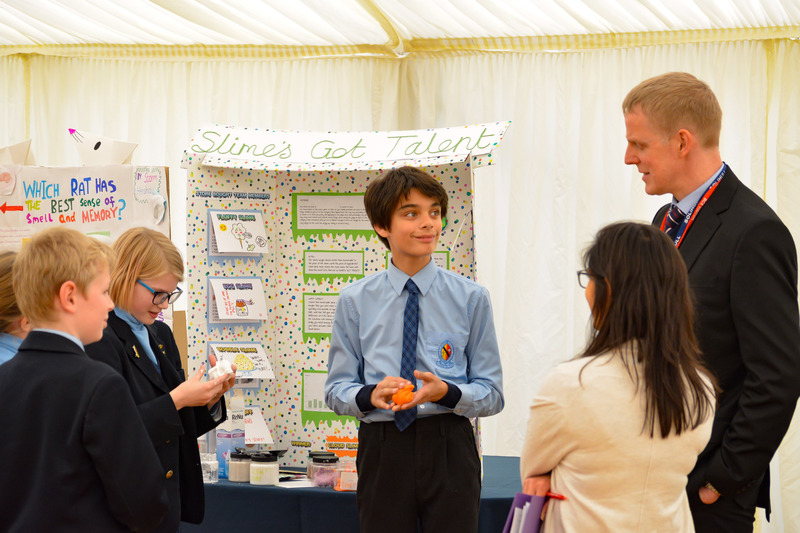 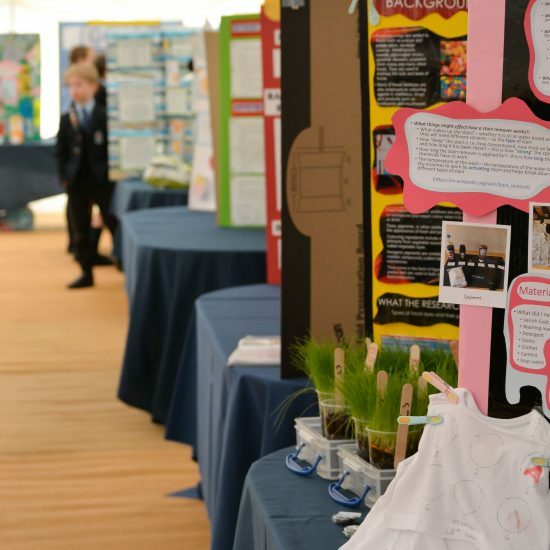 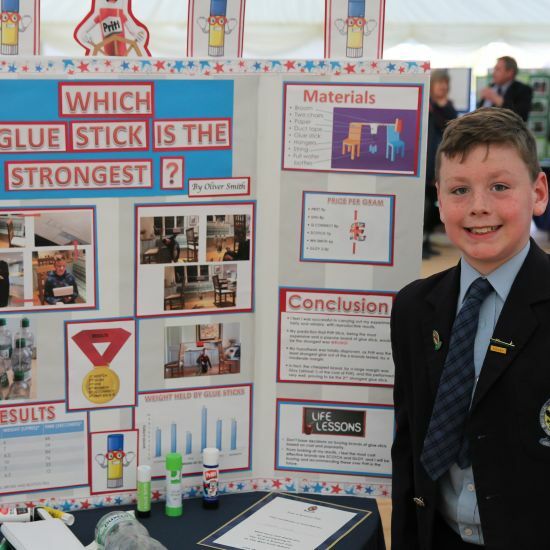 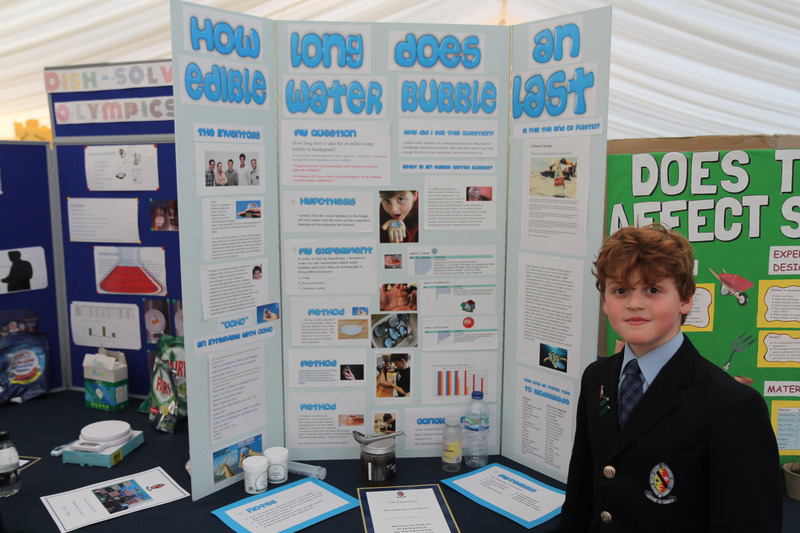 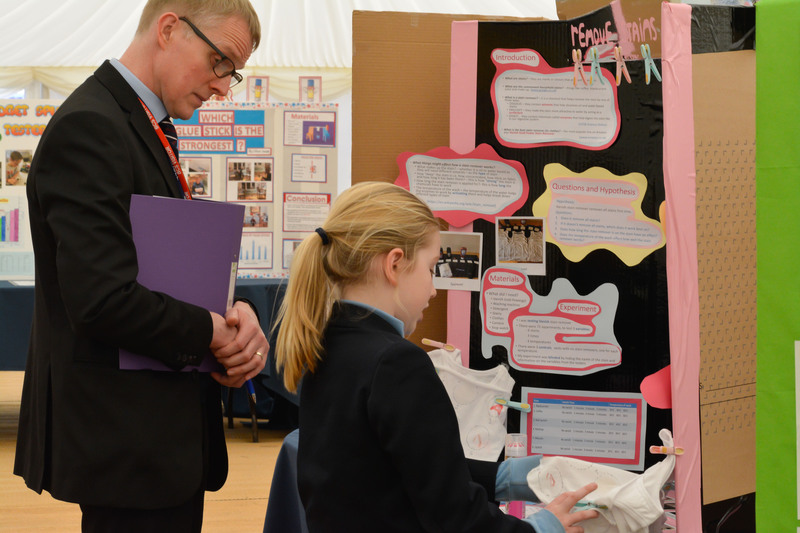 On Wednesday evening, the marquee was the venue for The Blue Coat School Year 6 Science Fair 2019. 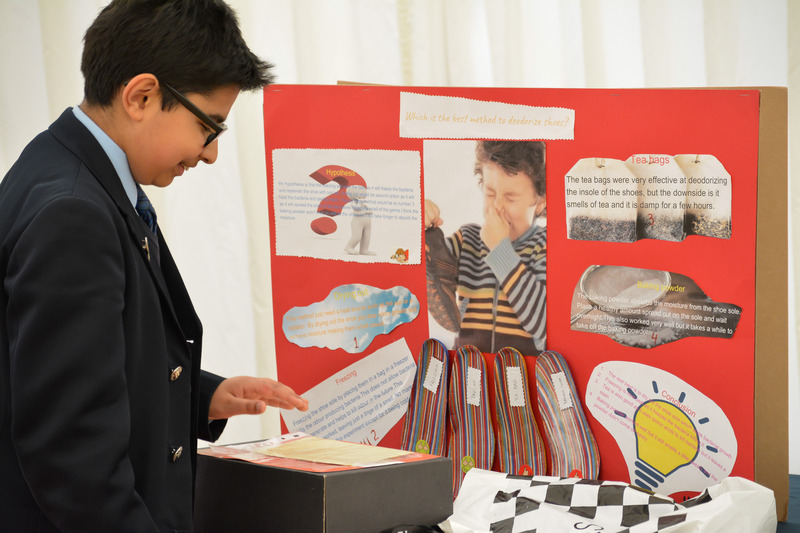 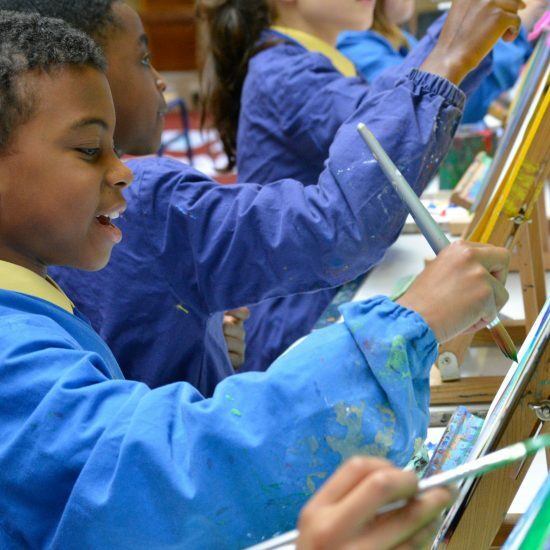 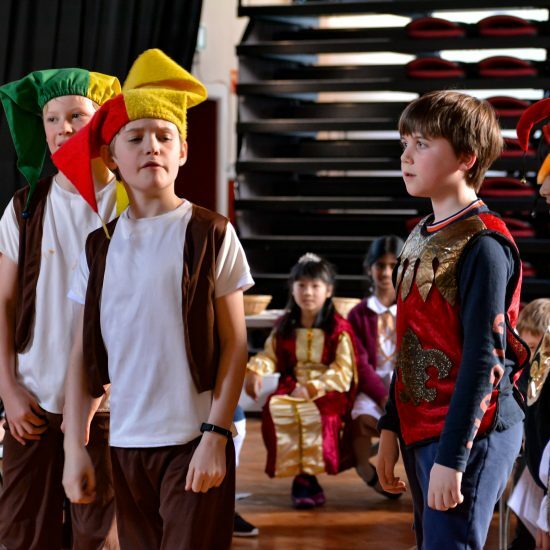 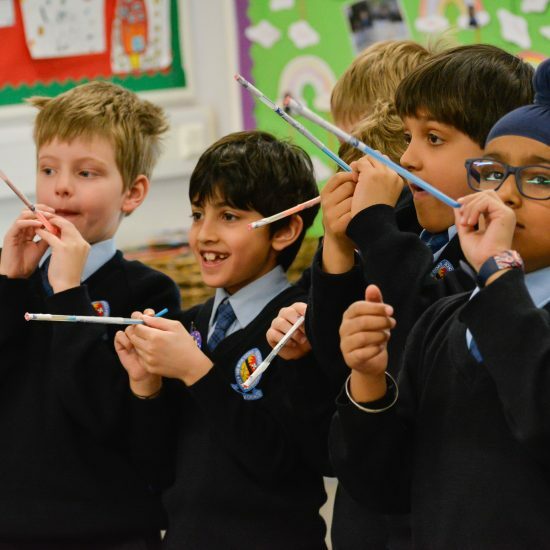 All of our Year 6 children have worked extremely diligently throughout this term and they have produced 76 creative projects covering a diverse range of topics. 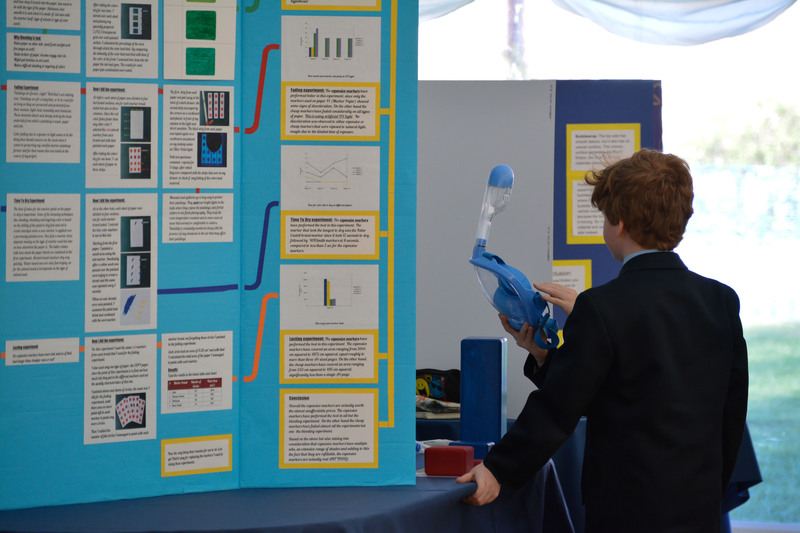 Along their journey their learning, and, at times, their ingenuity, has been most impressive. 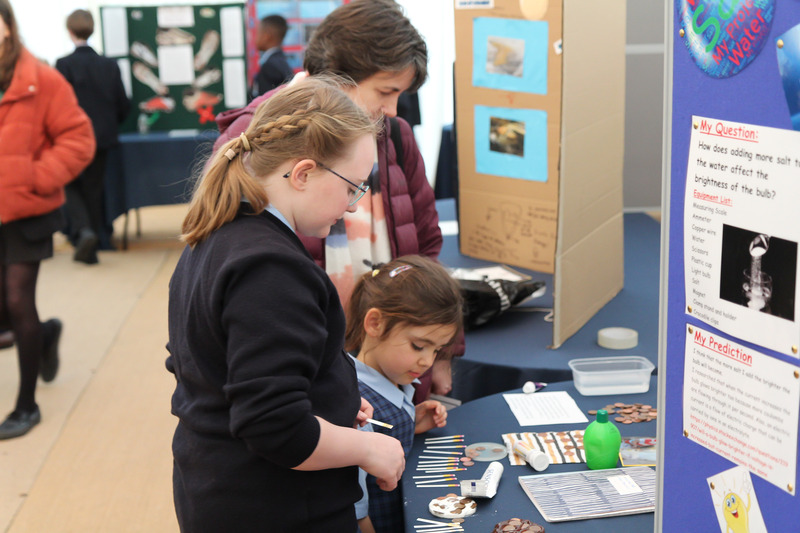 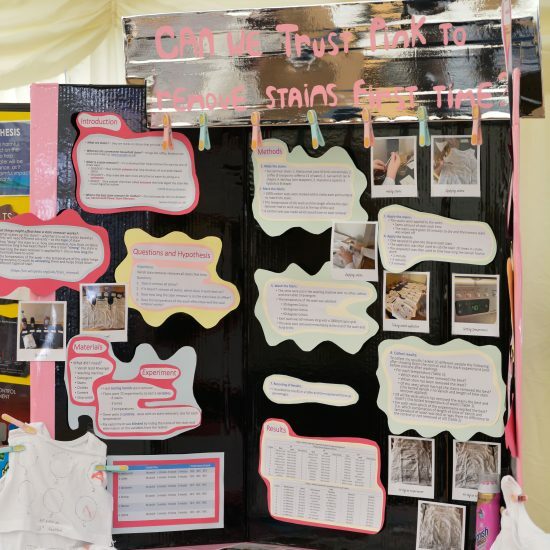 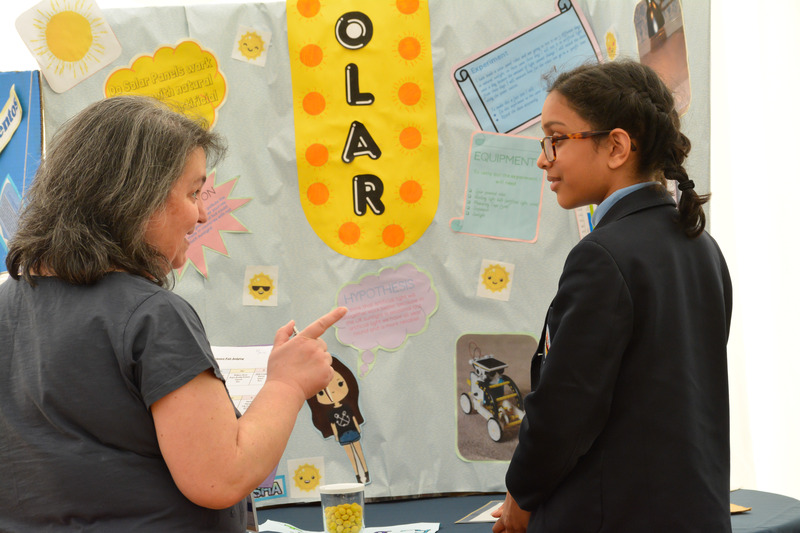 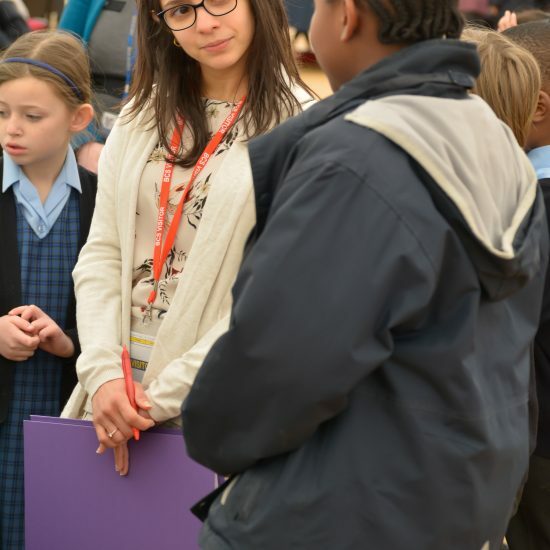 The Science Fair was launched at the beginning of the Lent Term with a presentation to parents and children describing our rationale for running the projects and detailing what a ‘good project’ would involve. 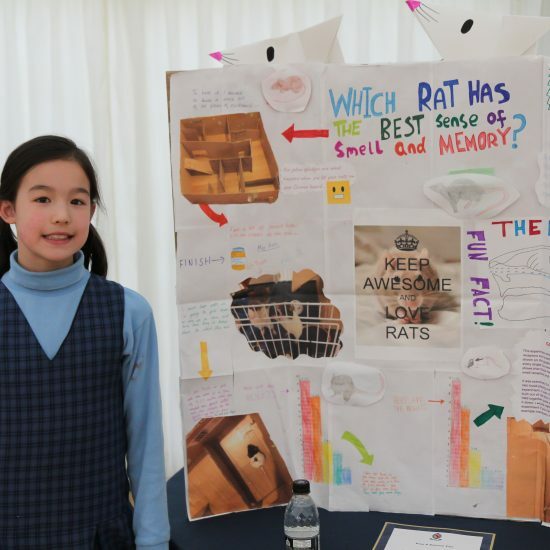 Perhaps the most challenging part of the entire process for the children was to determine the topic, and specifically, the key scientific question, to be investigated. 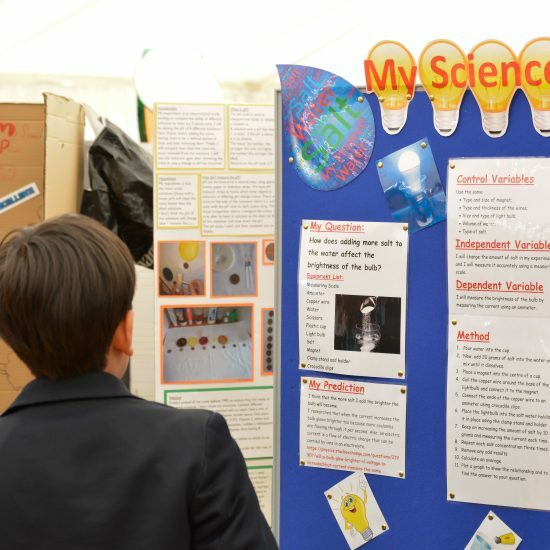 The children worked through all the steps of the Scientific Method: Question, Research, Hypothesis, Method (including the ‘Fair Test’ principle), Results, Analysis, Conclusion. 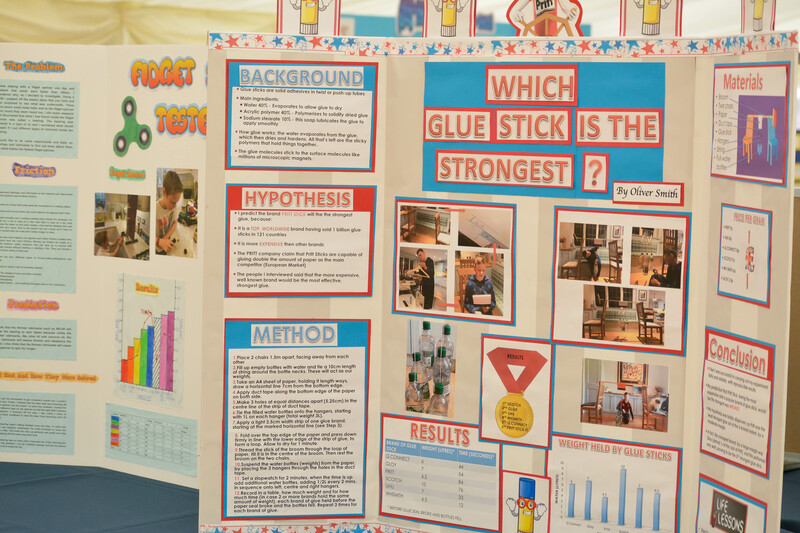 The projects addressed a variety of fascinating questions such as: Which glue stick is the strongest? 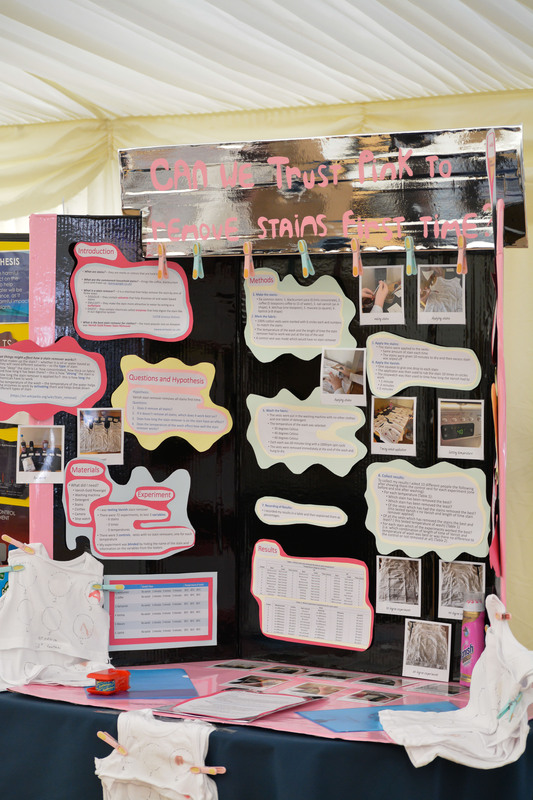 Can we ‘trust pink’ to remove stains the first time? 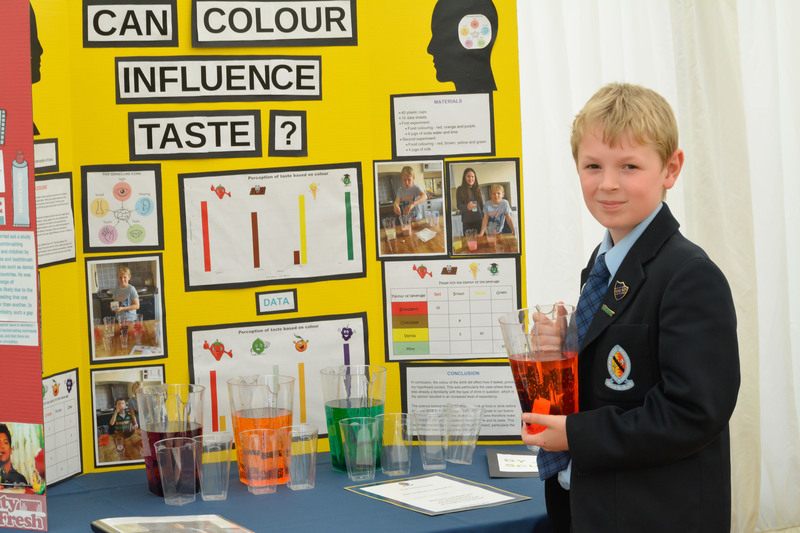 Can colour influence taste? 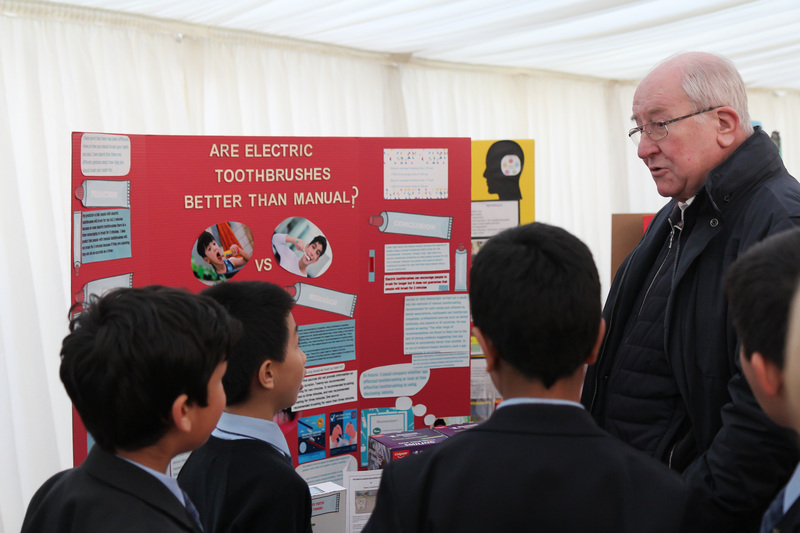 Are electric toothbrushes better than manual? 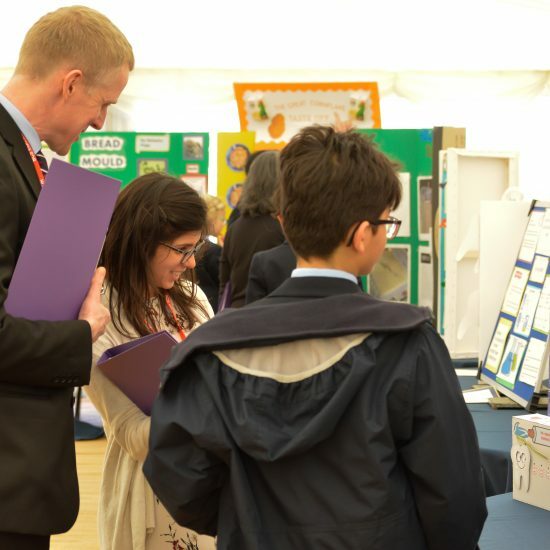 On Tuesday we welcomed five judges: Dr Maria Pavlidou – School Liaison Officer in the School of Physics and Astronomy at the University of Birmingham, Mark Davies – Teacher of Science at Solihull School, Roxanne Irani – Teacher of Biology at King Edward’s School, Birmingham, Mel Hopkinson – KEHS Outreach and Sandra Jamieson – Harborne Academy Science Department. 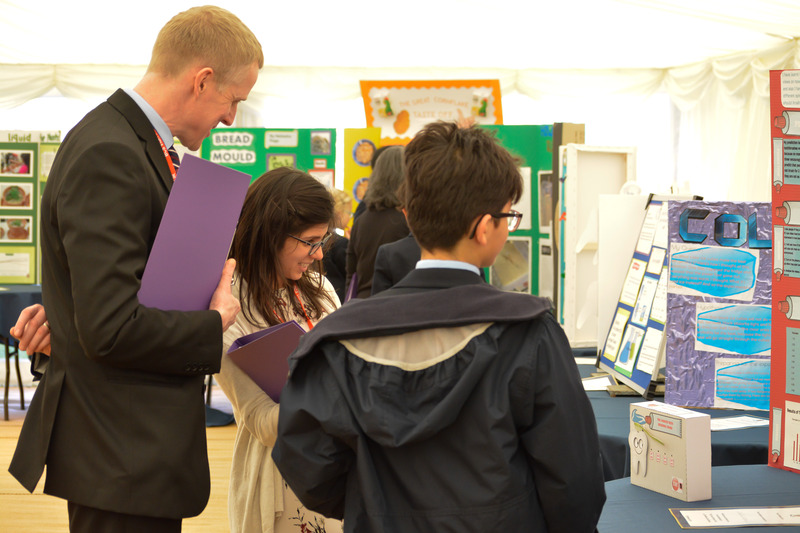 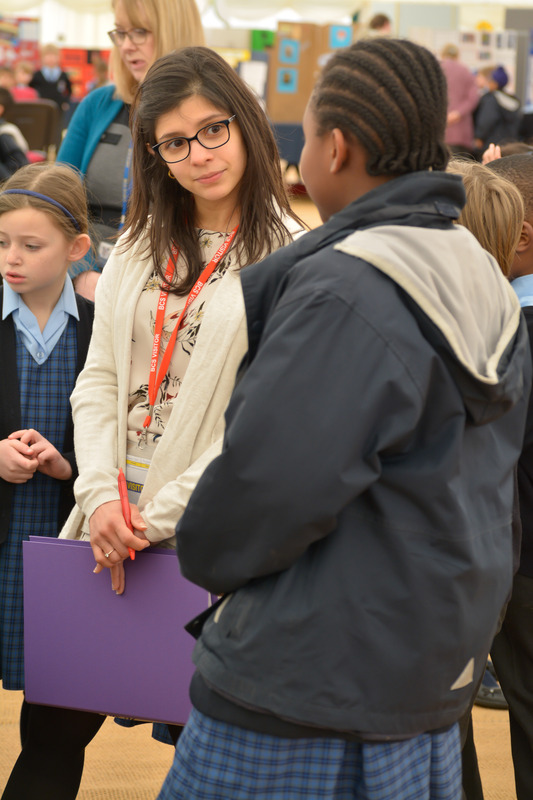 Each child talked to a judge for approximately ten minutes about their project. 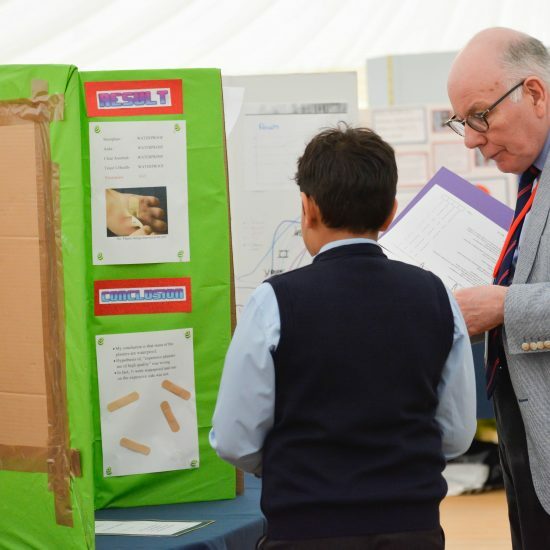 The judges scored the projects according to criteria shared with children and parents at the beginning of the projects. 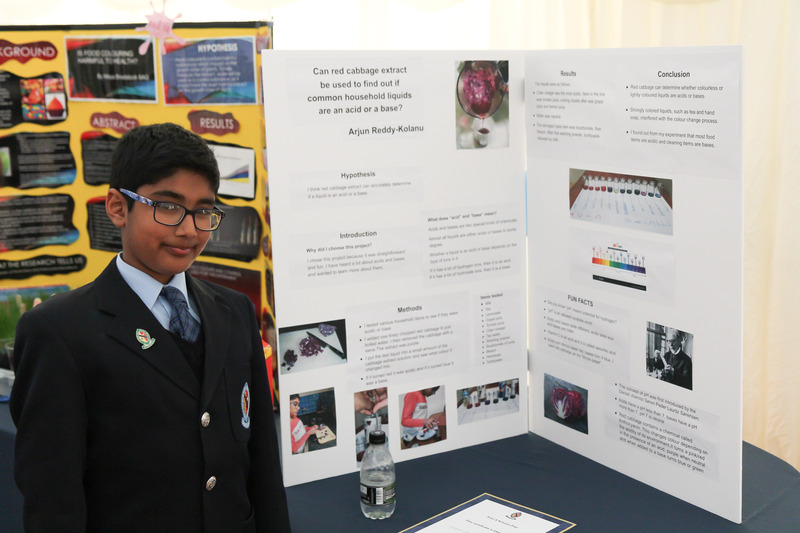 This covered creativity, scientific thought, thoroughness, skill and clarity. 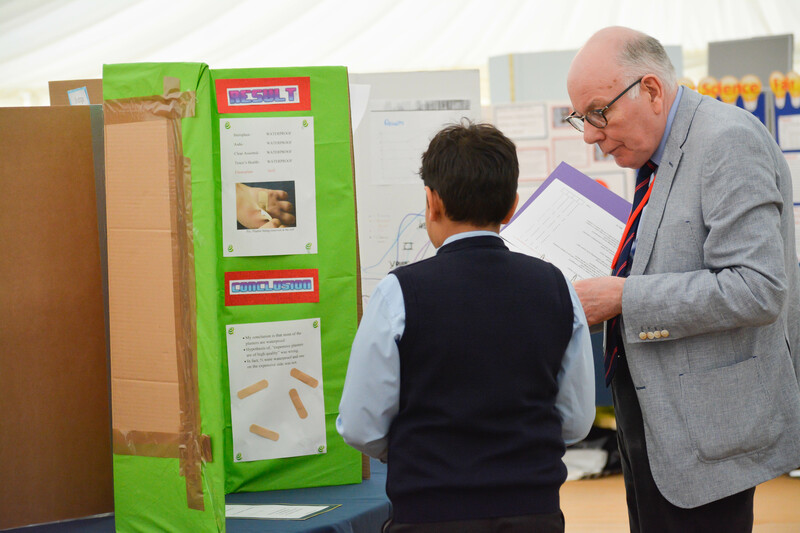 The judges conferred after each session and revisited a number of the projects together. 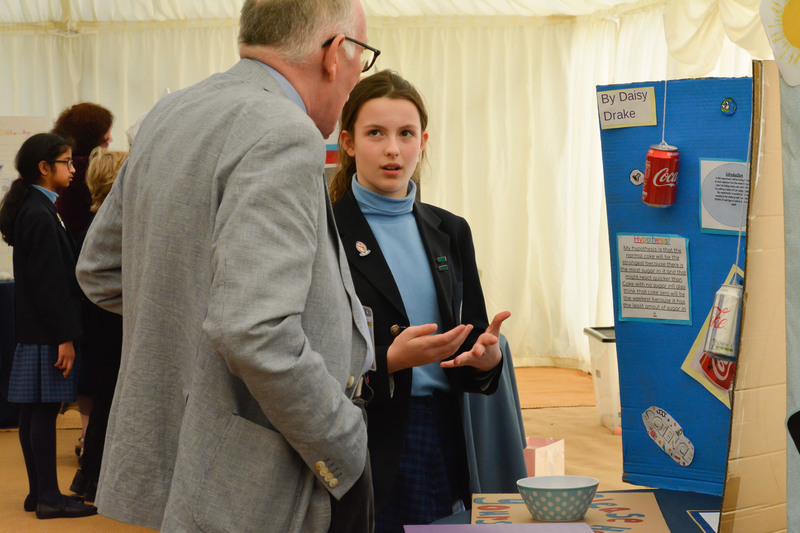 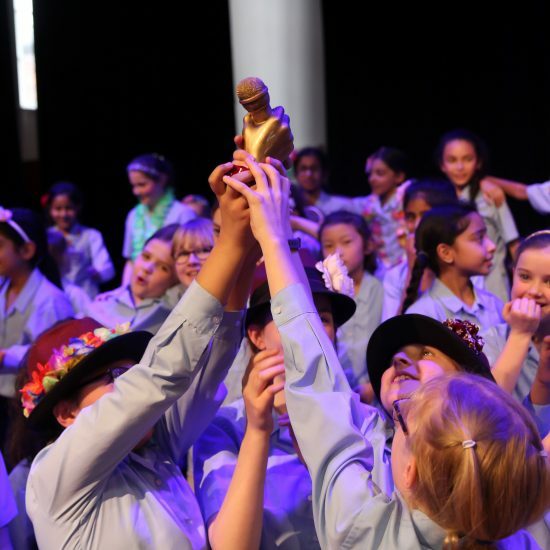 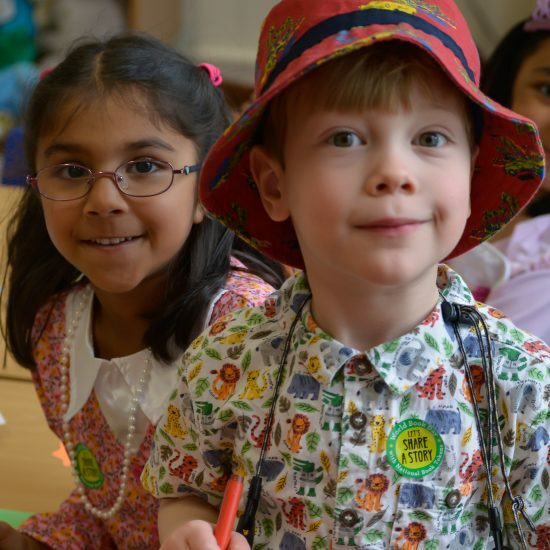 At the end of the day, deliberations took place and they came to unanimous decisions with eight children receiving Highly Commended and one child determined to be the overall winner. 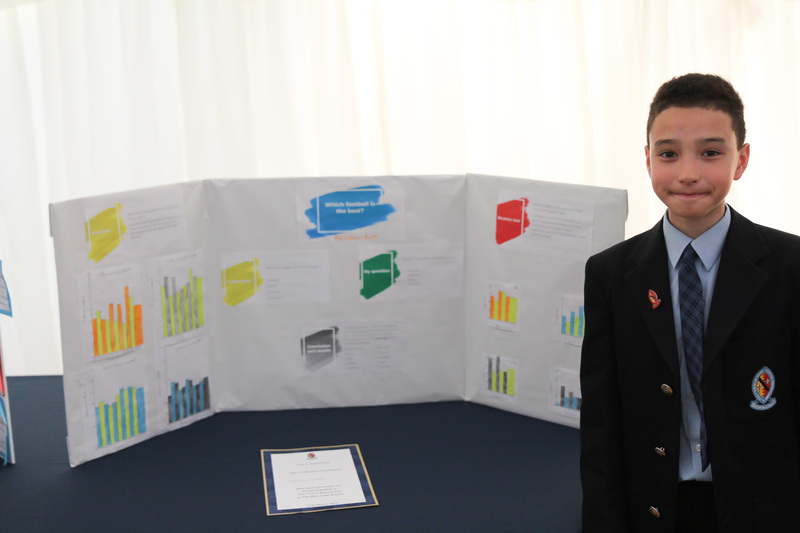 A Highly Commended project scored well in all five key areas, but our winner stood out from the rest. 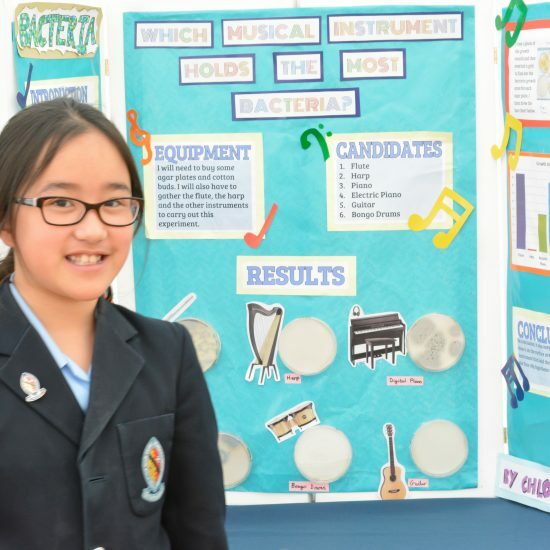 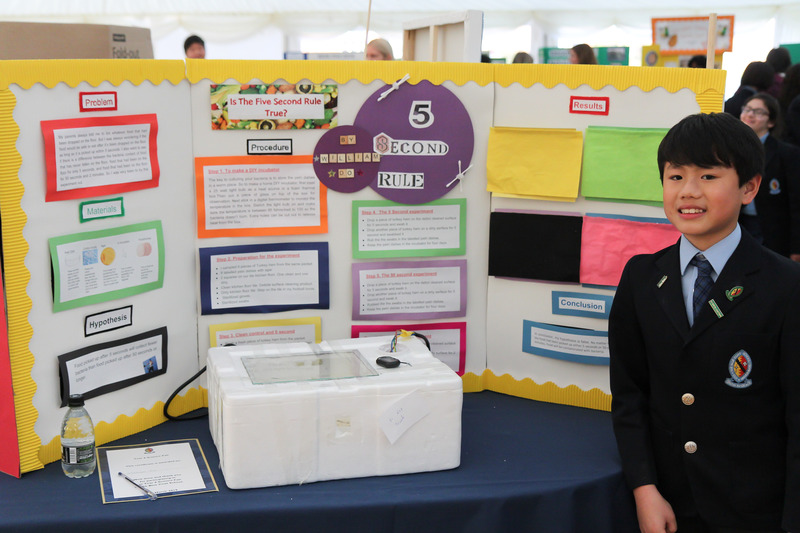 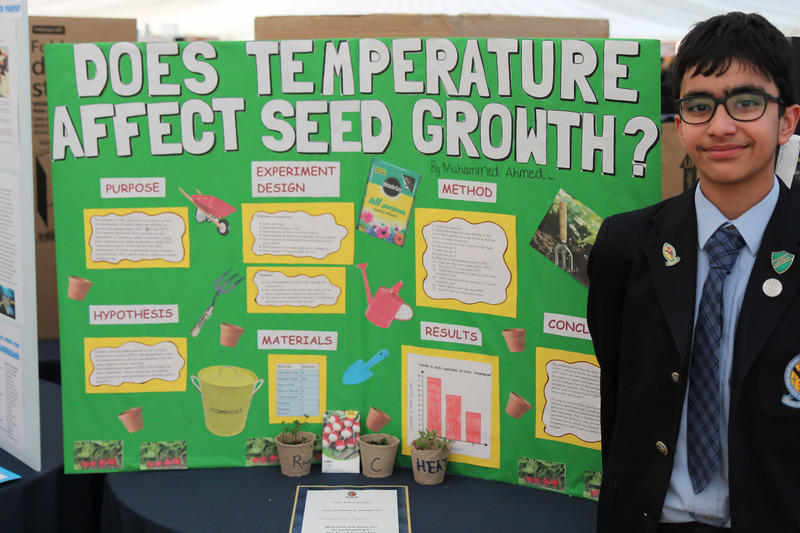 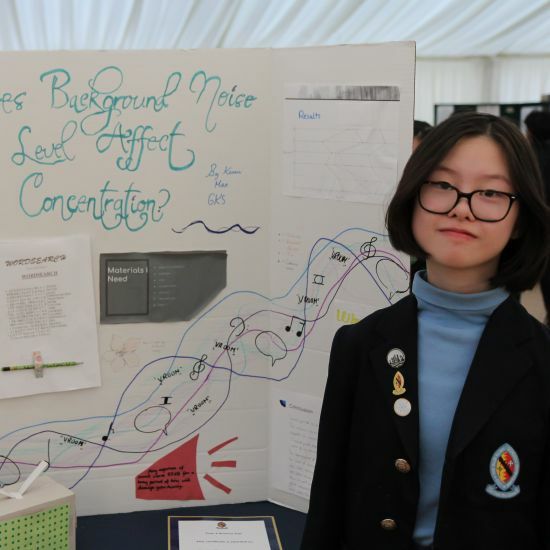 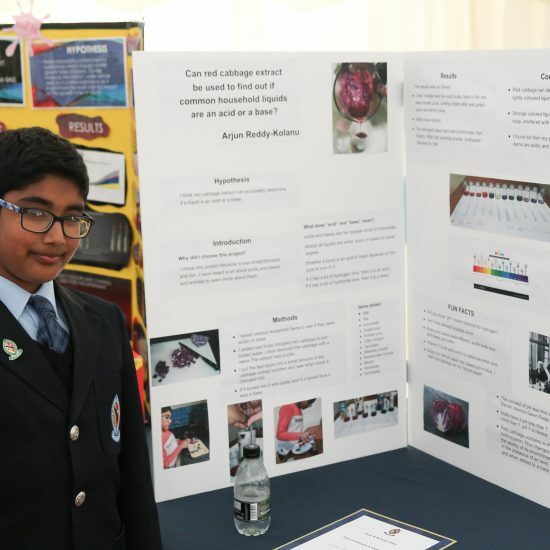 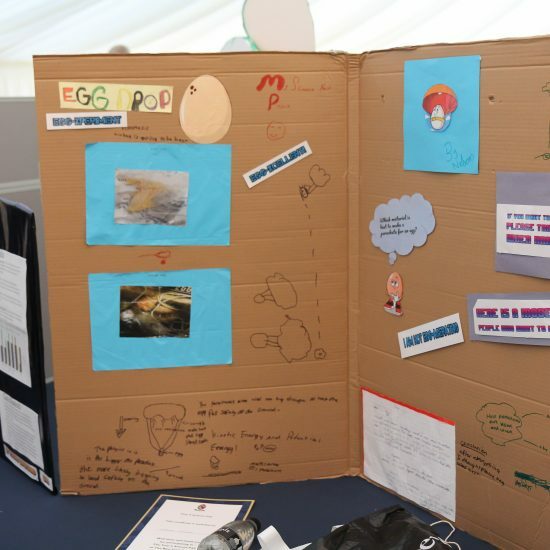 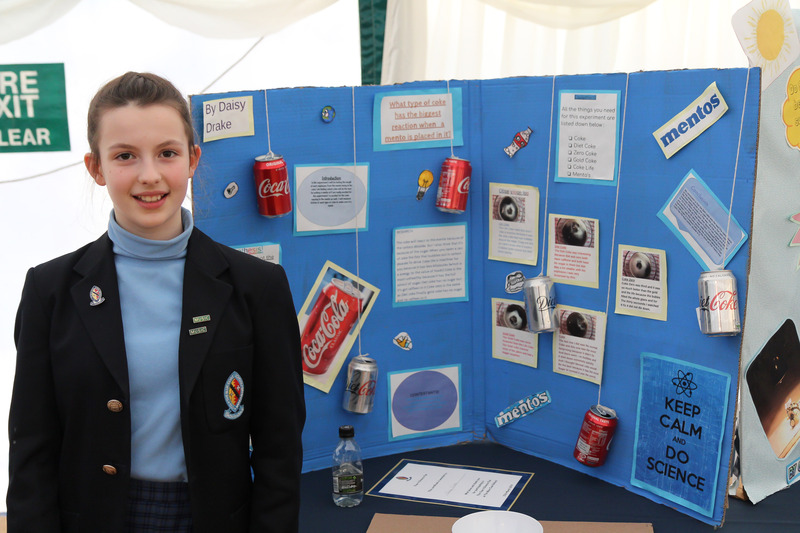 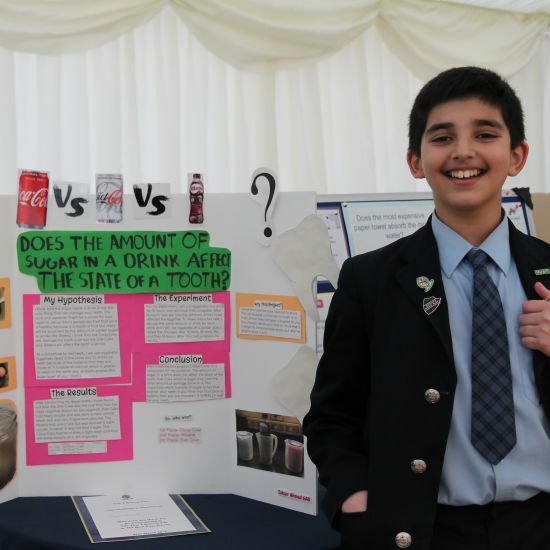 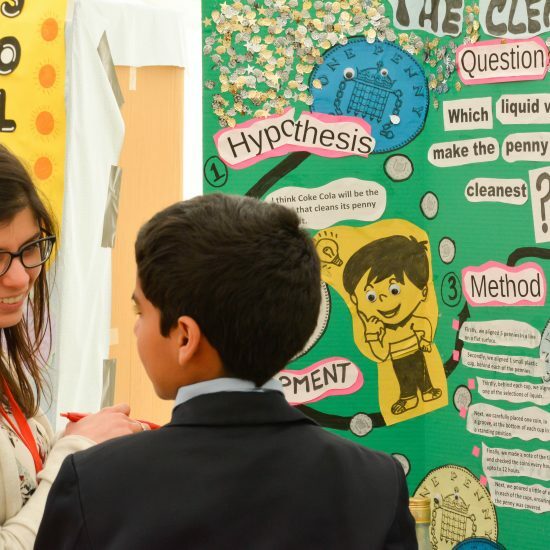 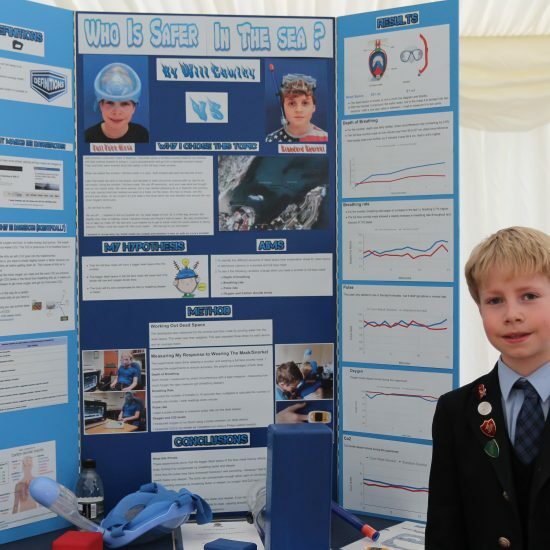 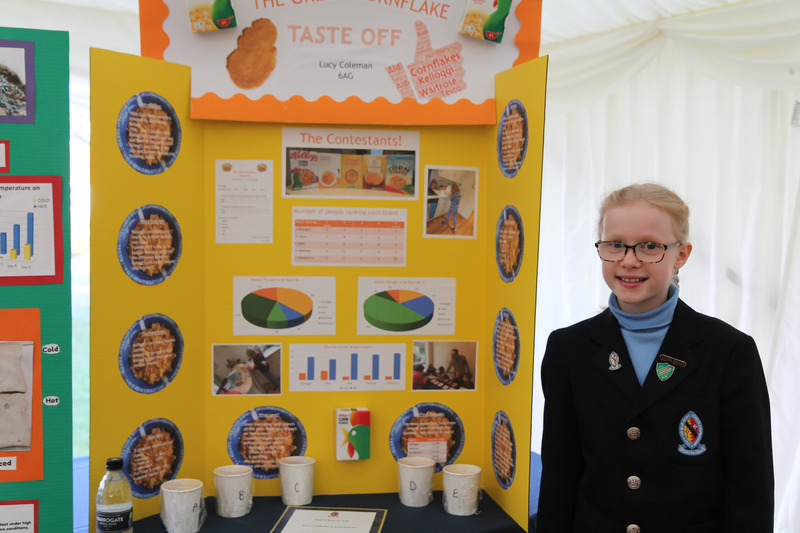 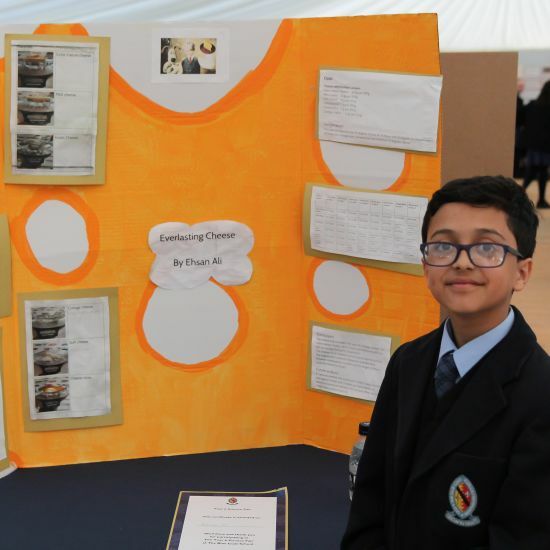 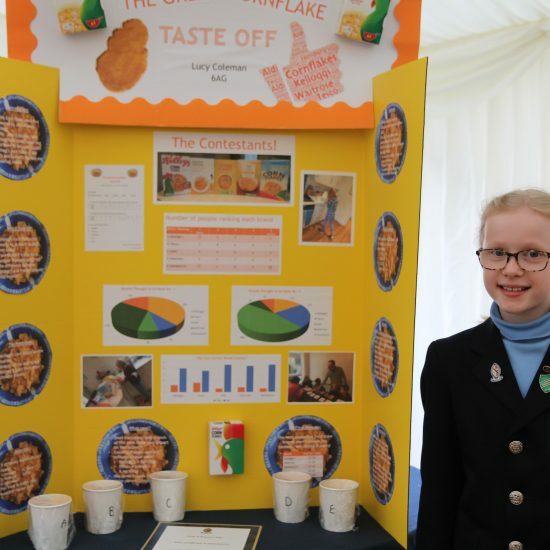 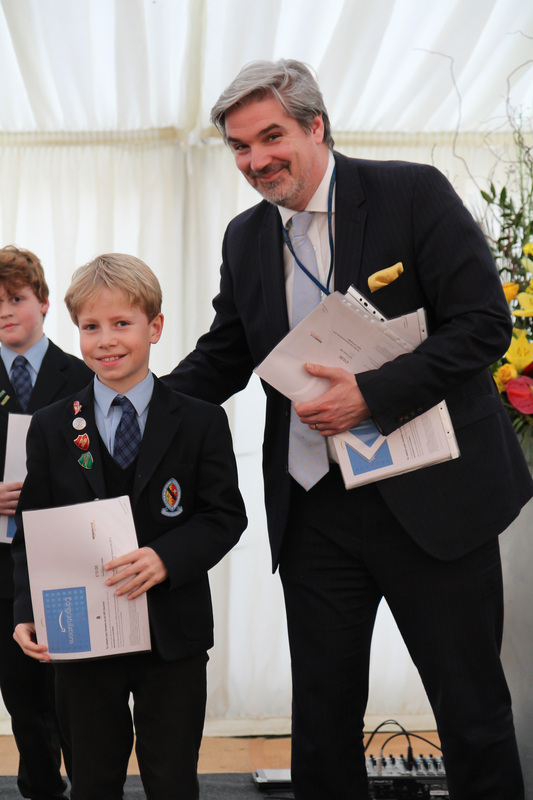 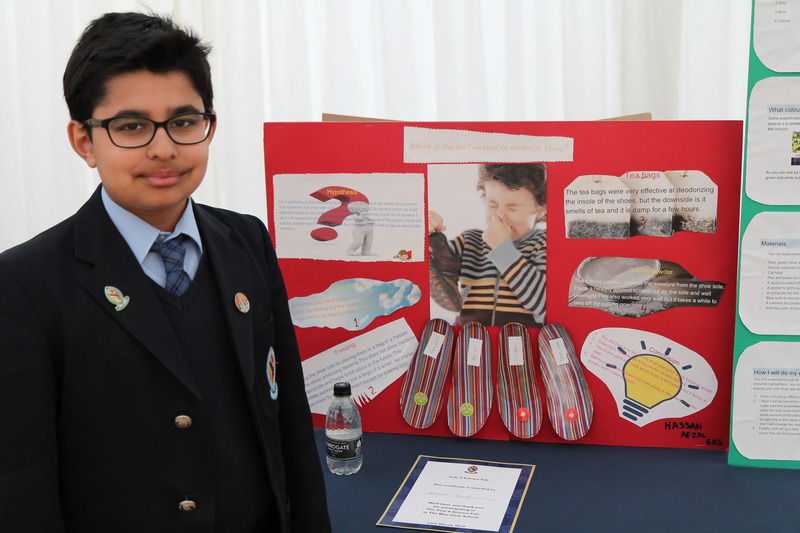 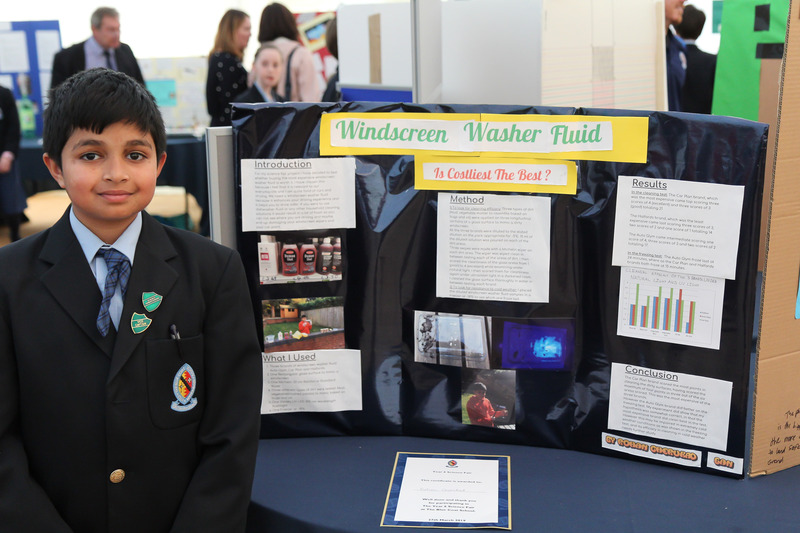 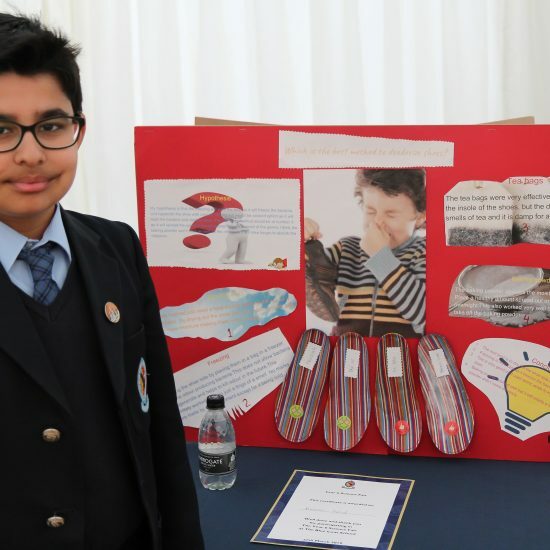 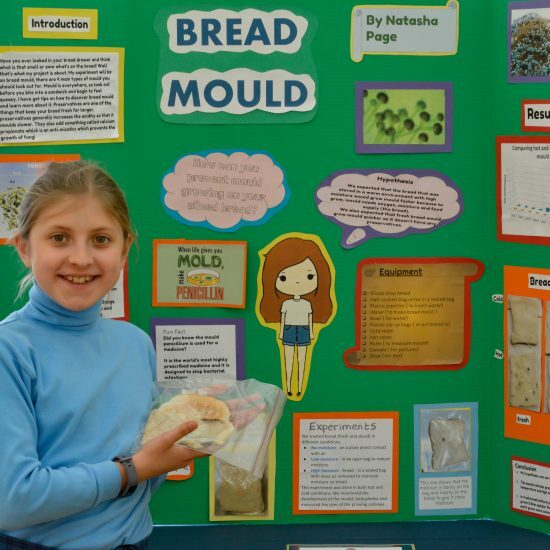 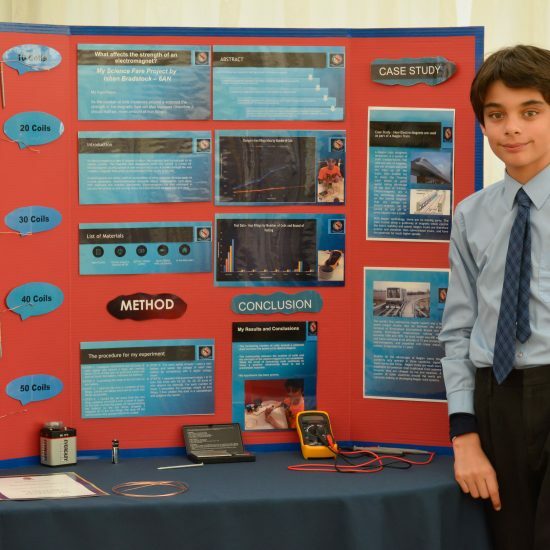 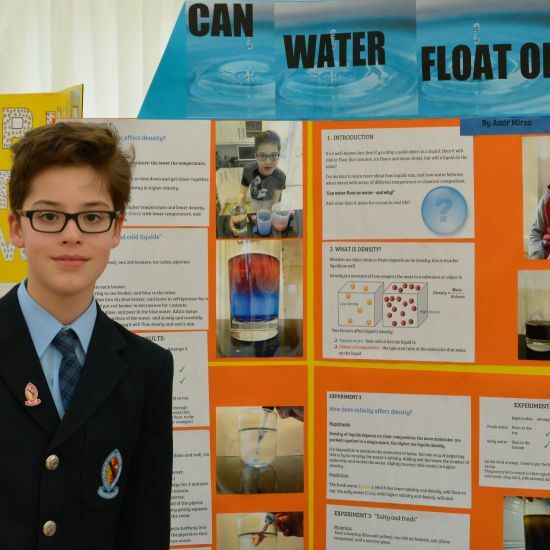 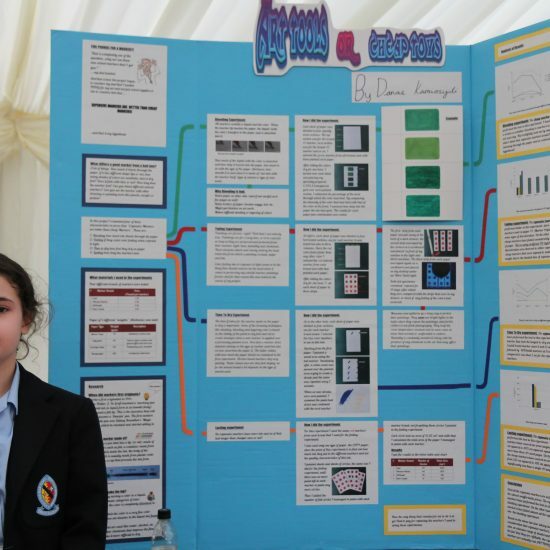 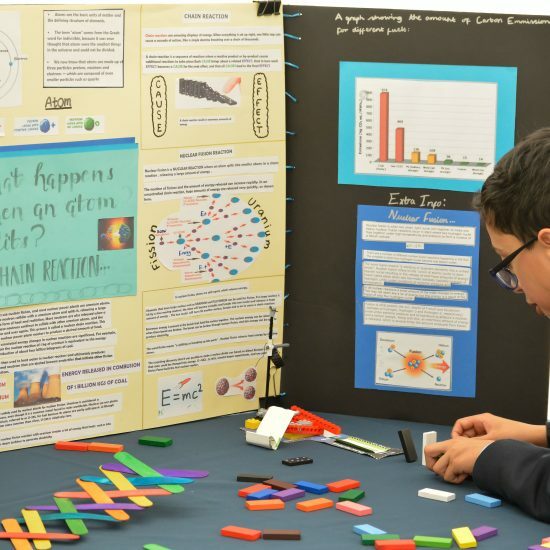 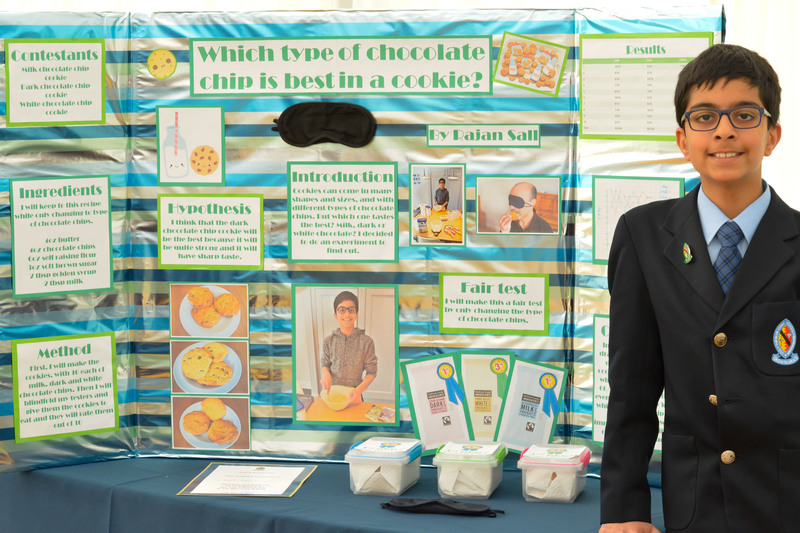 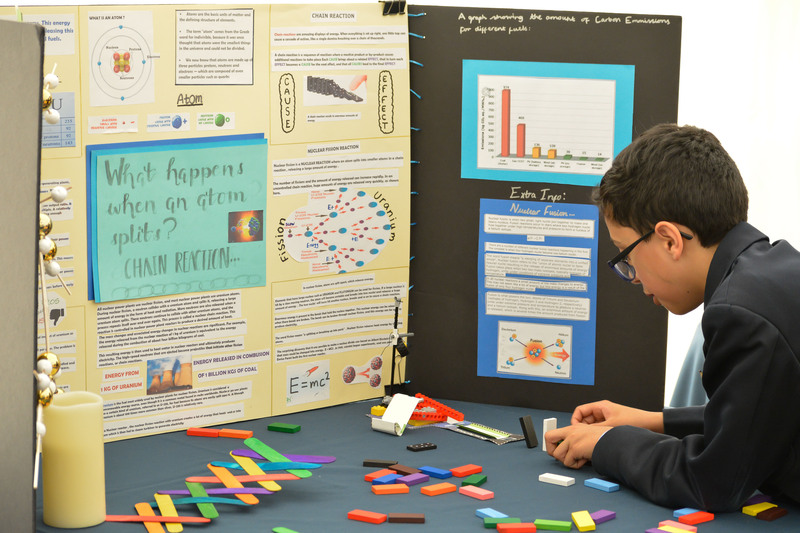 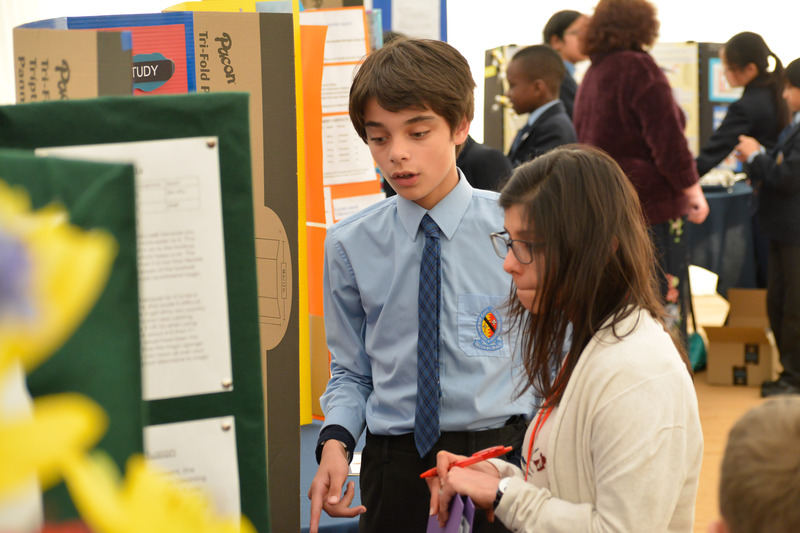 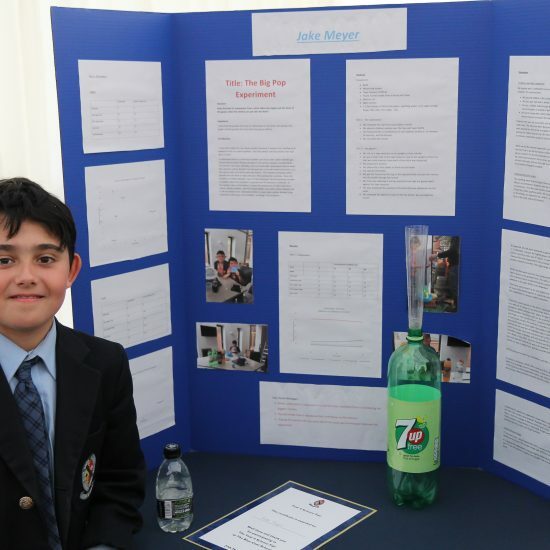 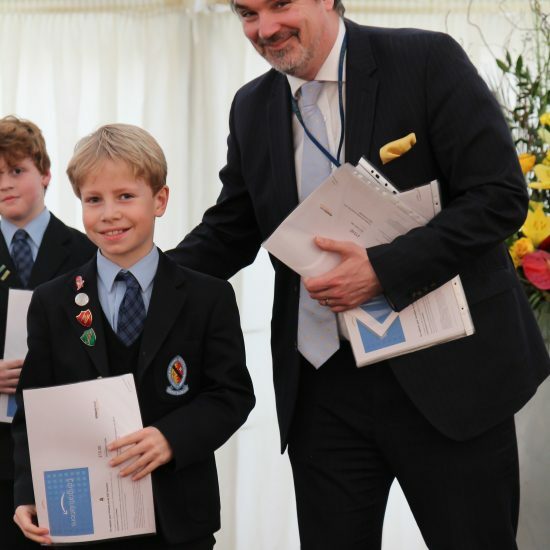 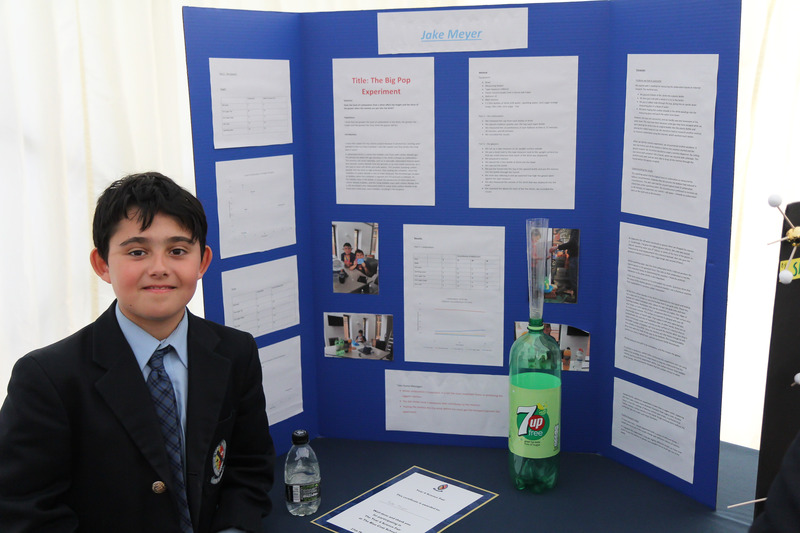 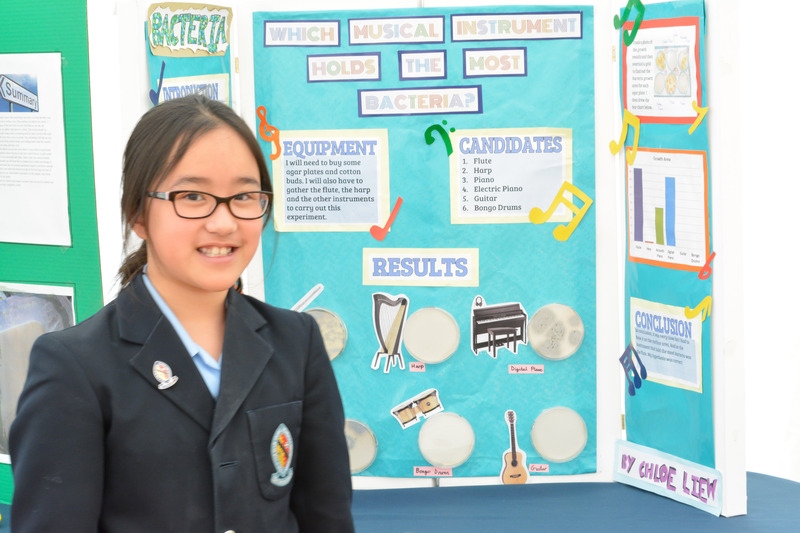 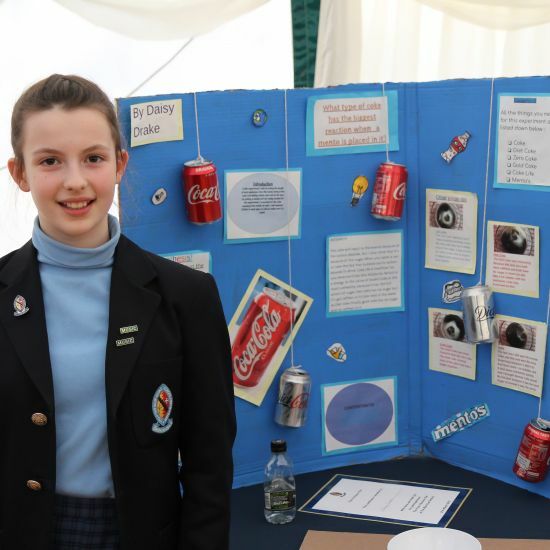 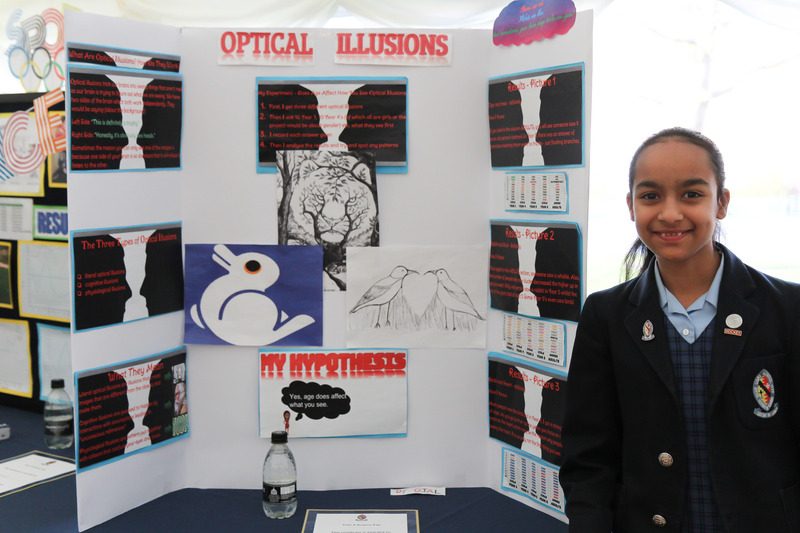 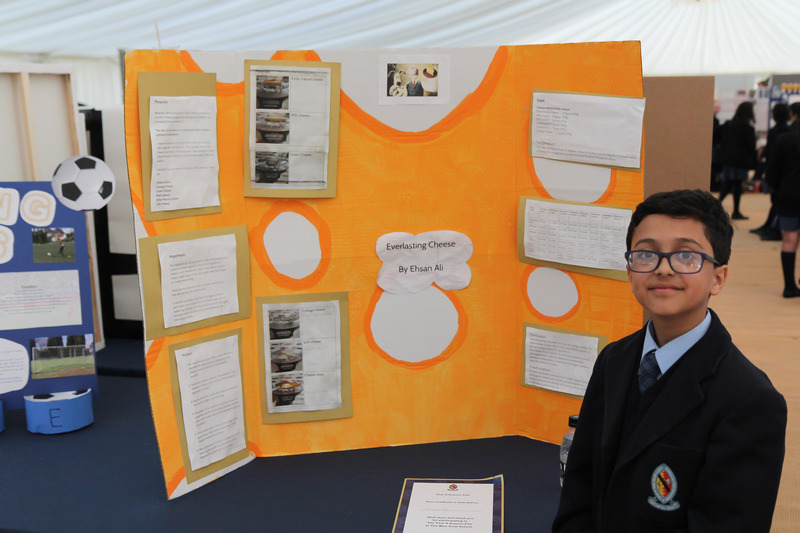 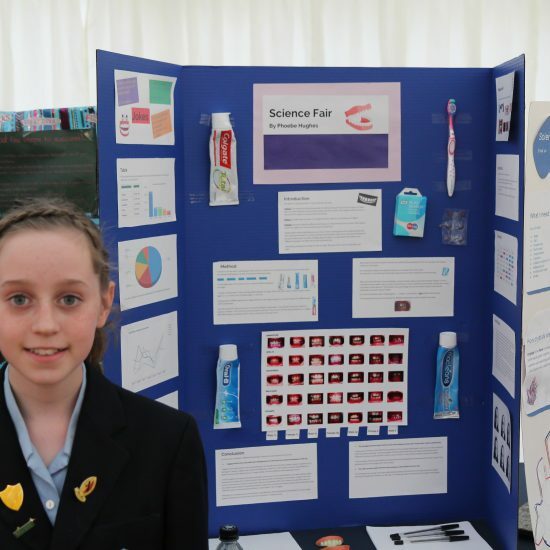 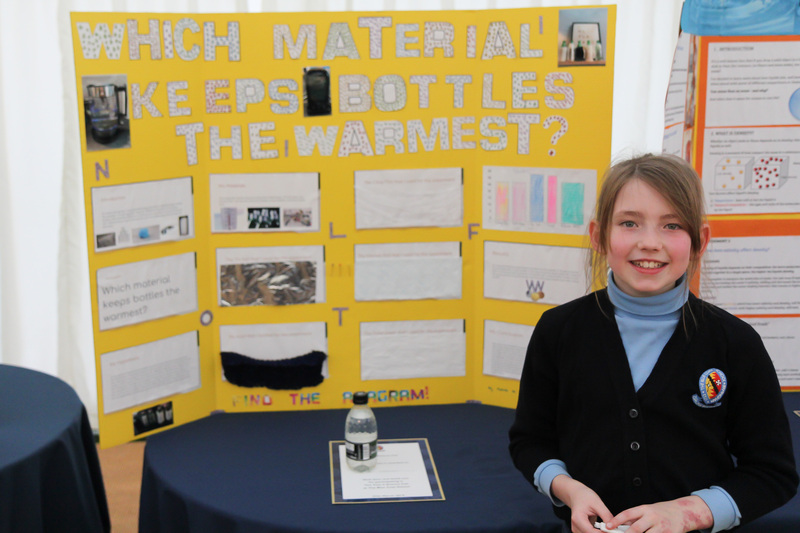 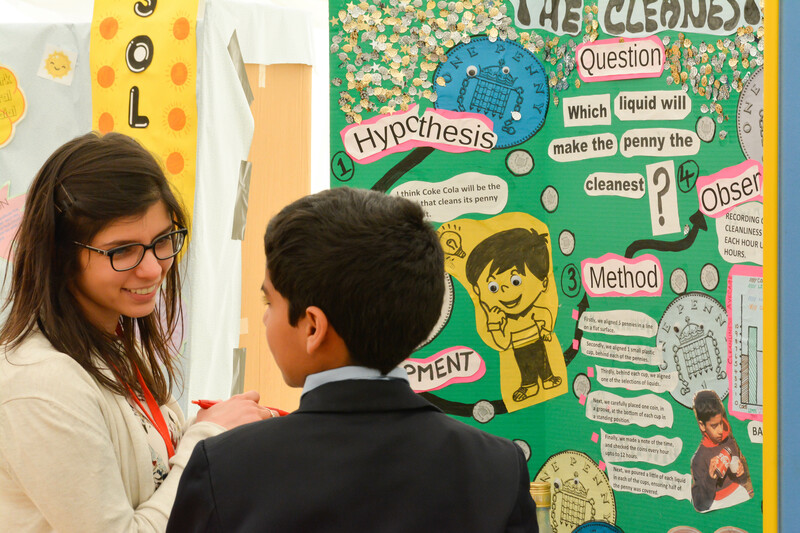 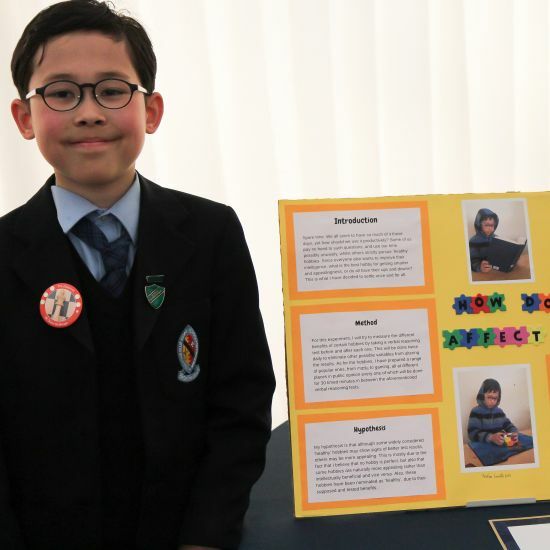 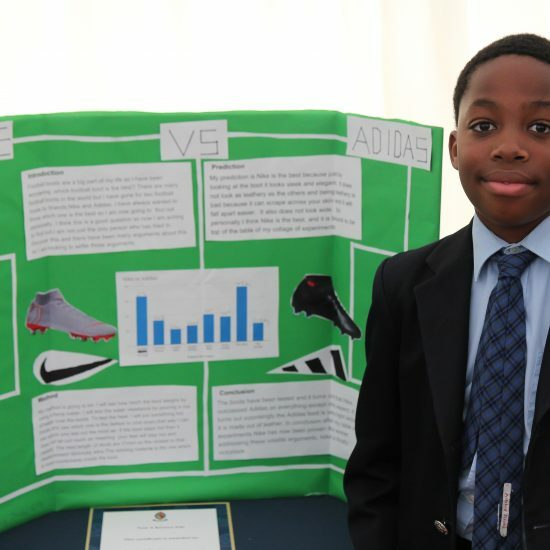 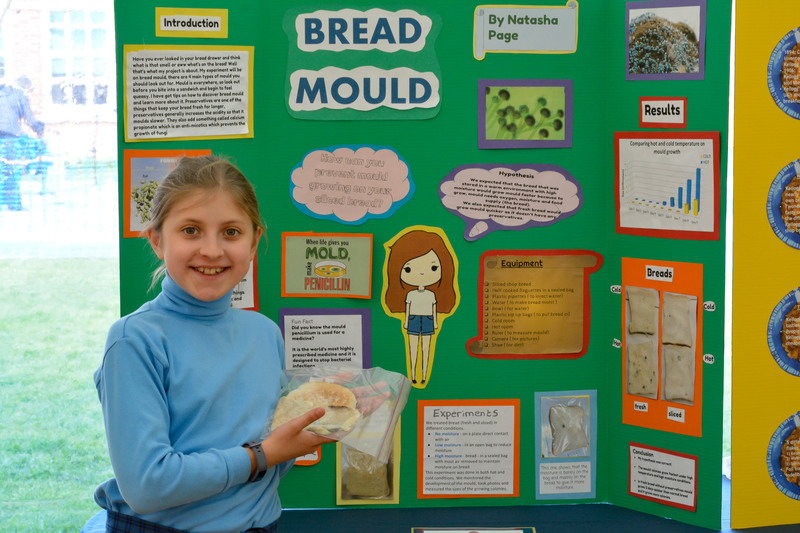 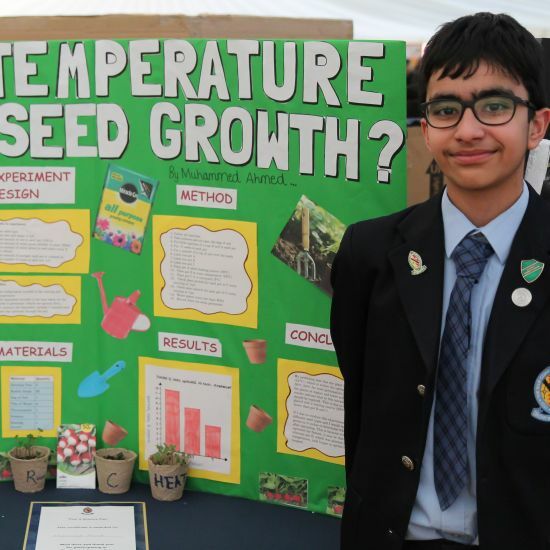 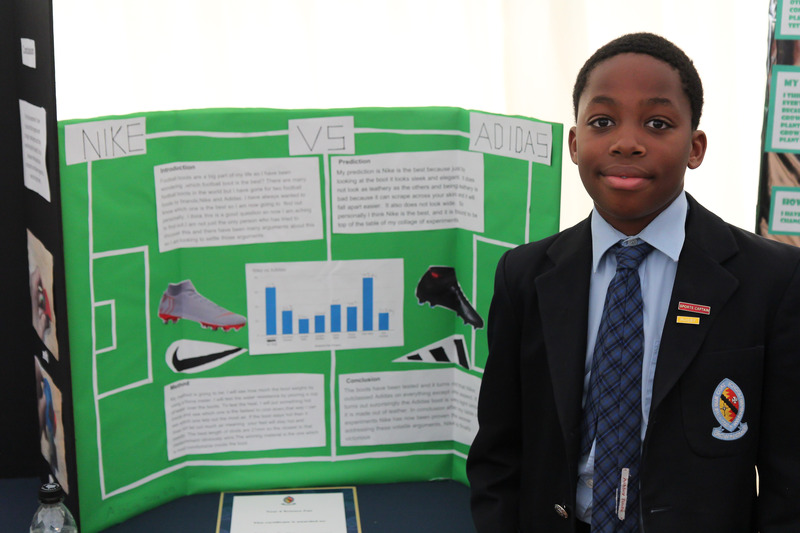 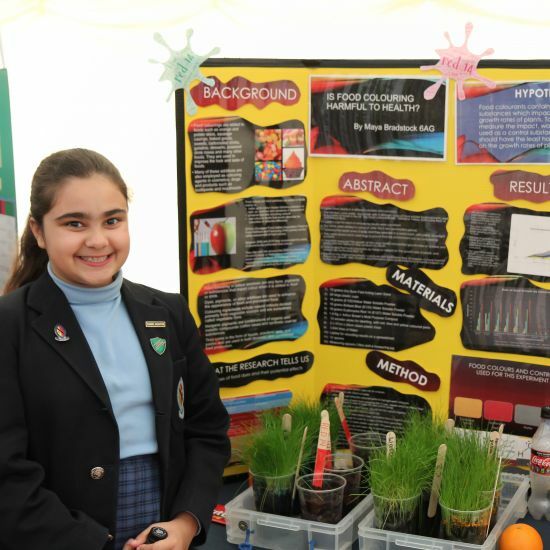 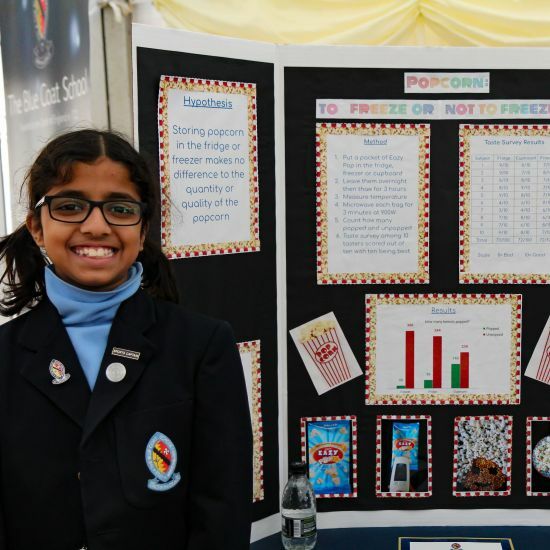 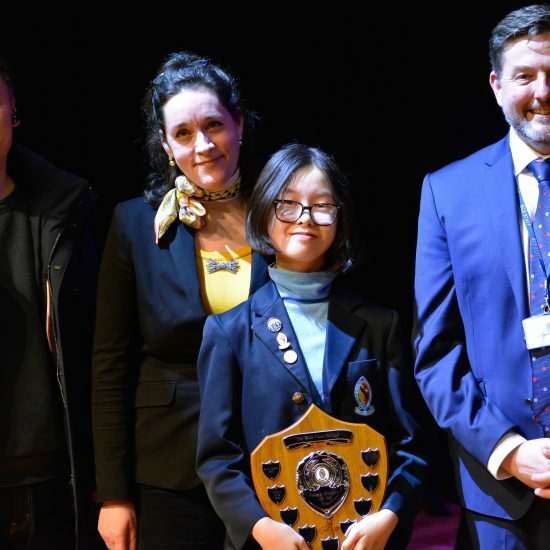 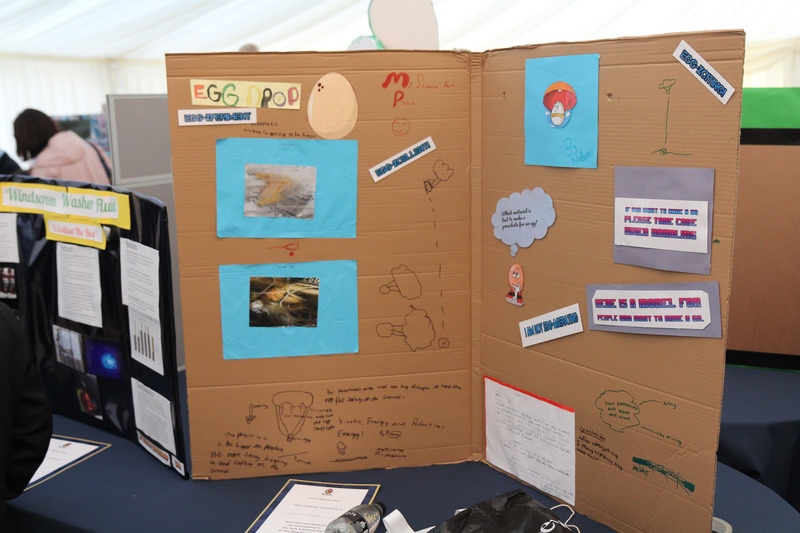 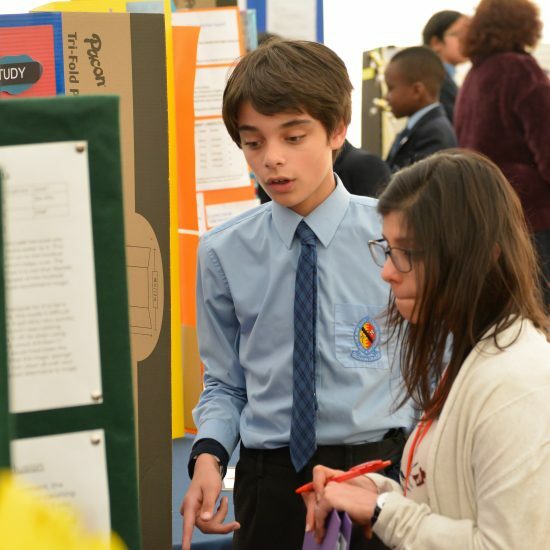 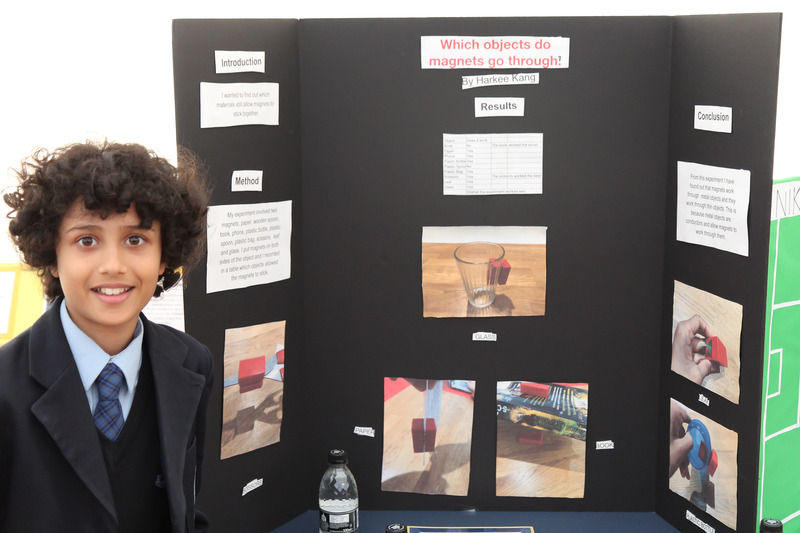 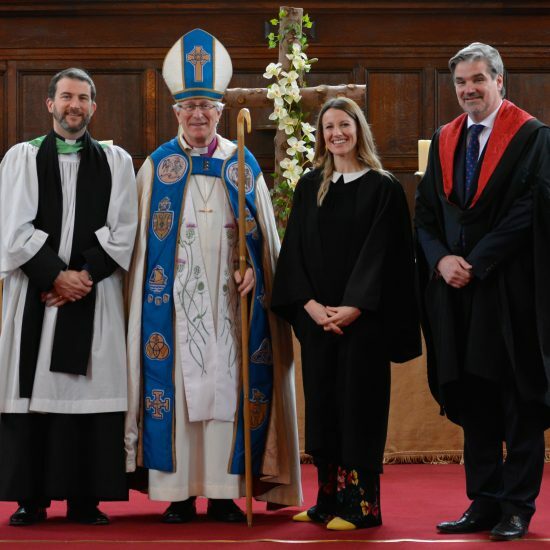 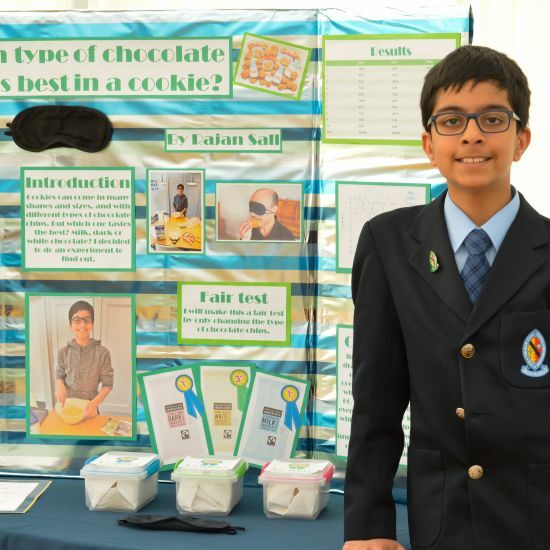 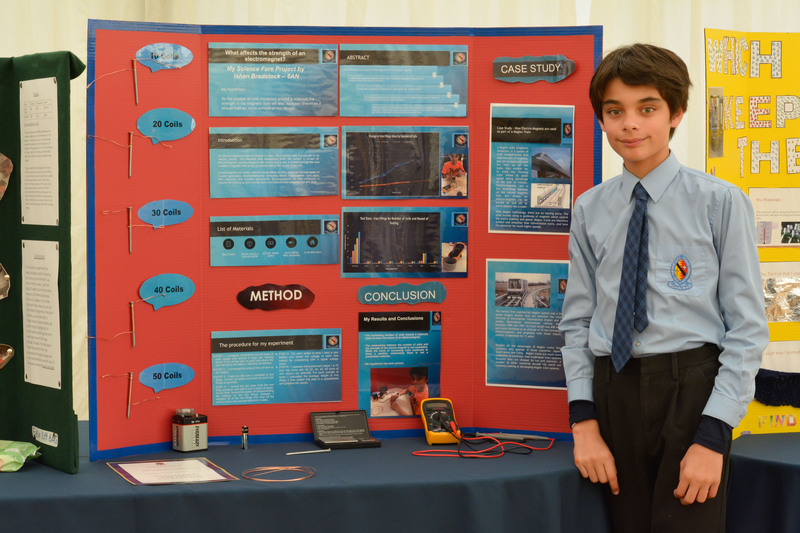 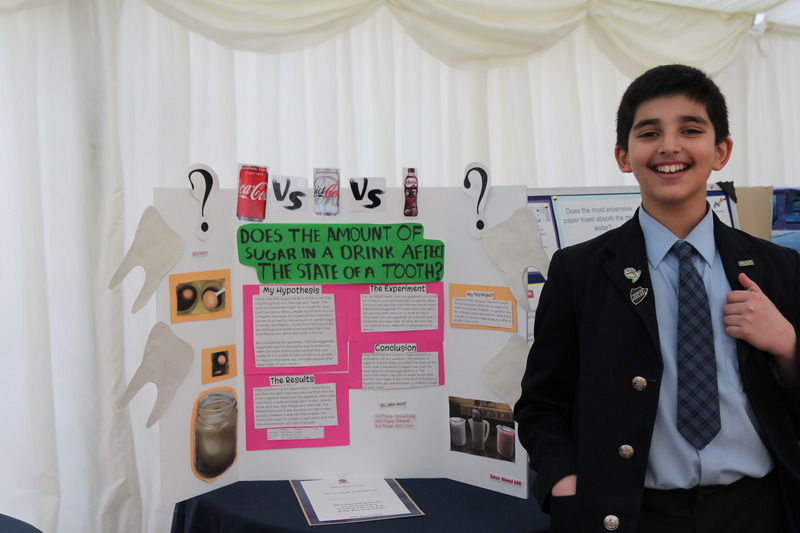 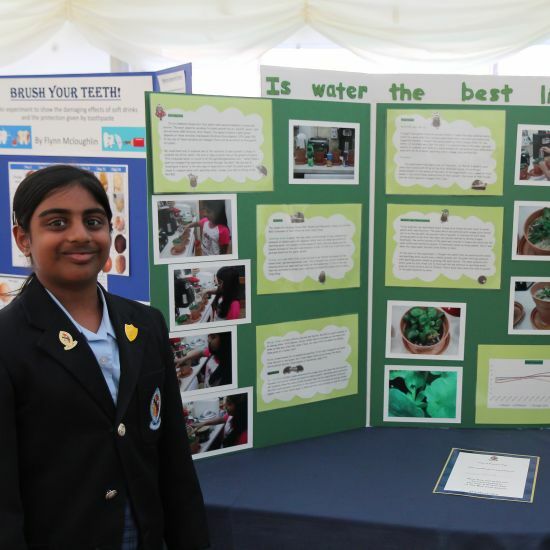 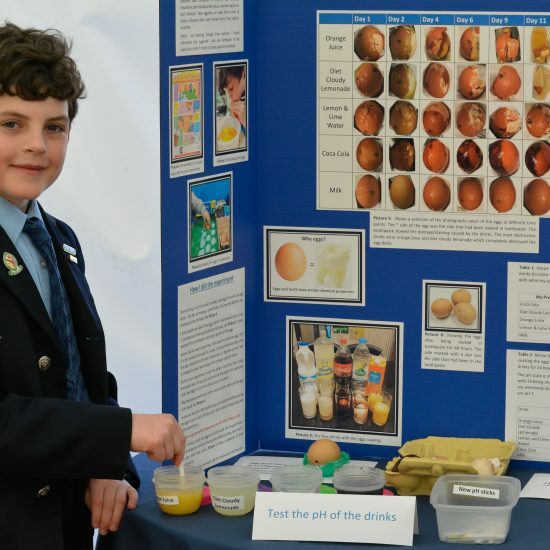 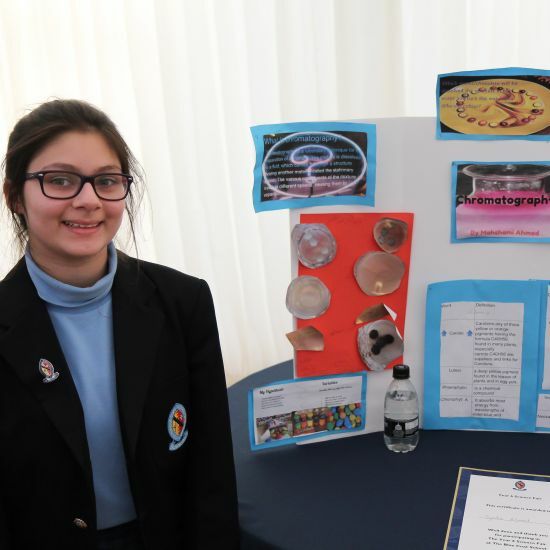 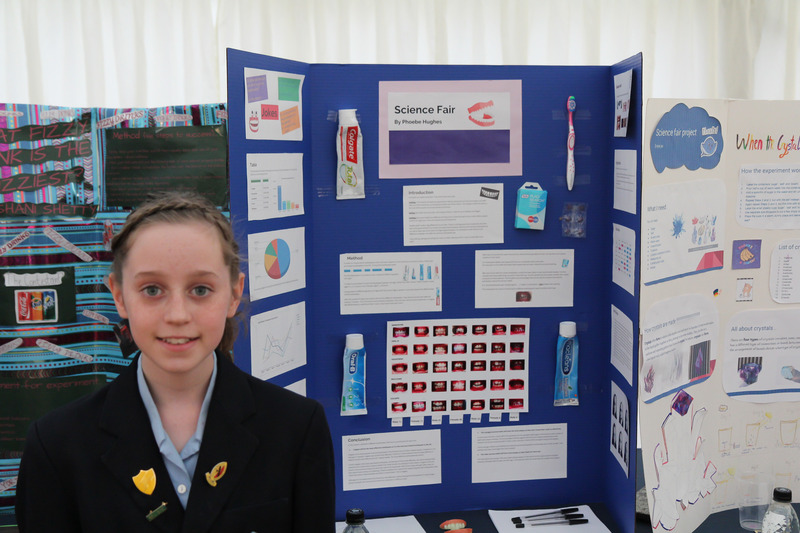 According to the judges, the winner spoke with ‘particular enthusiasm and clarity, demonstrating a complete understanding of all of the scientific principles involved’. 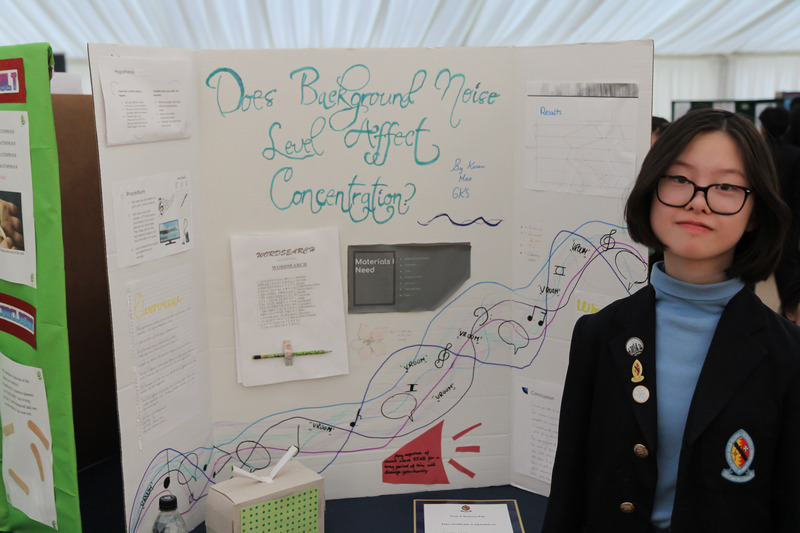 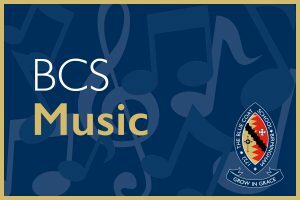 Highly Commended: Amelie Black, William Cowley, Phoebe Hughes, Danai Karaiosifidi, Chloe Liew, Karen Mao, Gracie Roberts and Luca Romano. 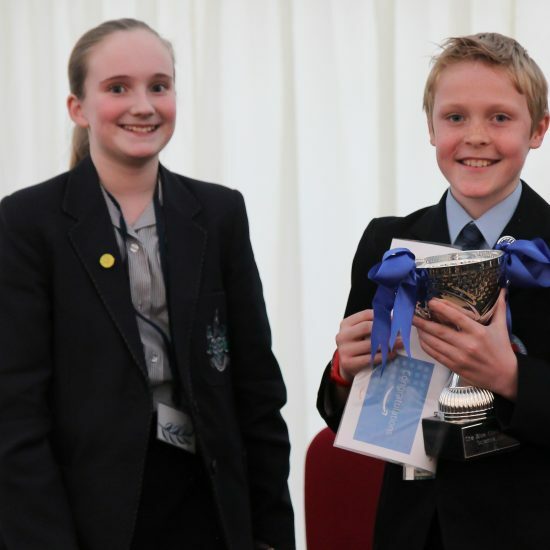 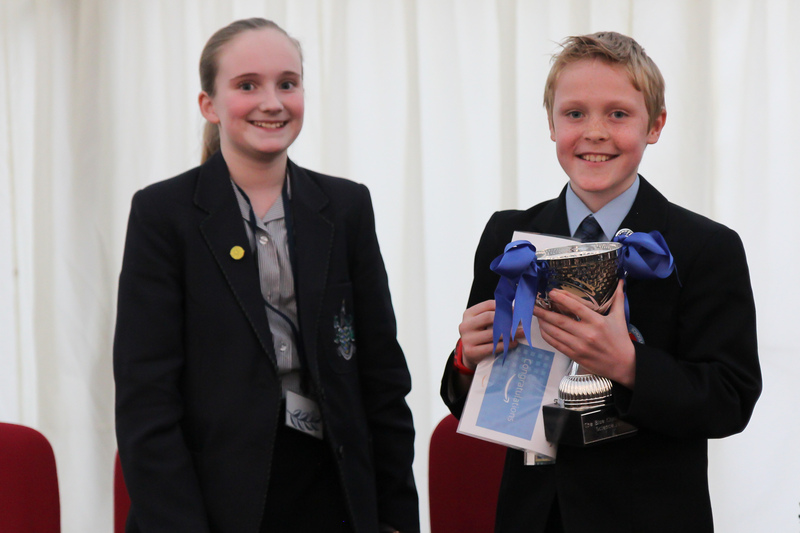 Isaac was presented with the Science Fair trophy by the 2018 winner, May Hadley. 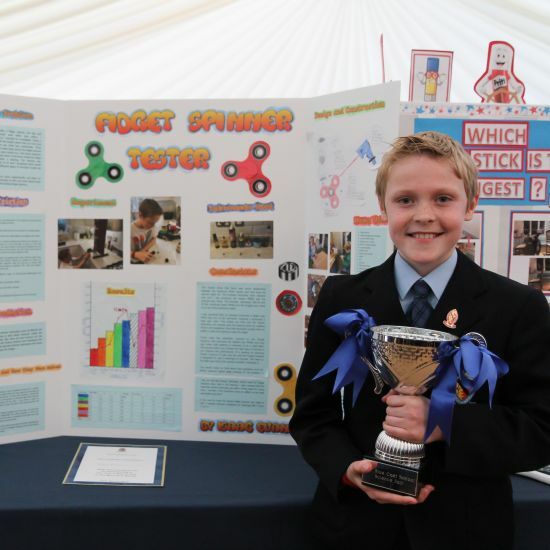 Isaac’s project involved a variety of experiments on bearings and lubricants to learn more about them and determine what makes the fastest fidget spinner. 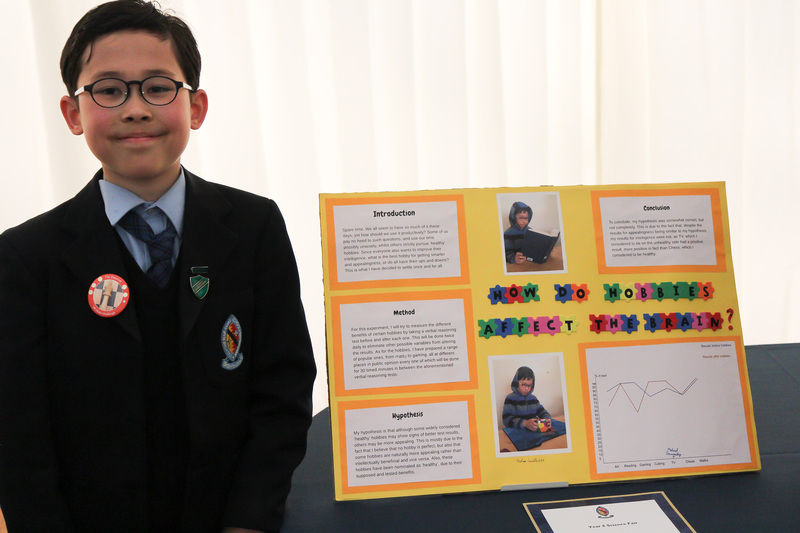 The Science involved was the Physics of Forces and specifically Friction. 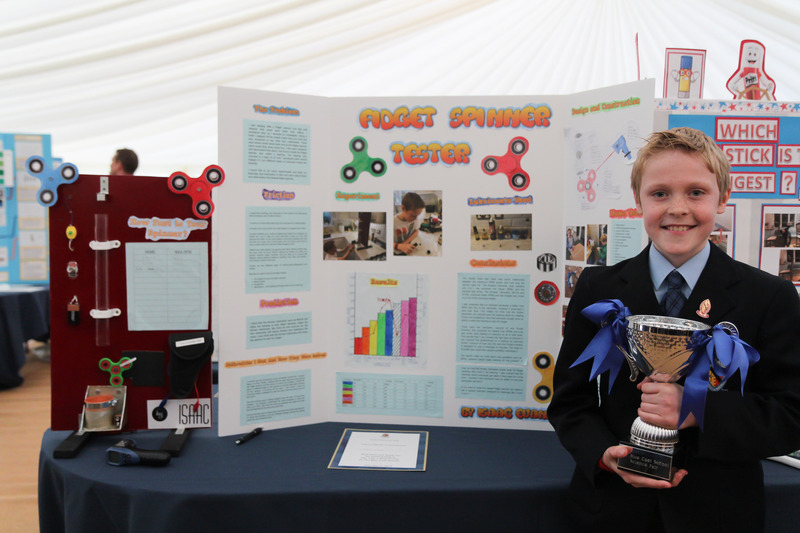 Isaac constructed a board holding a perspex tube, with an electromagnet above and a fidget spinner positioned below. 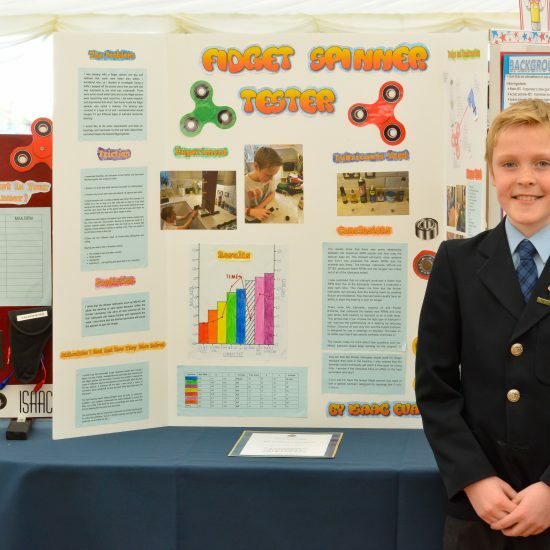 When the switch was turned off, the electromagnet released the bearing which dropped through the tube and hit the fidget spinner with an identical force each time. 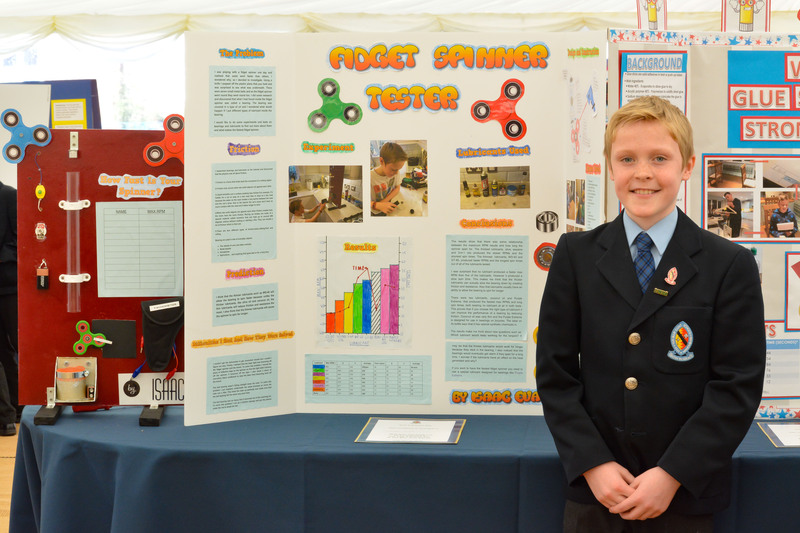 Isaac used a tachometer to determine the revolutions per minute (RPM) and the length of time the fidget spinner continued to spin. 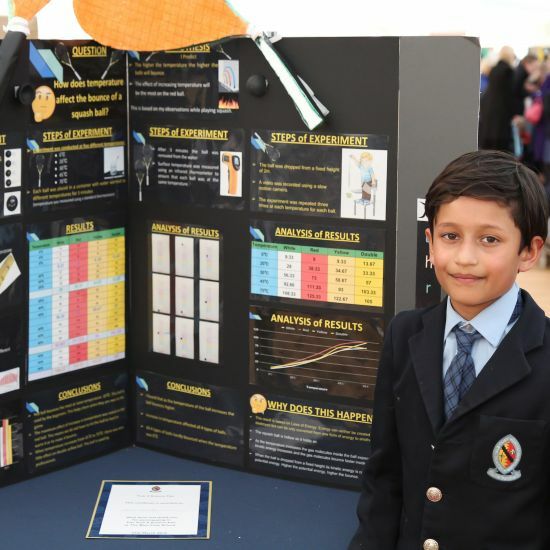 He repeated his tests three times, each with a different type of lubricant, and then determined the mean RPM and length of spin for each lubricant. 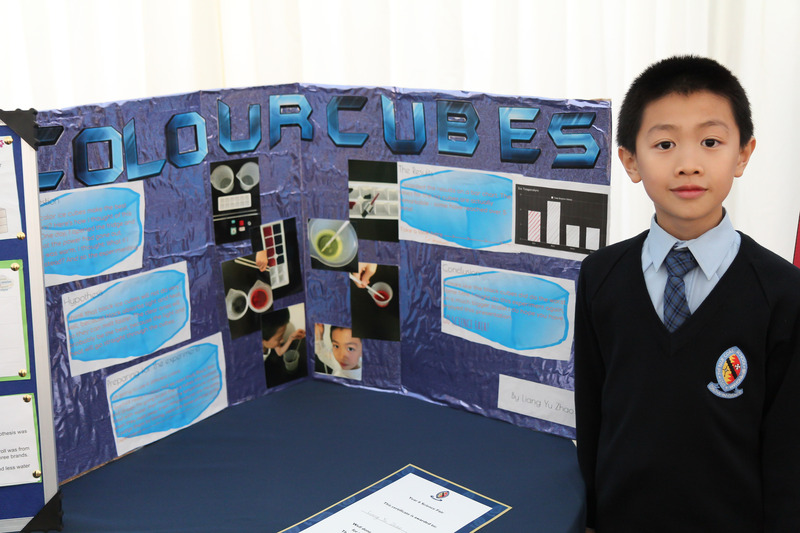 Isaac finished with logical conclusions, linking back to the Science involved. 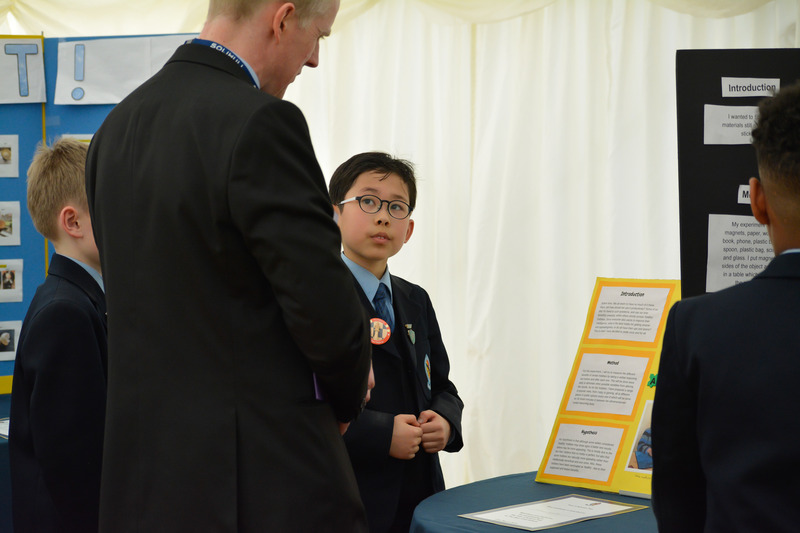 He also explained the difficulties he encountered during the project and how he resolved them. 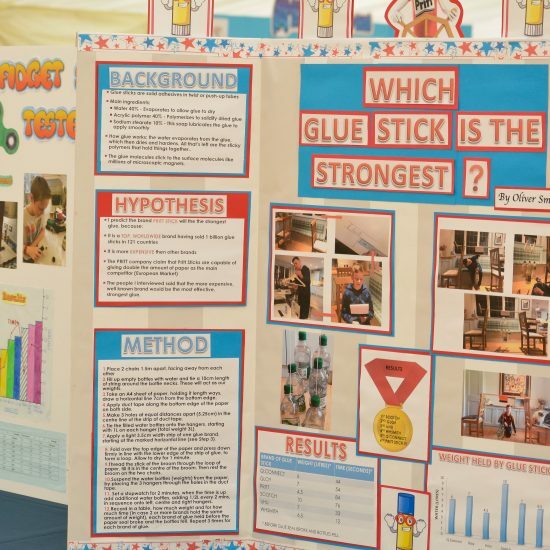 In the words of Isaac Newton, ‘What goes up must come down’ and The Science Fair of 2019 officially closed on Wednesday evening.